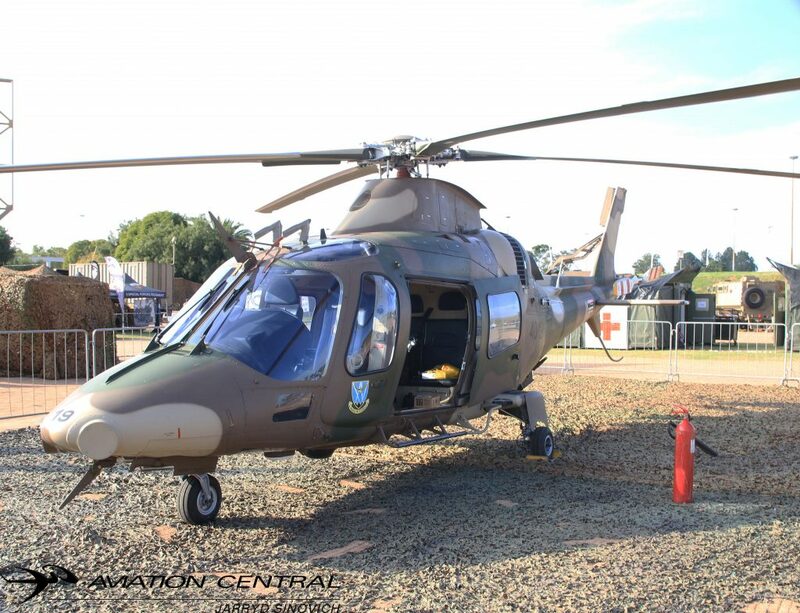 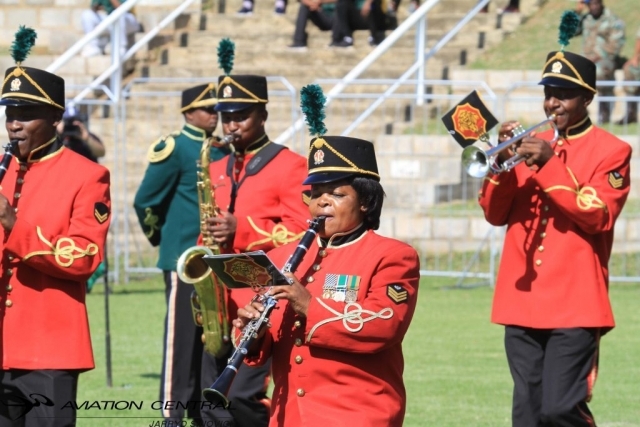 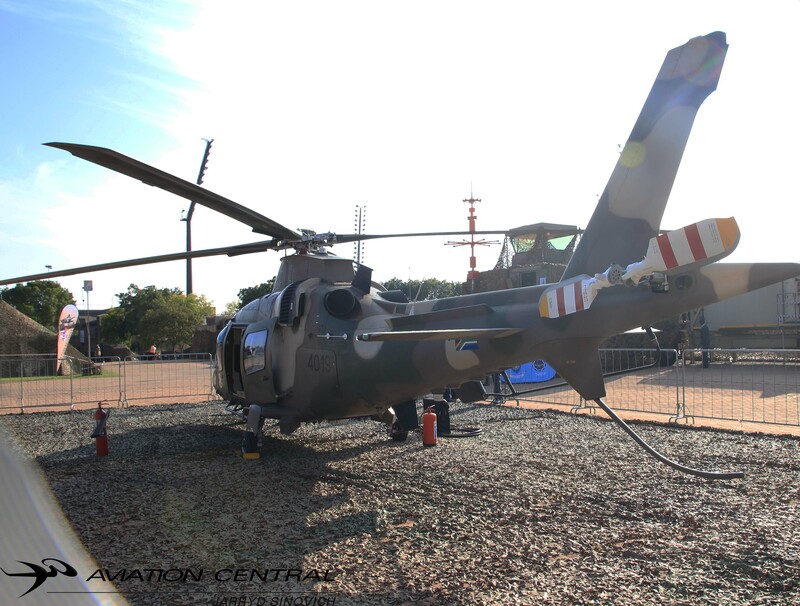 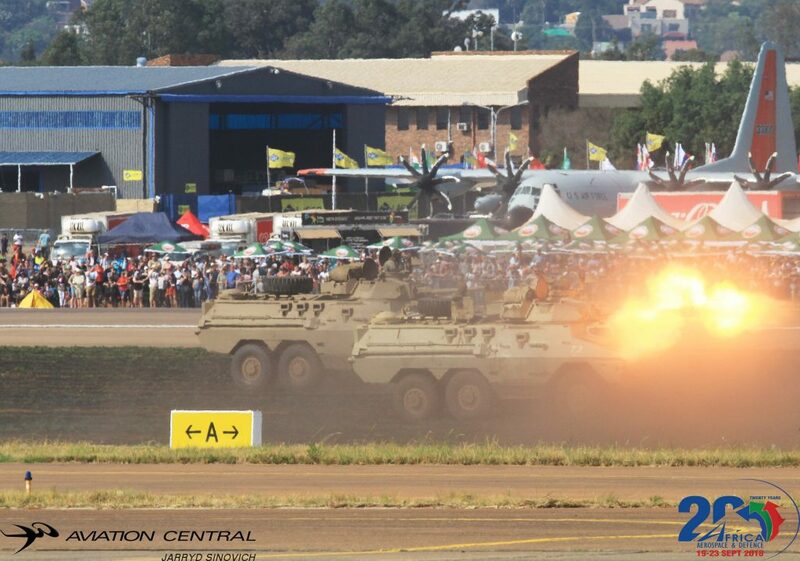 The 125th Rand Easter Show has once again entertained Gauteng residents with raw power of the South African National Defence with the South African Navy, Army, Airforce and Military Health Service all present at the Expo Centre Nasrec South of Johannesburg. The Capability demonstration was once again a major draw card to the Rand Show as it always is and run for the first four days of the opening of the show. 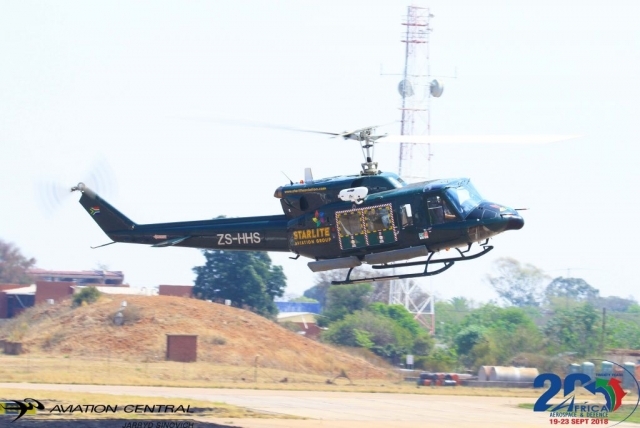 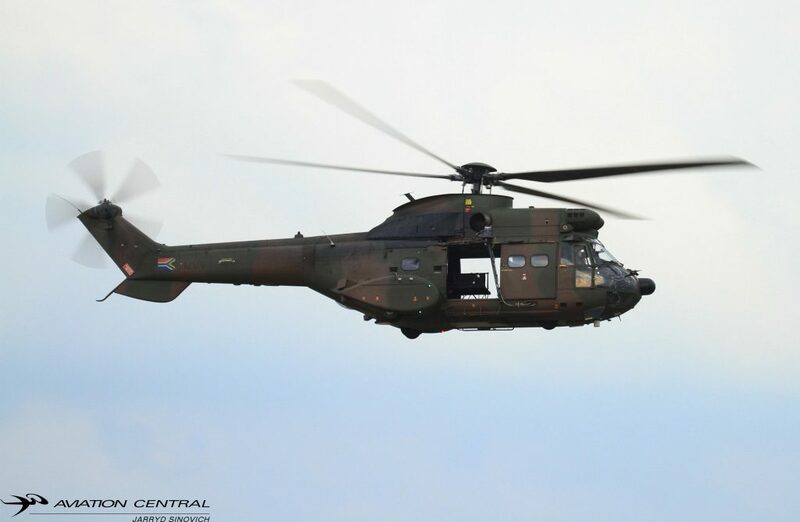 Unfortunately with the absence of South African Airforce helicopters as the choppers were still on operational duties in Mozambique and Malawi. We were blessed with great weather for the first 3 days of the event including the validation day before the opening of the event as their was predicted rain showers and overcast weather for the duration of the morning shows. 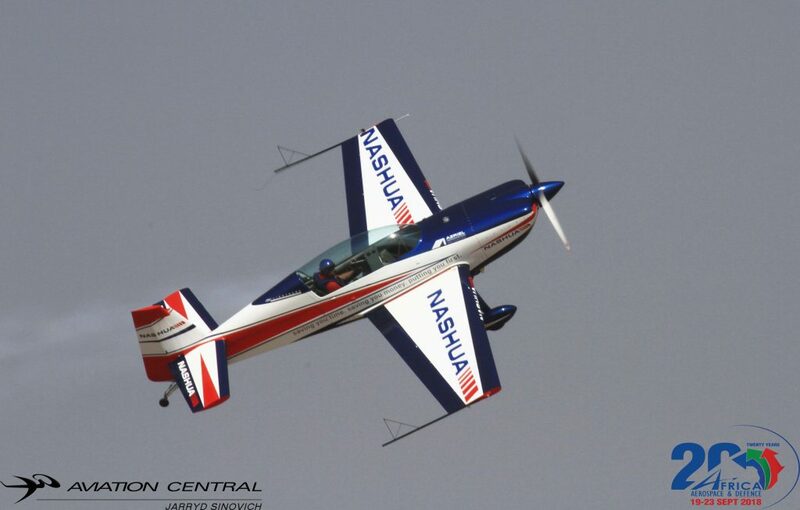 The final day was unfortunately rained out. 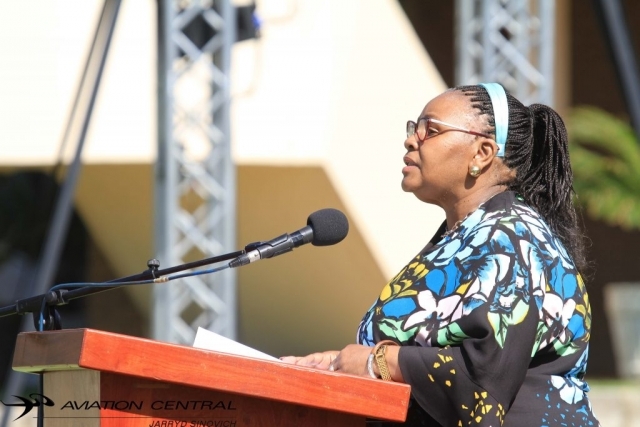 Nosiviwe Noluthando Mapisa-Nqakula arrived on the podium to address the public on the official opening of the Rand Easter Show 2019. 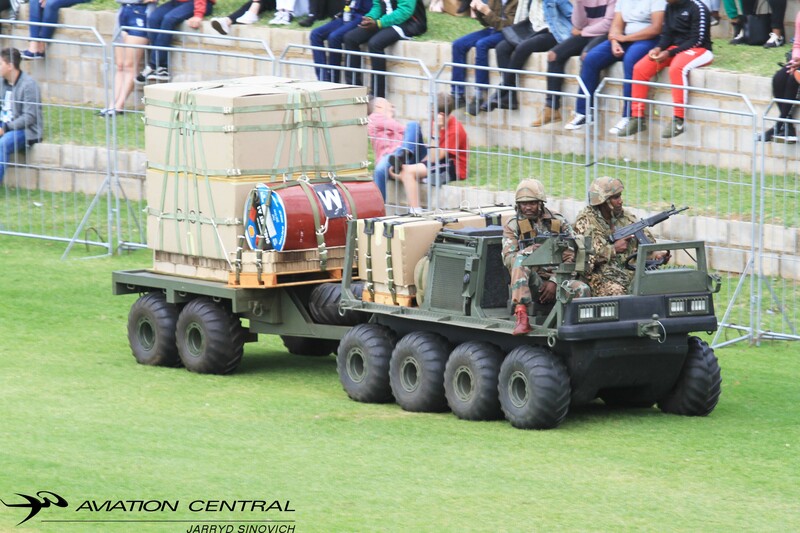 The capability demonstration se the theme this year as a deployment of reaction forces to support a convoy ambushed in a foreign territory. 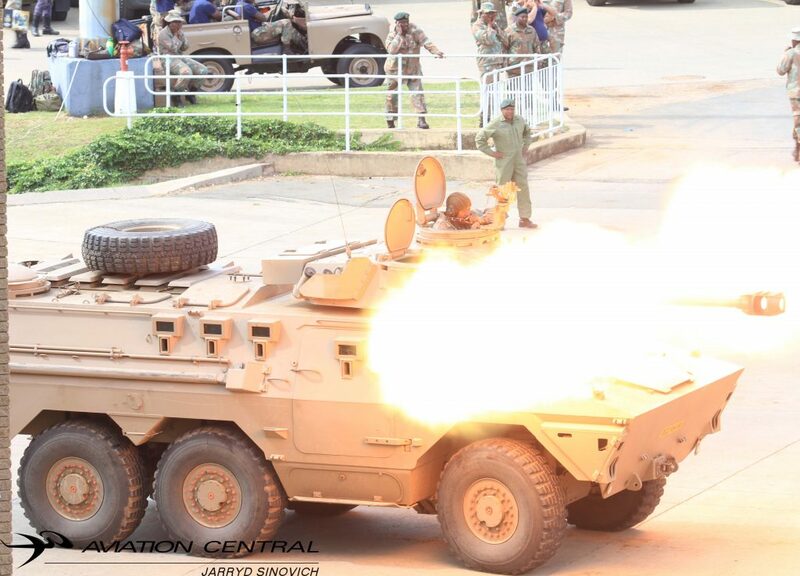 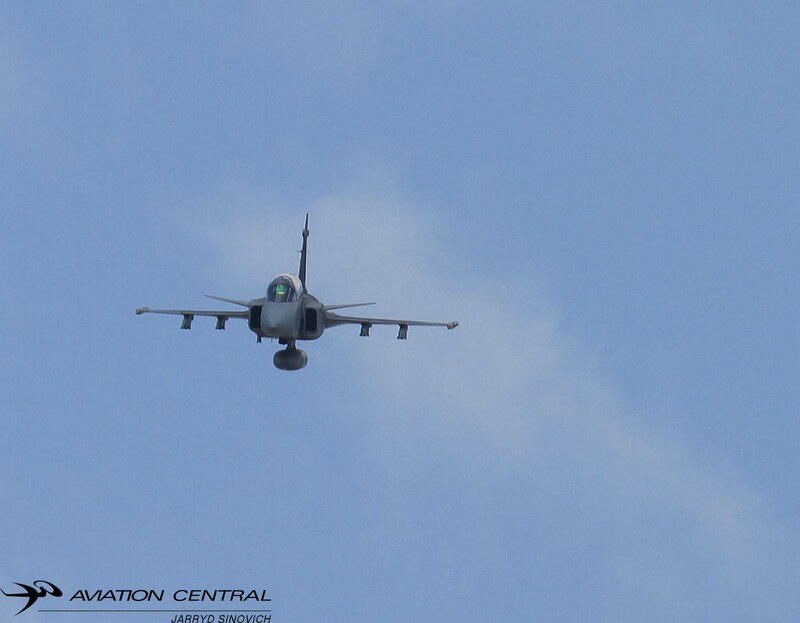 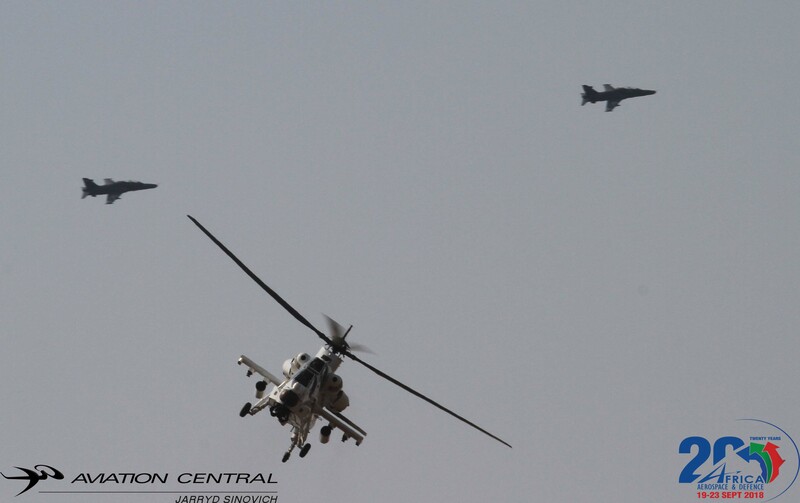 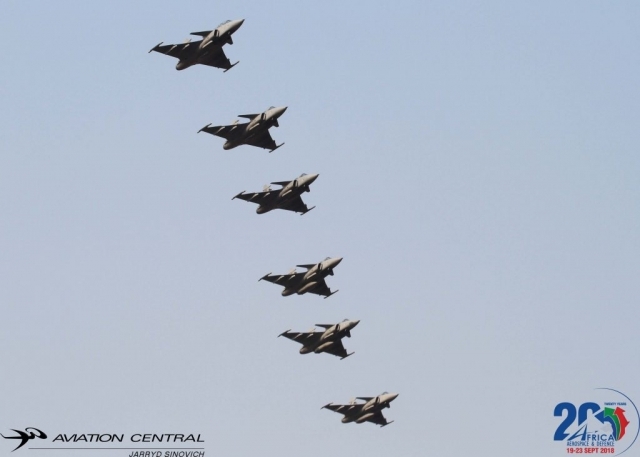 Two Ratel 90 ammoured vehicles gave support fire power as well as a lone 2 Squadron Gripen with simulated airstrikes. 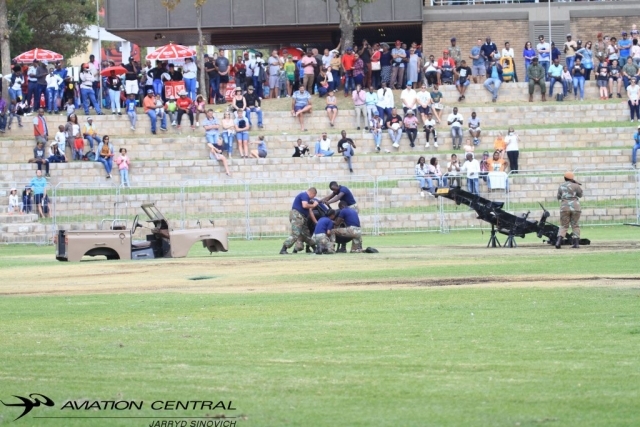 Simulated mortar strikes echoed in the arena as the crowds were awered of the pyrotechnics set off by the army engineers. All while this was happening a bridge laying was complete during the mock attack. dropped skydivers from 44 parachute battlion with a designated landing zone in the arena. 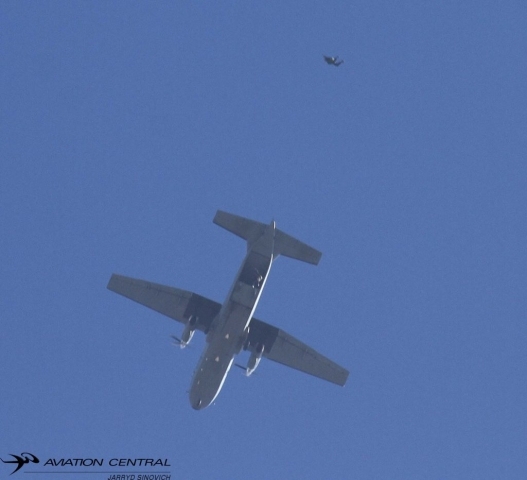 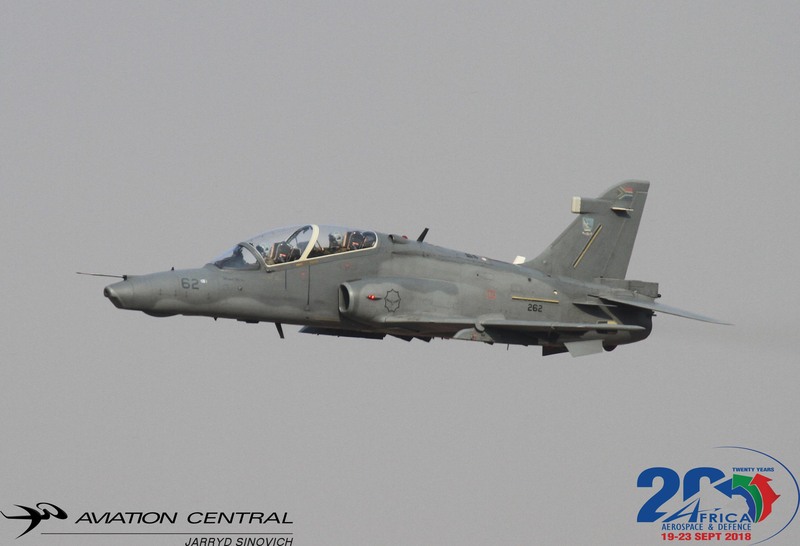 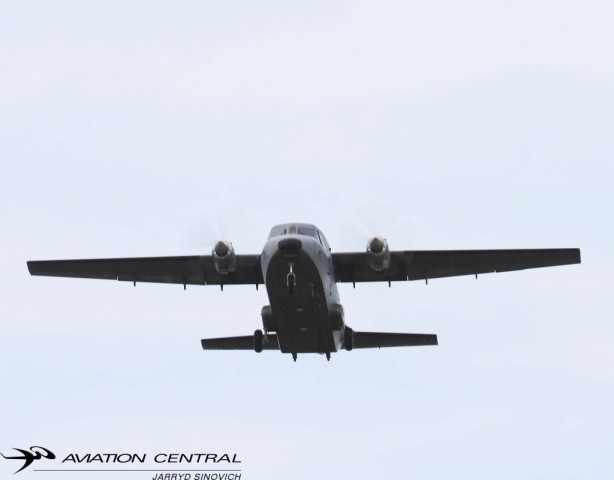 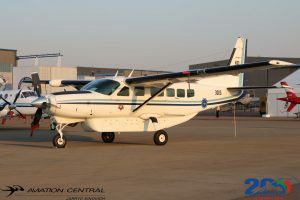 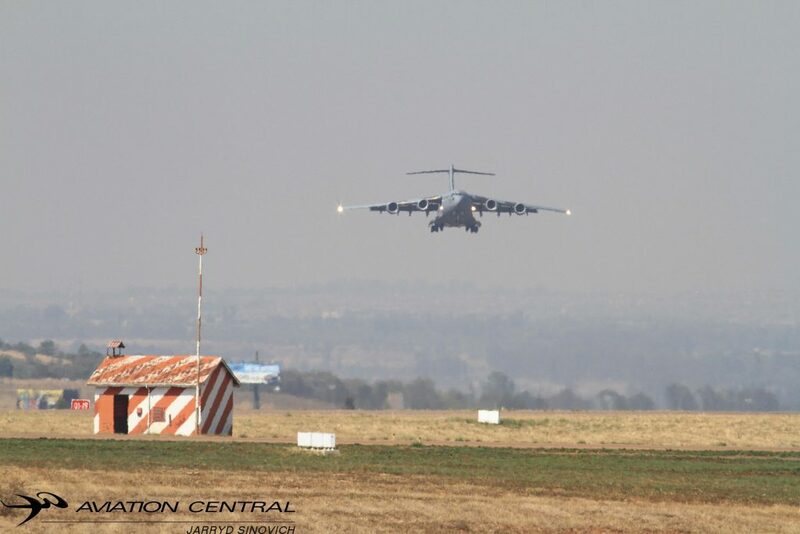 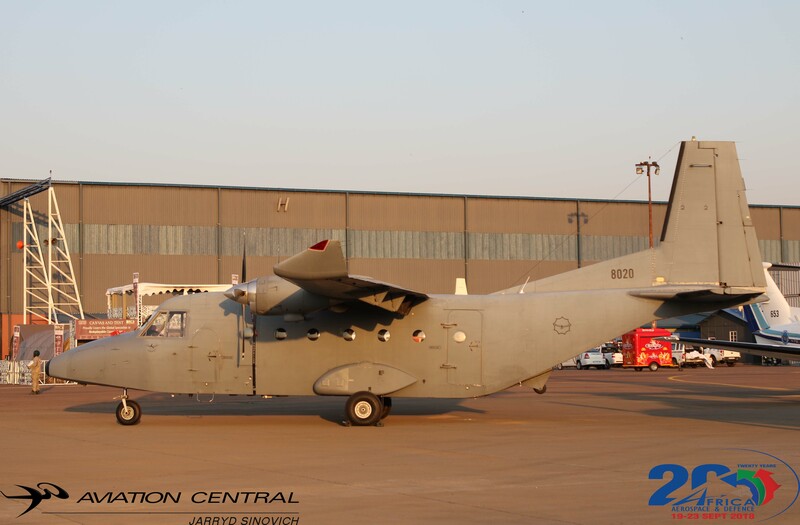 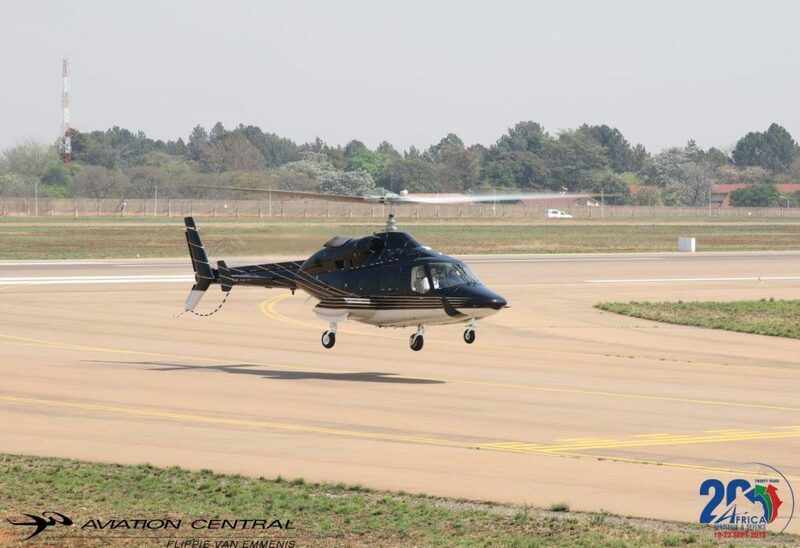 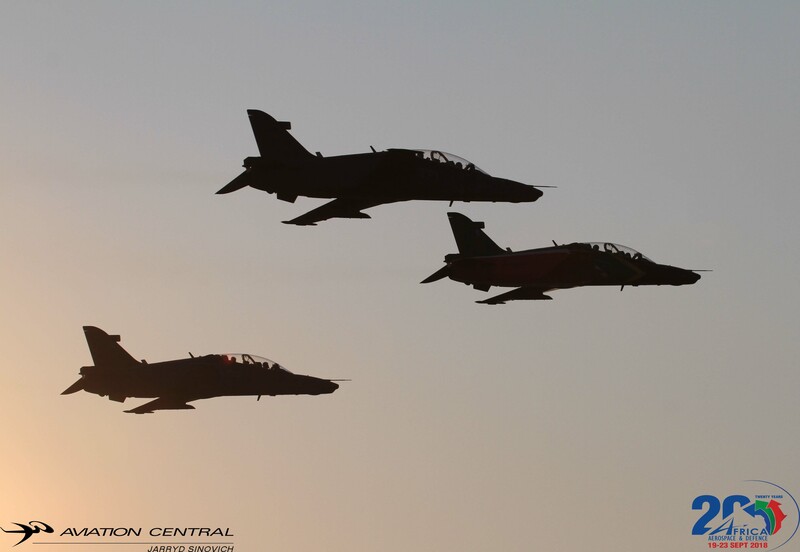 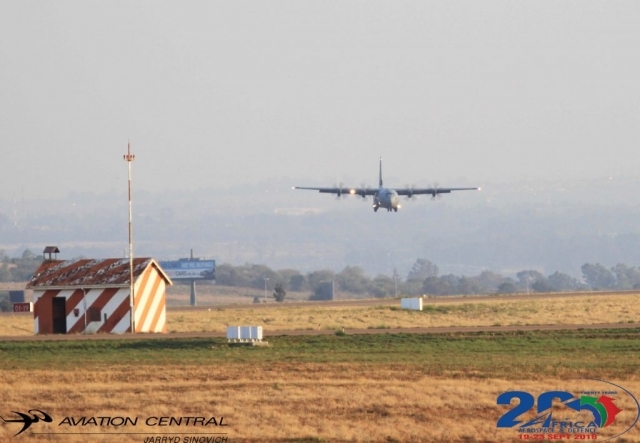 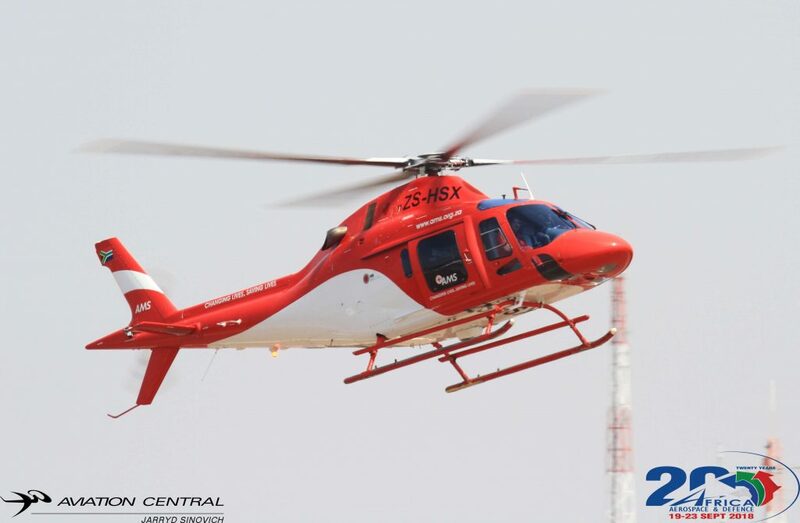 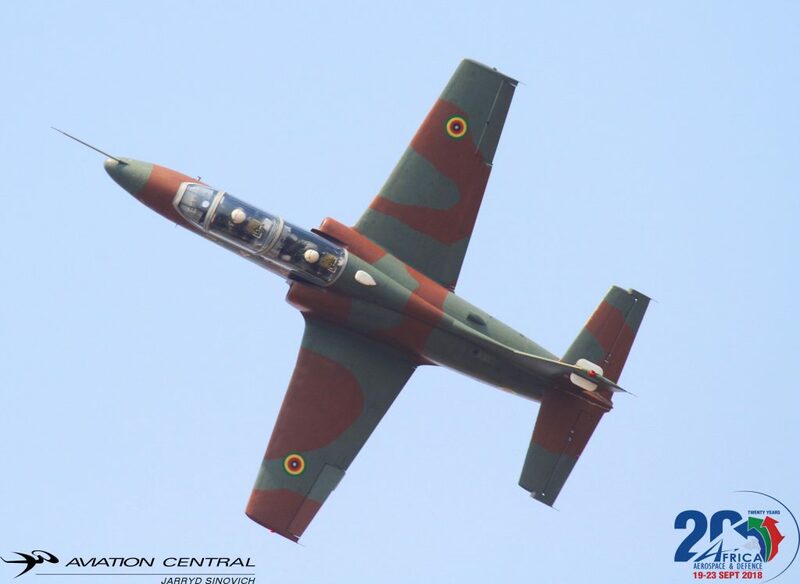 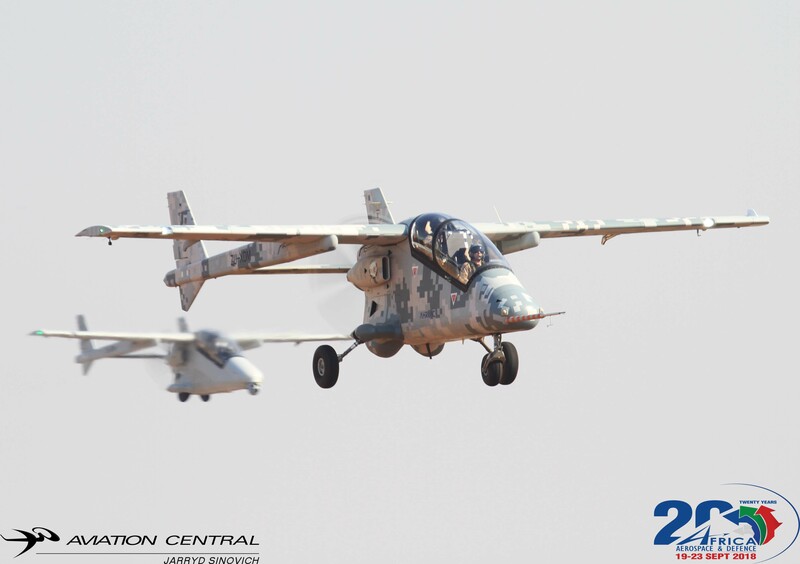 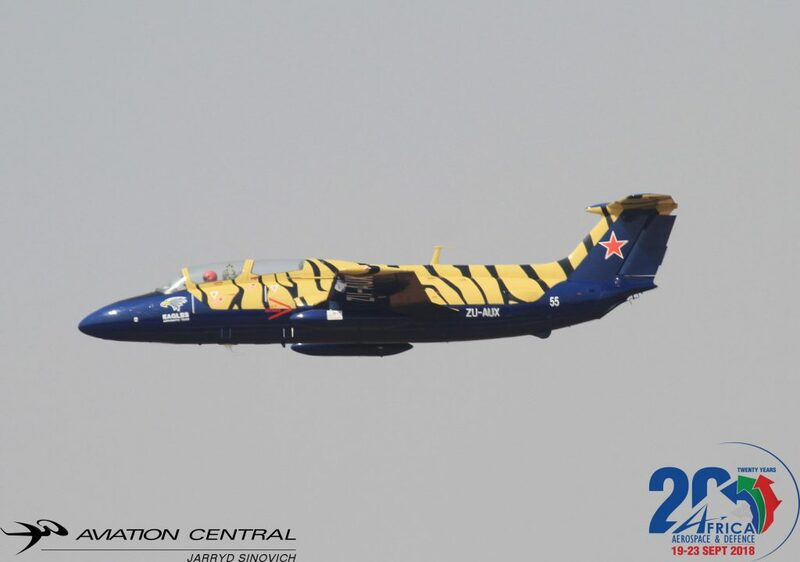 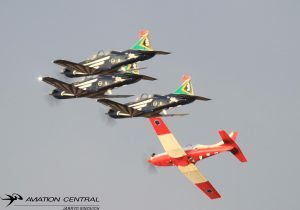 The Casa 212 then gave a beautiful fly past over the arena as they excited the special rules west area of Johannesburg. 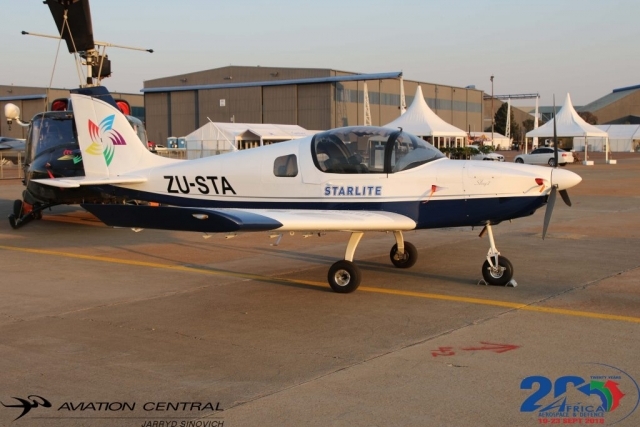 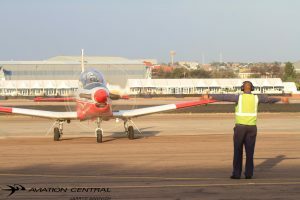 The cockpit ambassadors of the South African Airforce, Silver Falcons of team 82 led by Major Omphile Matloane, Tiaan Stander, Corne Deventer, Bheki Shabangu and the soloist Major Sivu Tangana flew their 5 ship Pilatus PC7MKIIs. 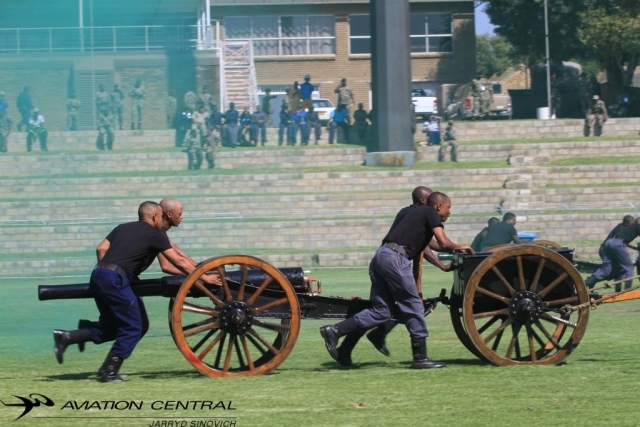 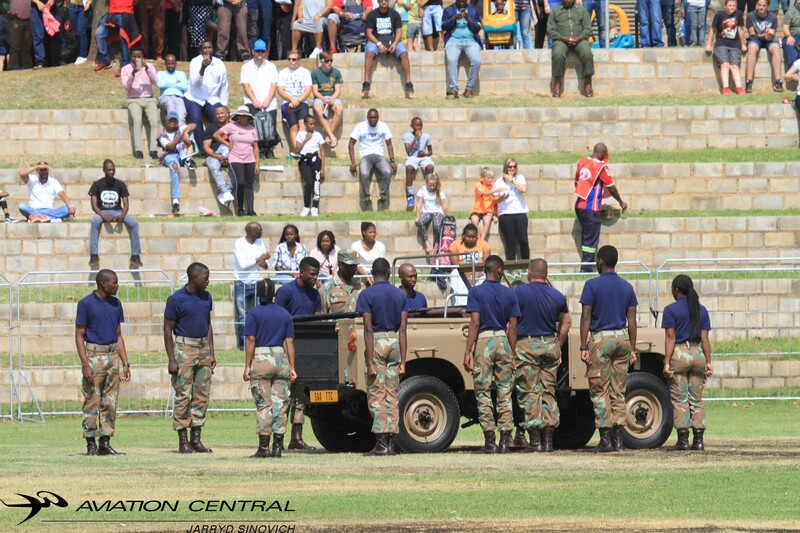 Other arena events on the program included presion drills from the SA Army and Navy. 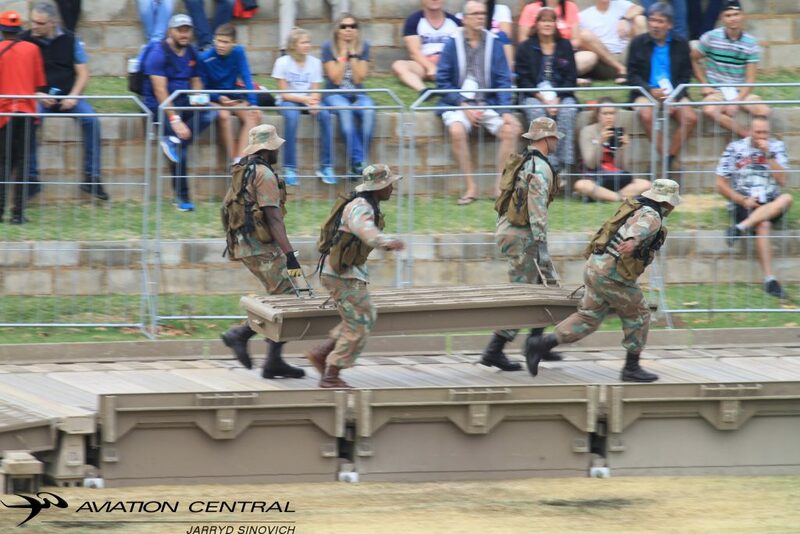 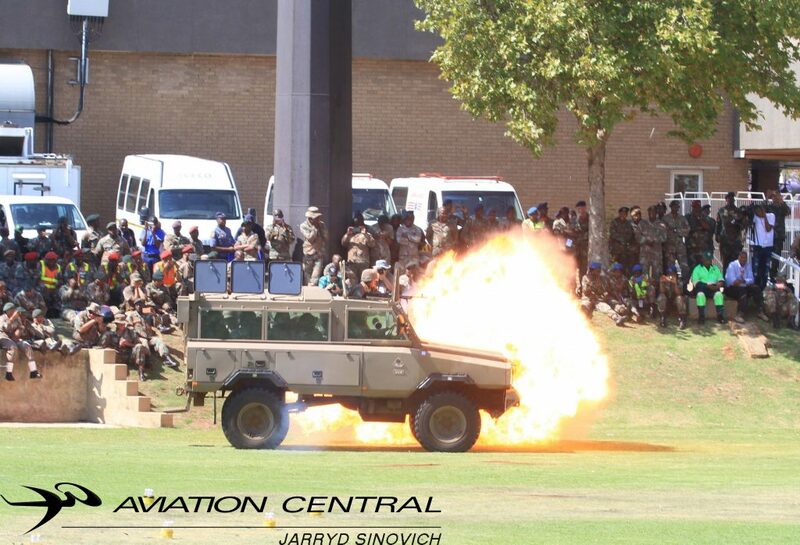 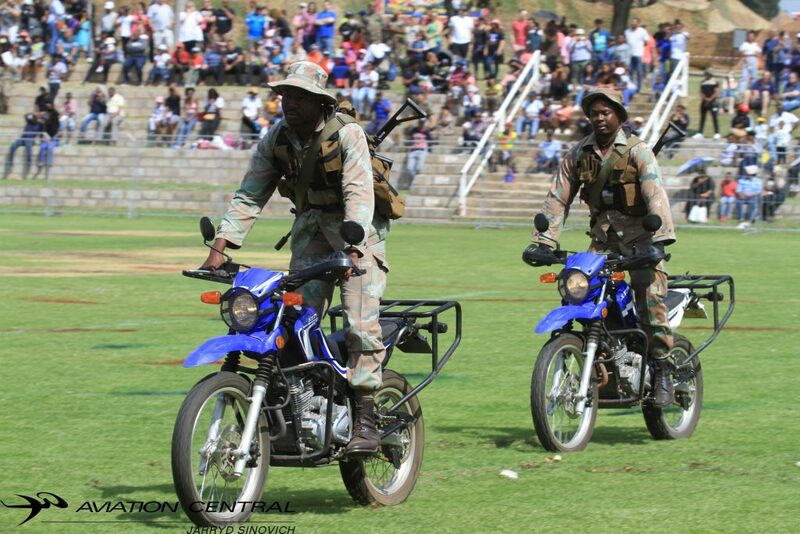 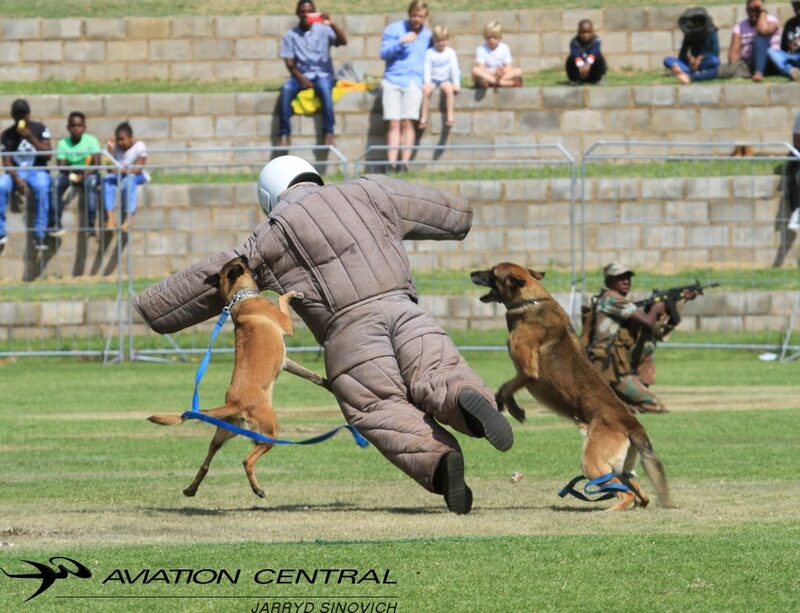 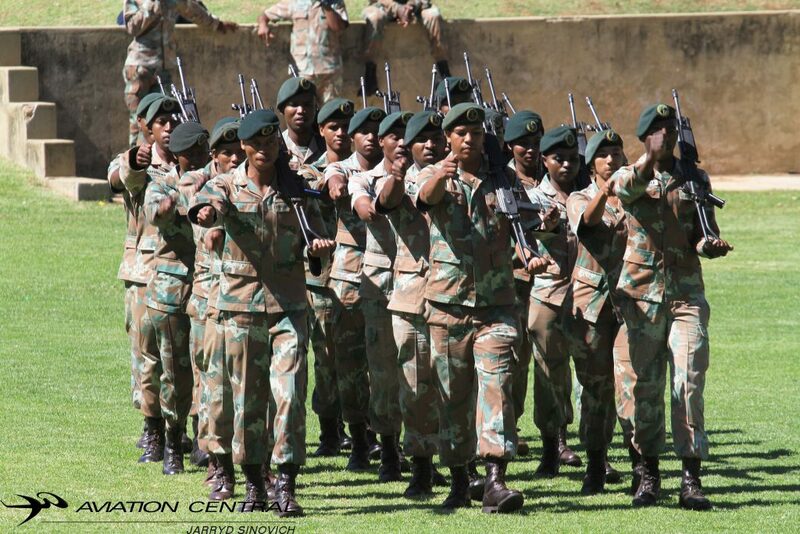 The now popular Navy gun run, a Military Police anti hijacking display, SANDF Marshal Arts demonstration. 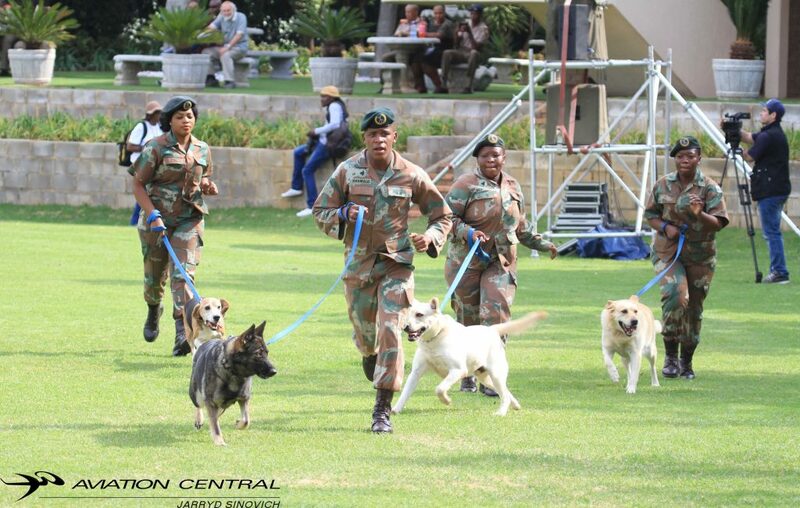 The SANDF K9 unit and field patrol. 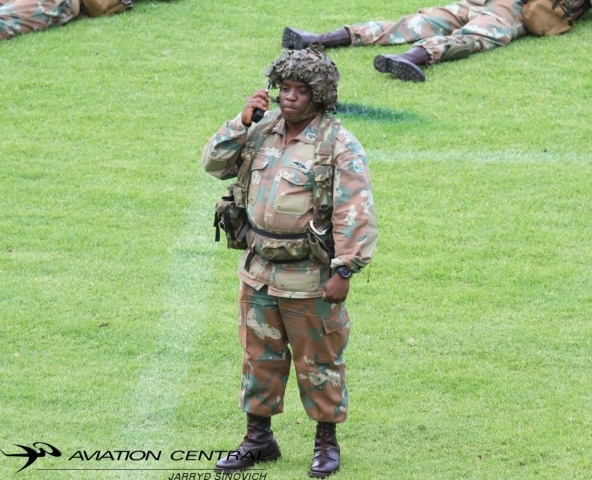 And finally the new act on the SANDF the Land Drover of the Army Technical Corpse which is demobilised and mobilized under 10 minutes. 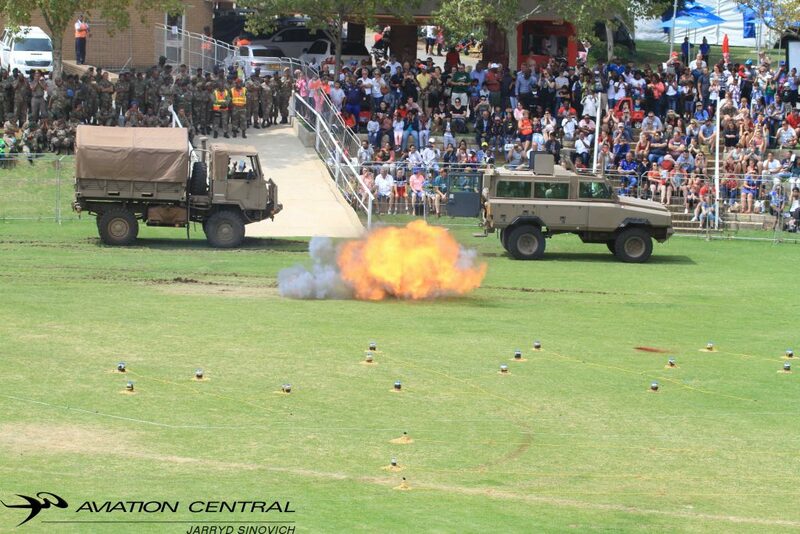 Also a favorite at this year’s event. 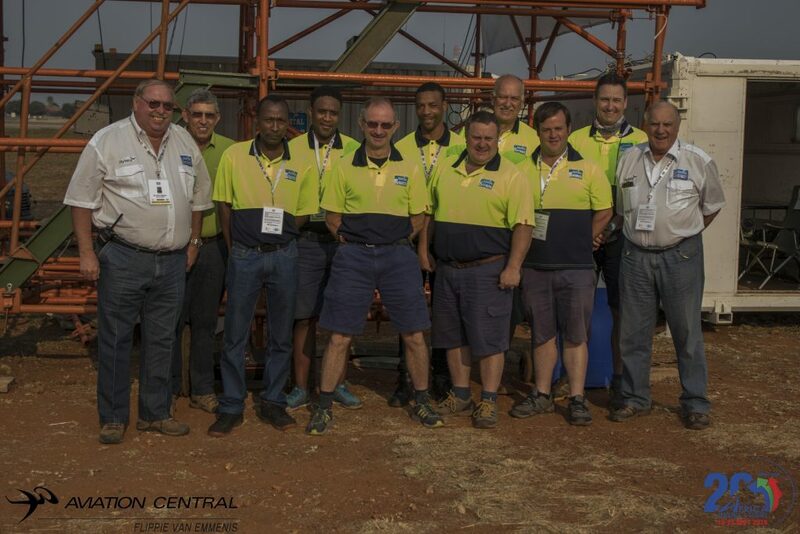 Thank you kindly to the Rand Easter Show organizers. 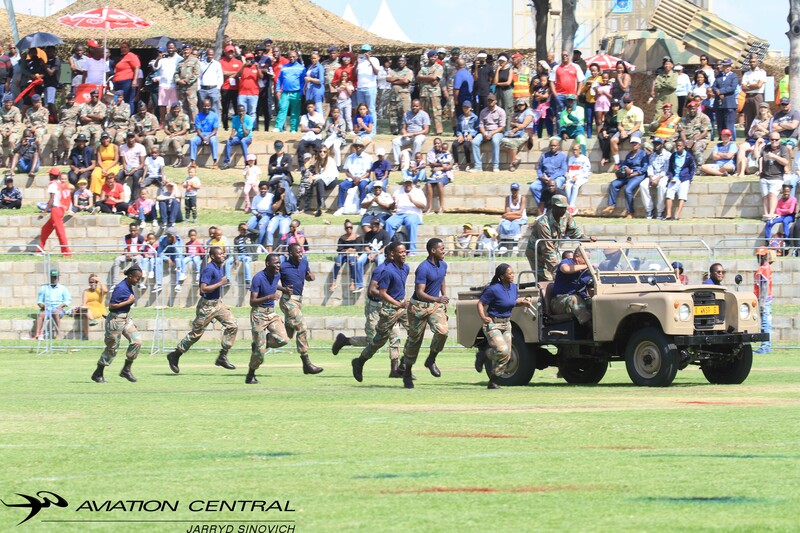 We look forward to next year’s 126th event. 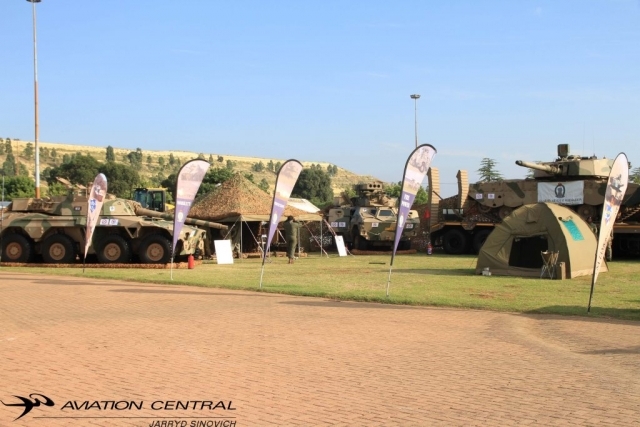 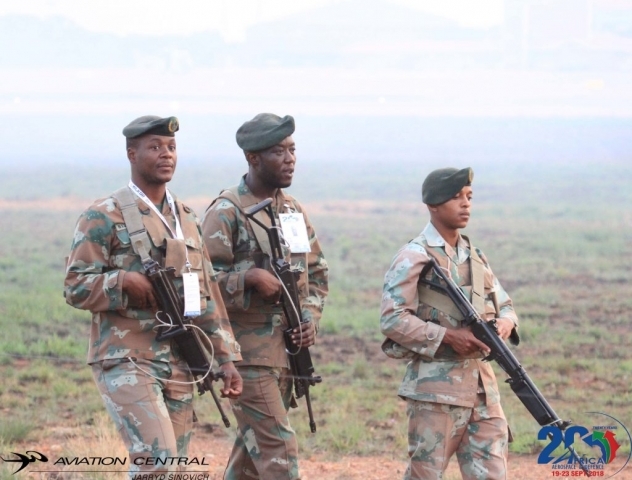 The South African National Defence force will once again take part and exhibit at this years Rand Easter Show at the Expo Centre Nasrec, south of Johannesburg. 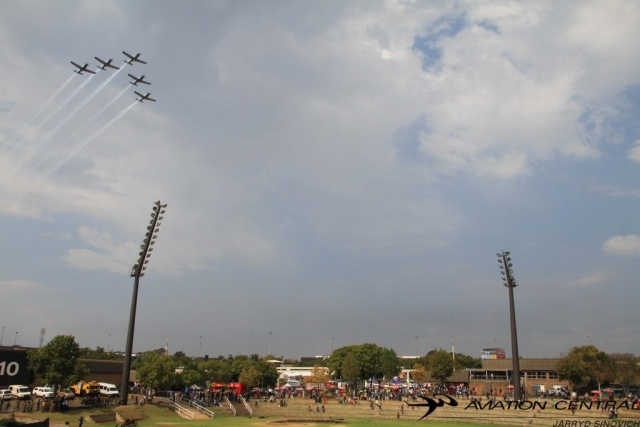 The Show which was first organised in 1894 and attracted 3000 visitors quickly became part of South African heritage attracting industries and dignitaries from around the globe and has always been a firm favourite with the public, with a record 848,332 visitors attending in 1989. 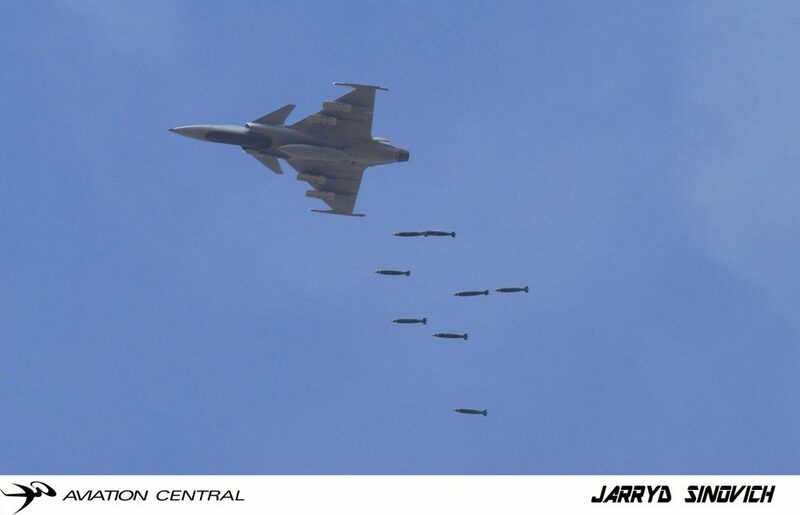 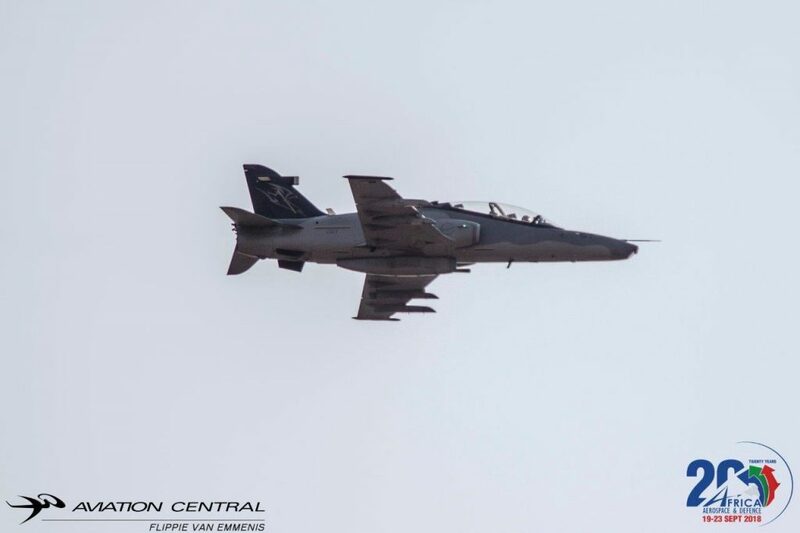 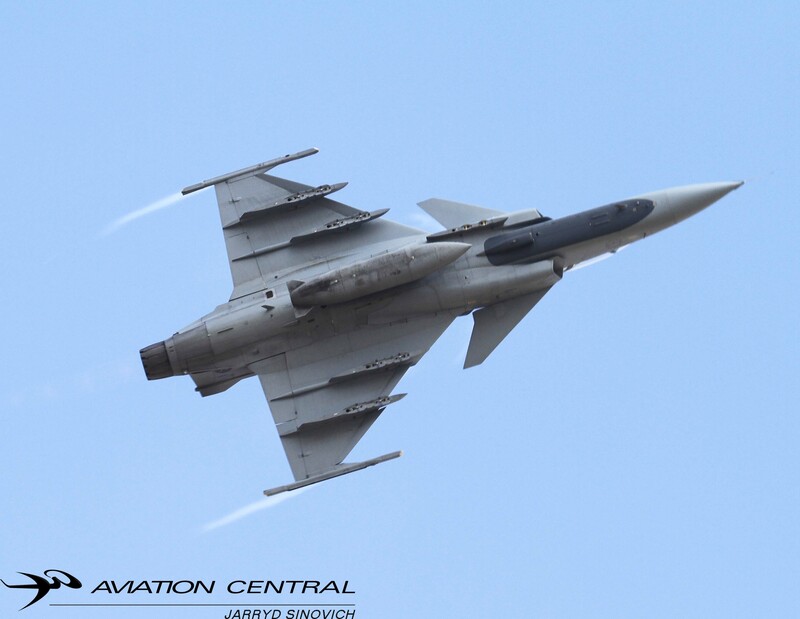 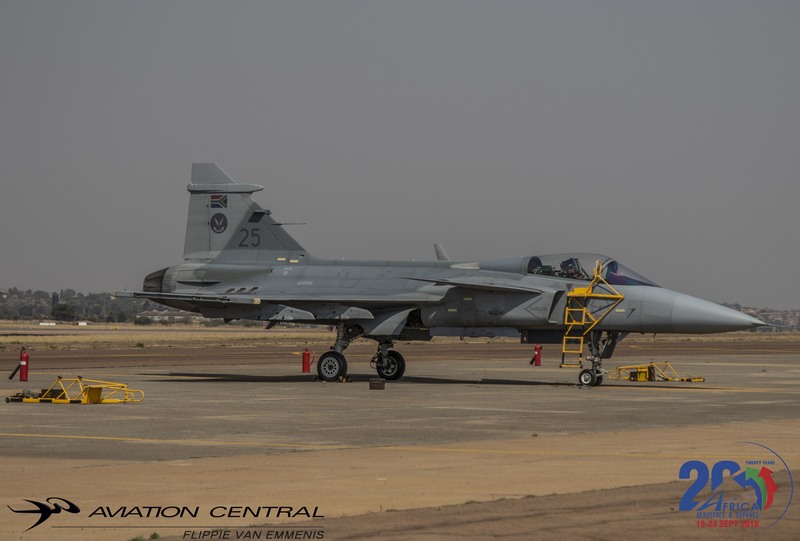 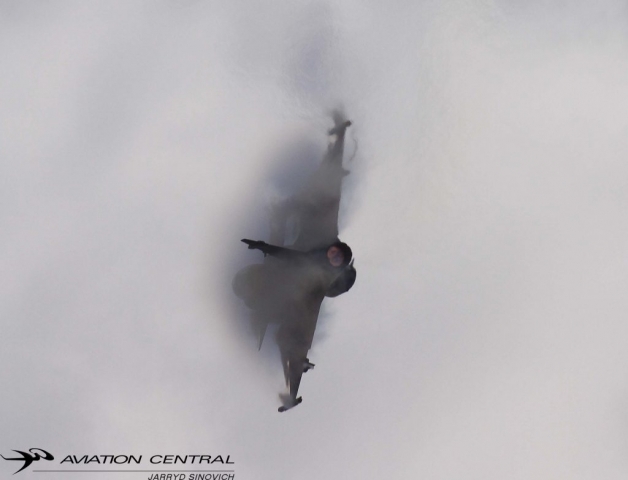 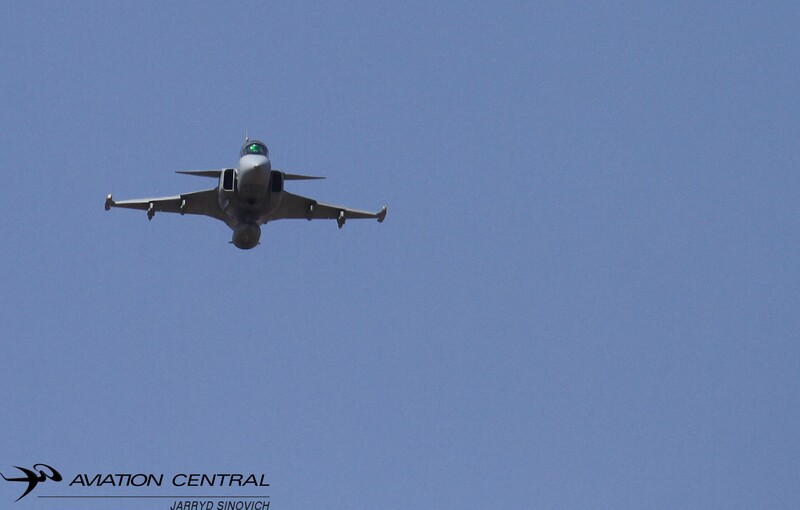 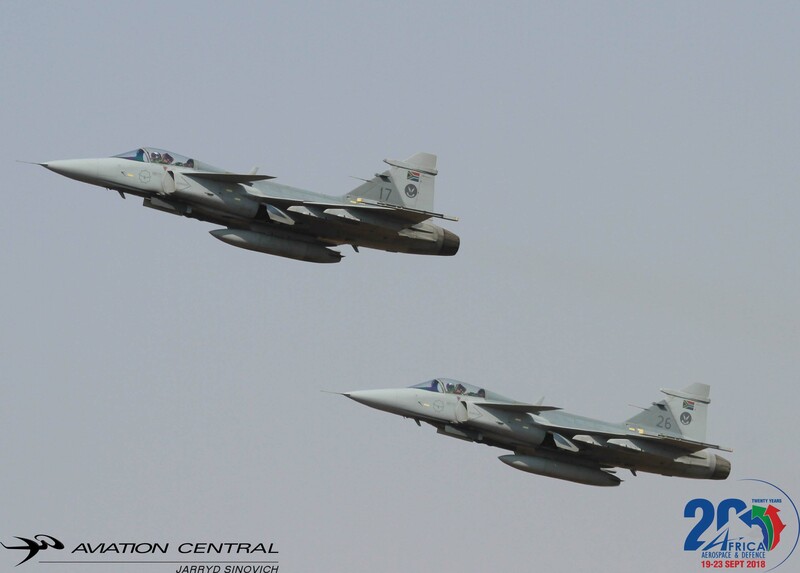 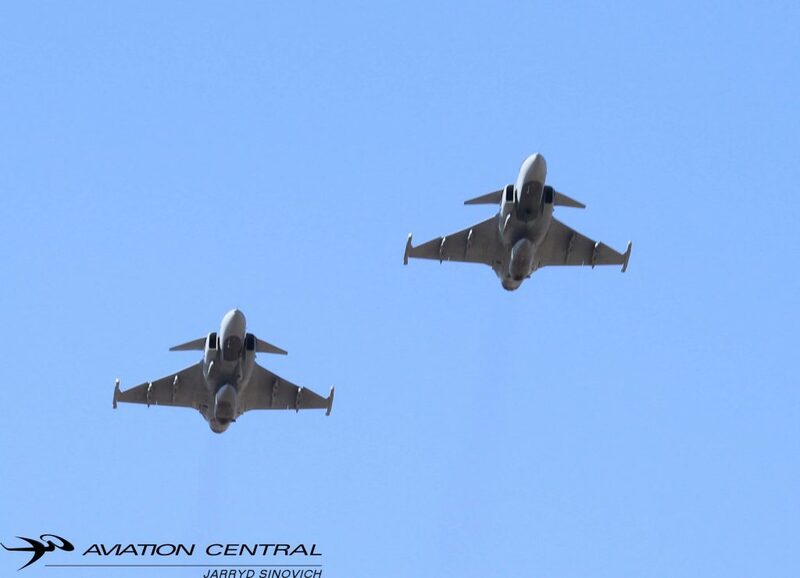 2 Squadron JAS39C Gripen during the 2018 Rand Easter Show mock attacks. 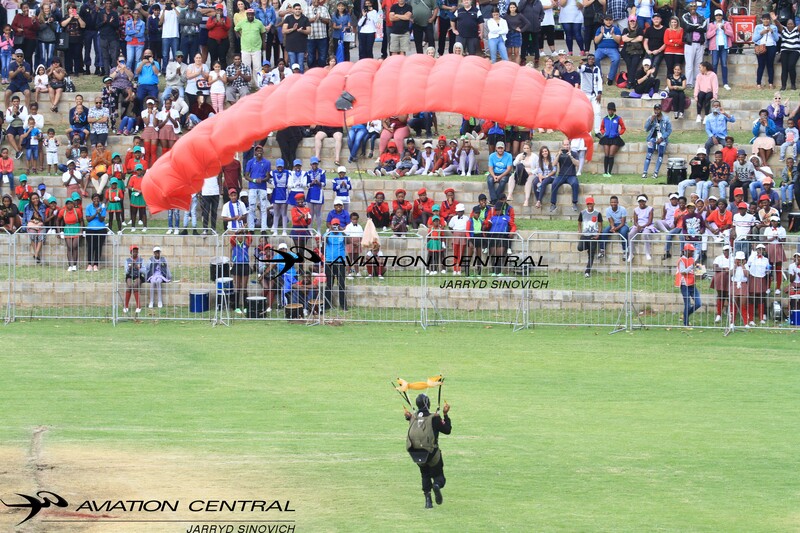 The 125th Celebration promises to be one of the best shows ever with the introduction of fantastic, on trend, content. 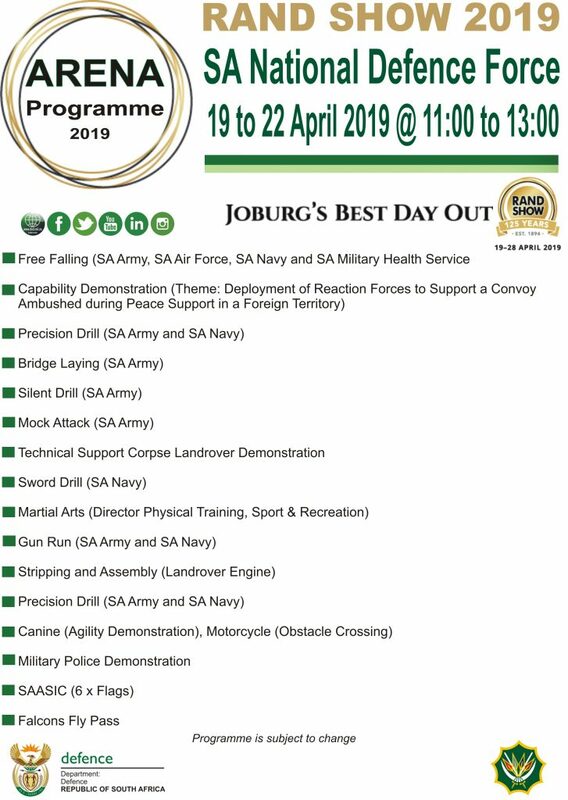 This will include Africa’s biggest celebration of the global sensation game, Fortnite, new reality cooking and talent shows, a beautifully presented Flower and Décor pavilion, a world class international Fitness Expo, Military displays, Drum Majorette Gold Cup and so much more. 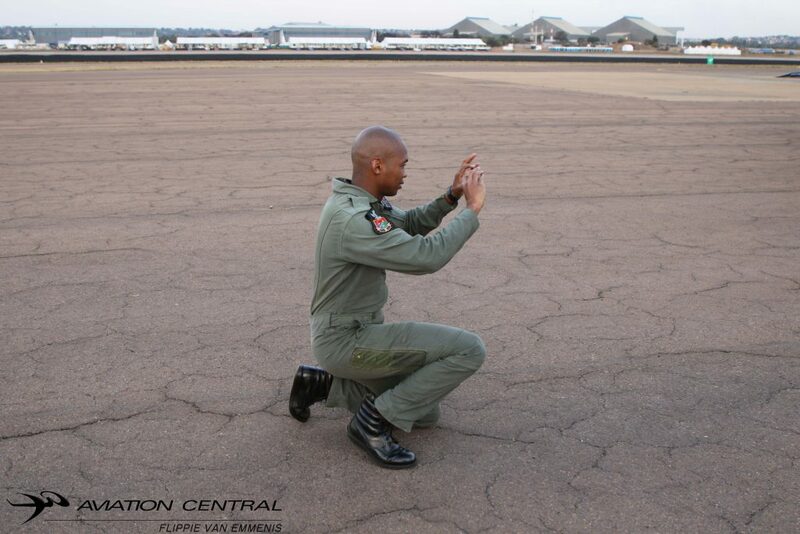 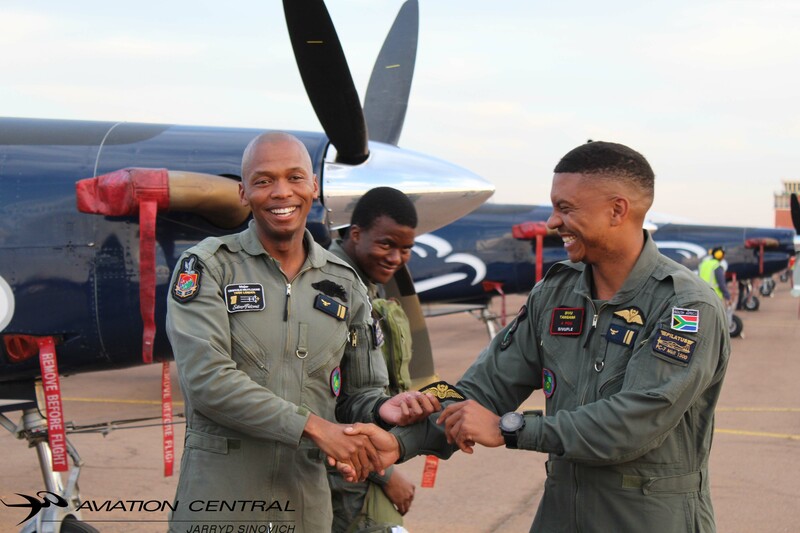 The South African Airforce cockpit ambassadors will once again grace the skies over Johannesburg led by Major Omphile Matloane. 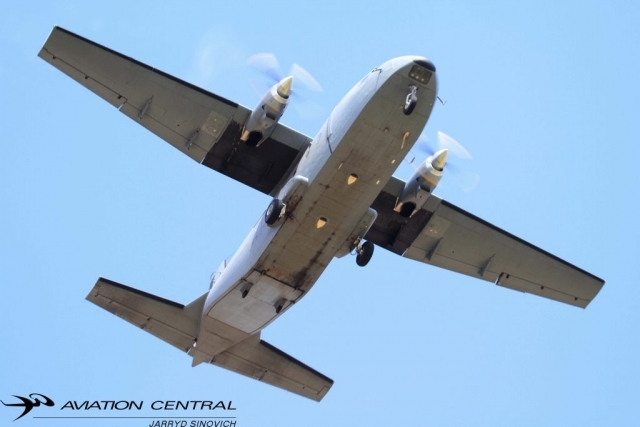 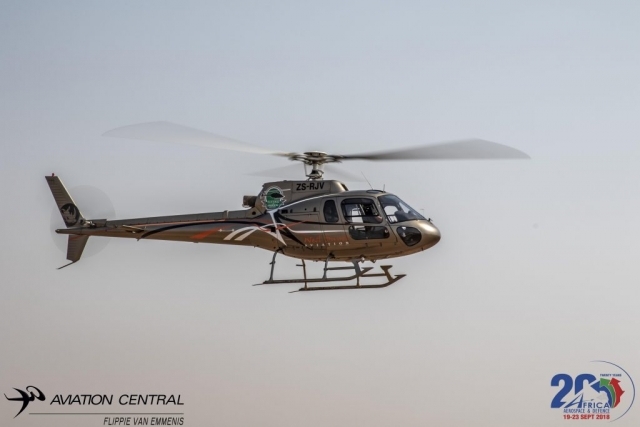 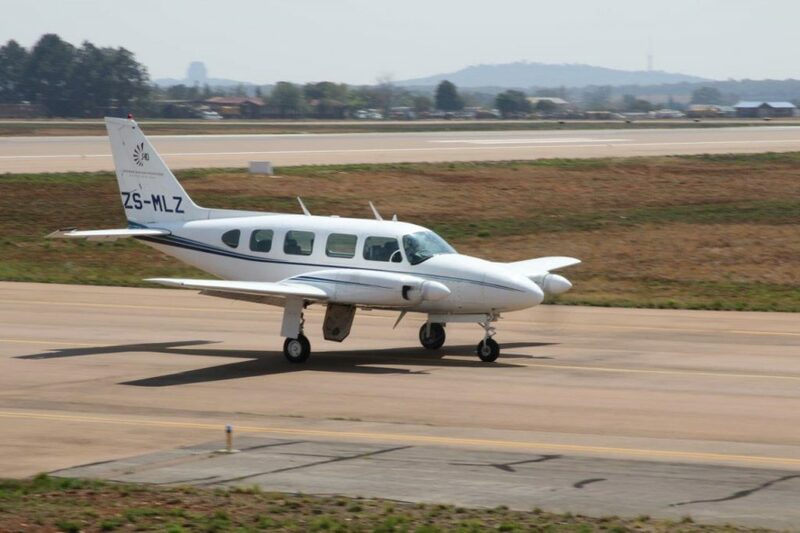 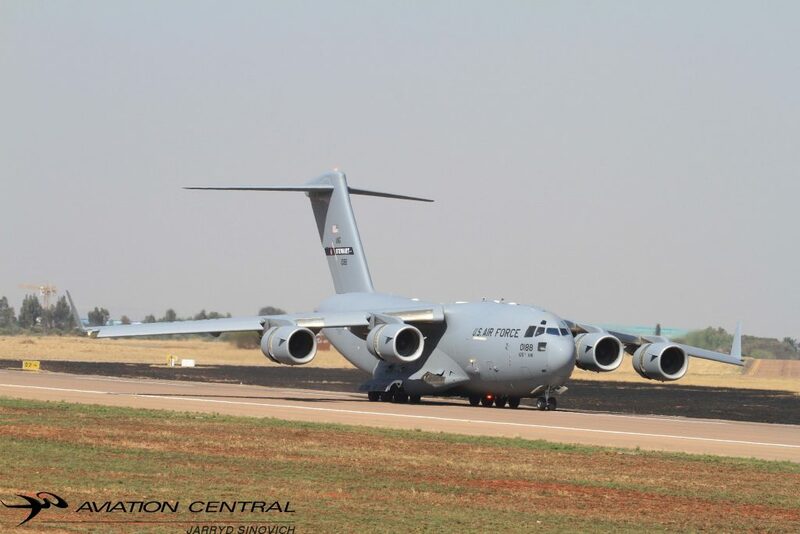 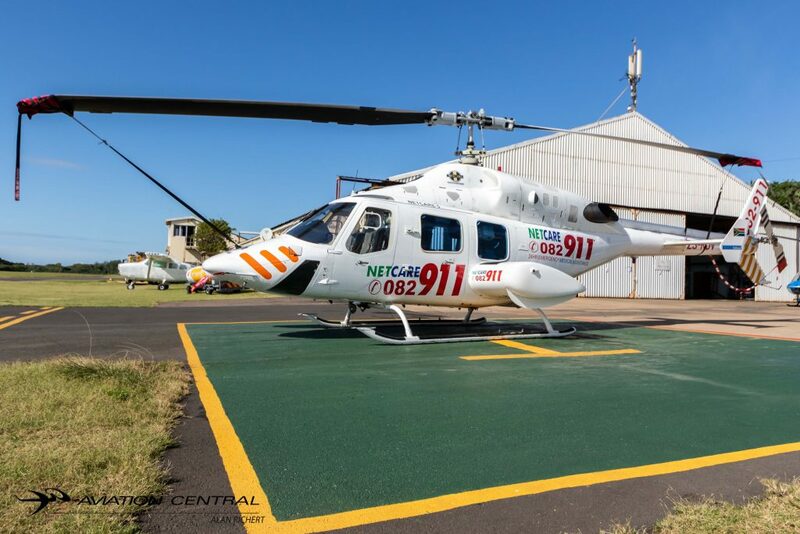 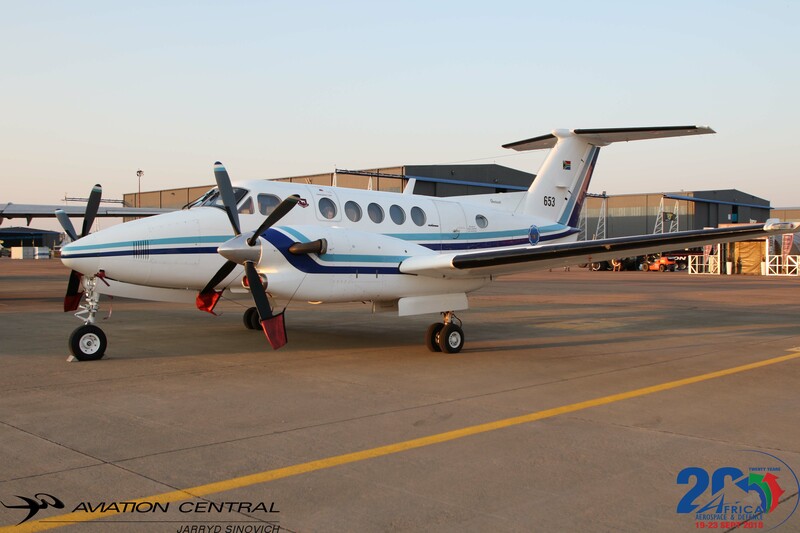 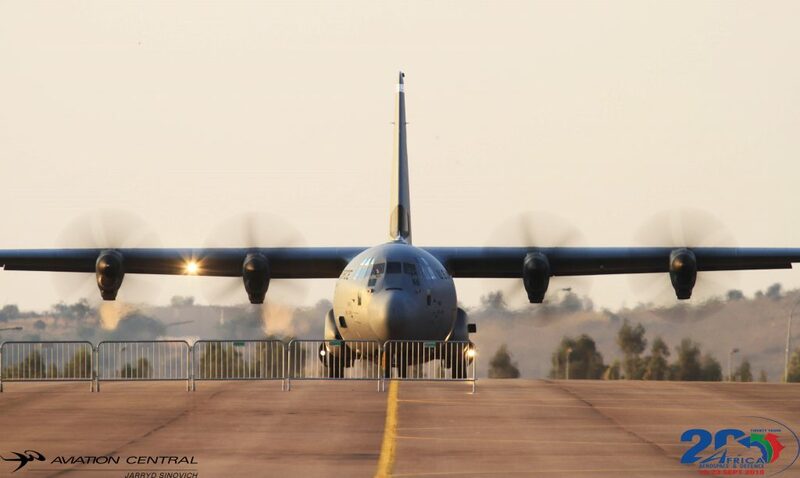 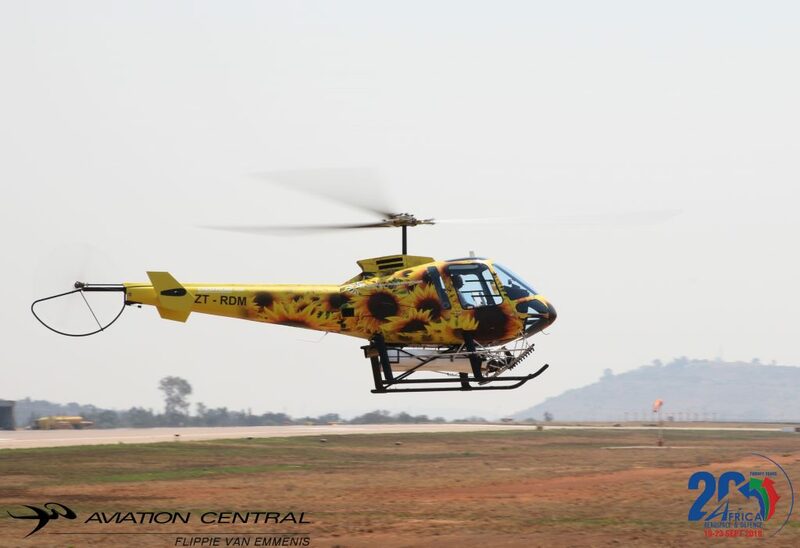 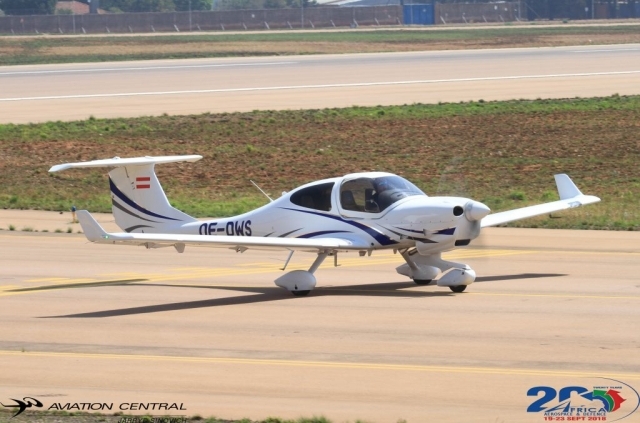 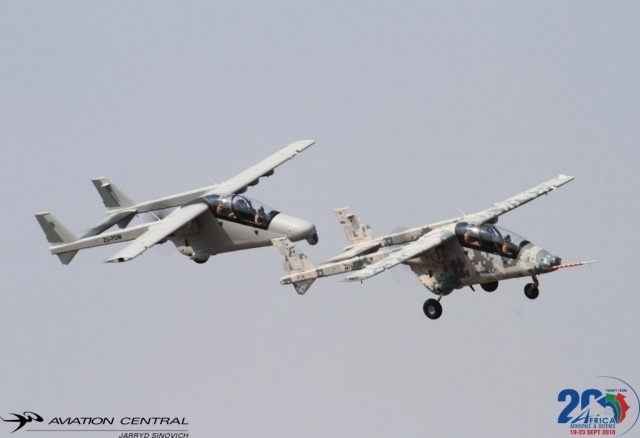 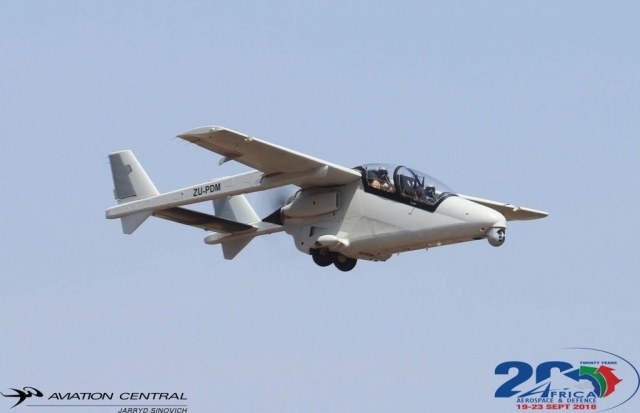 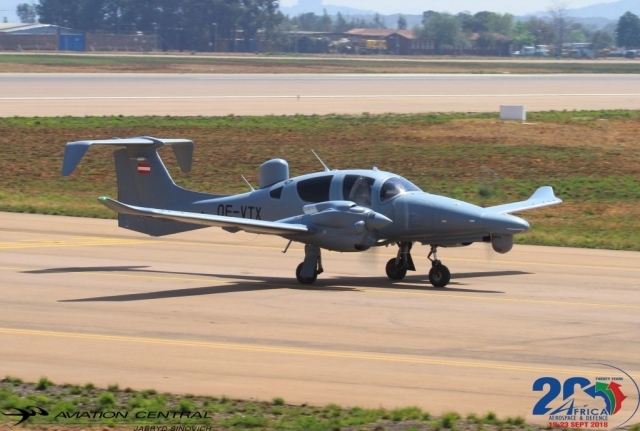 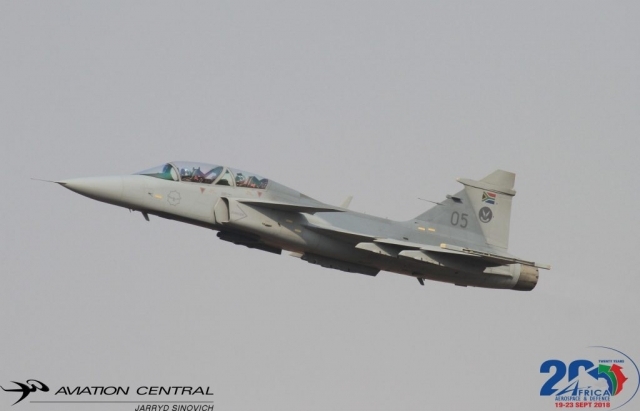 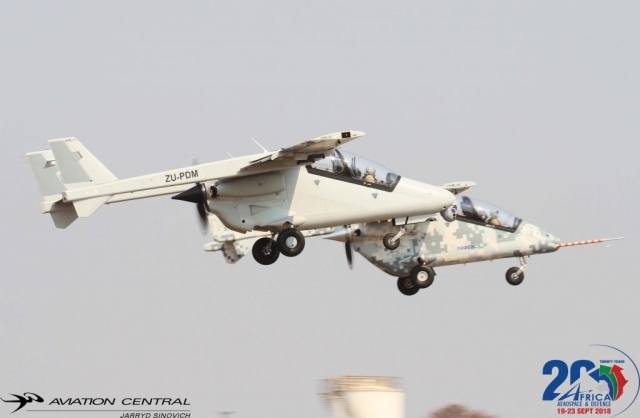 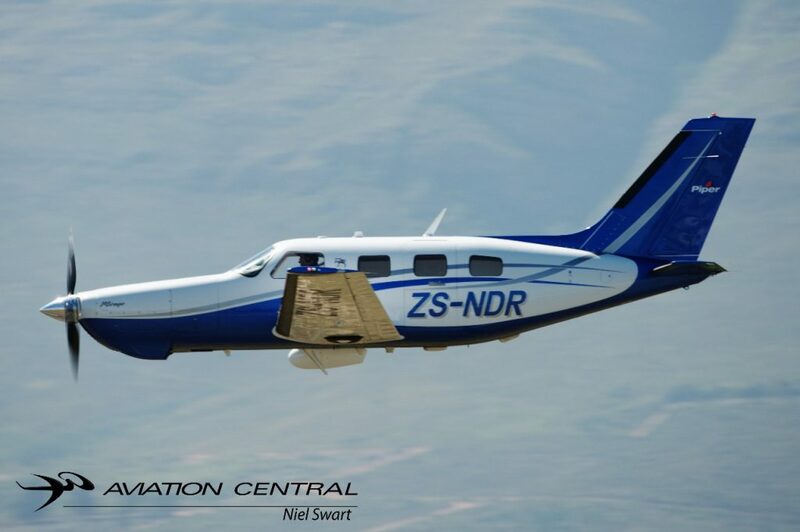 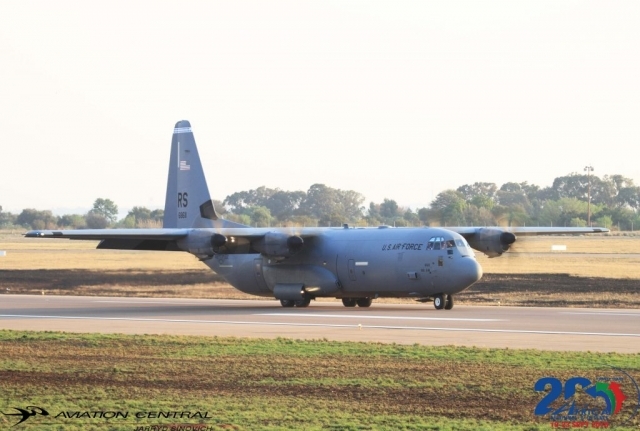 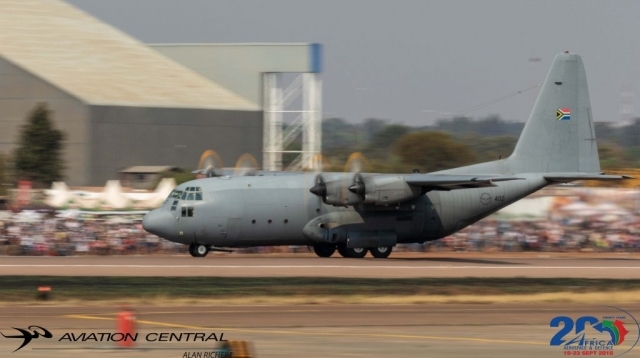 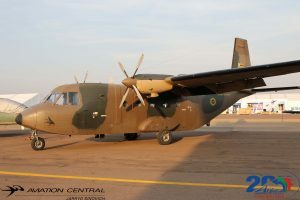 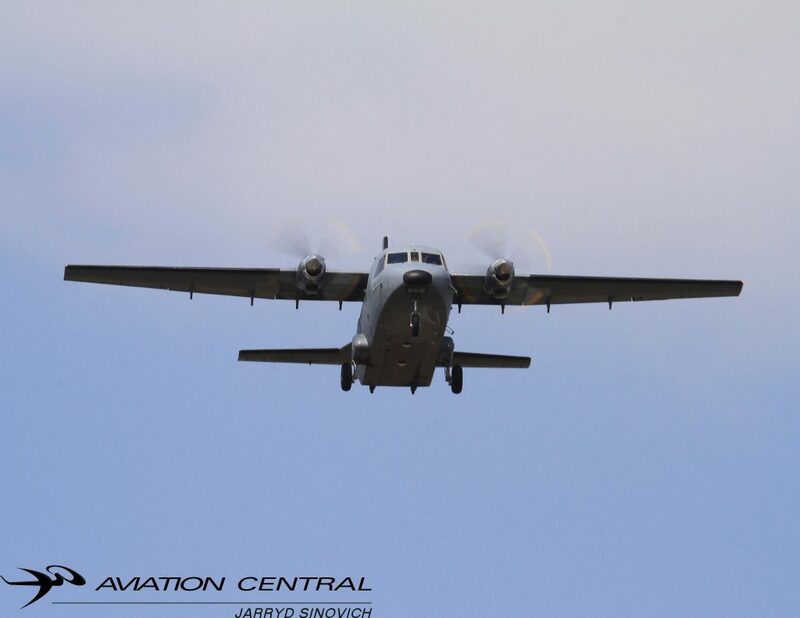 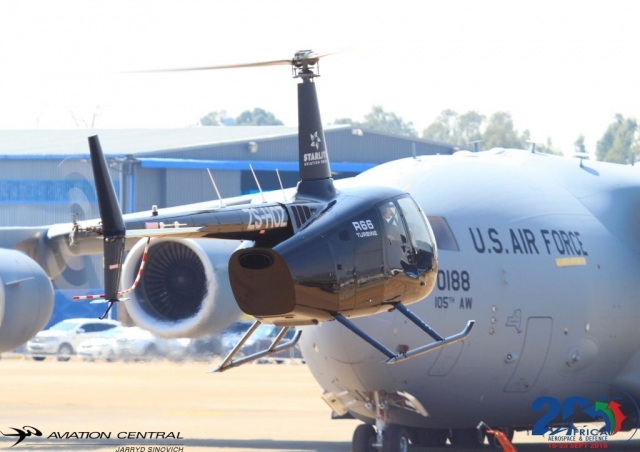 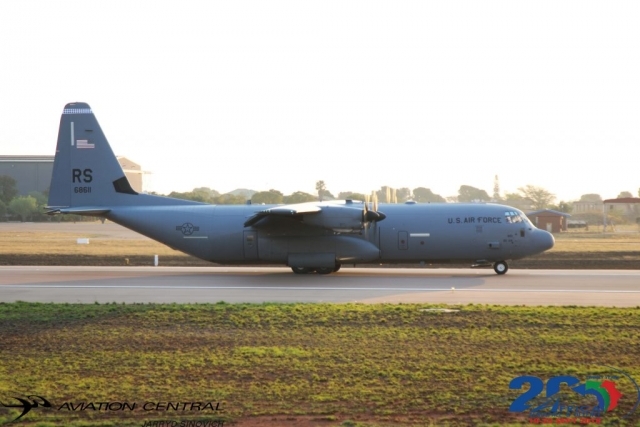 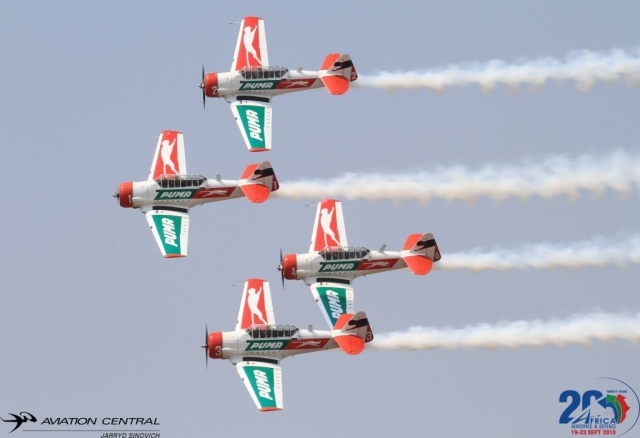 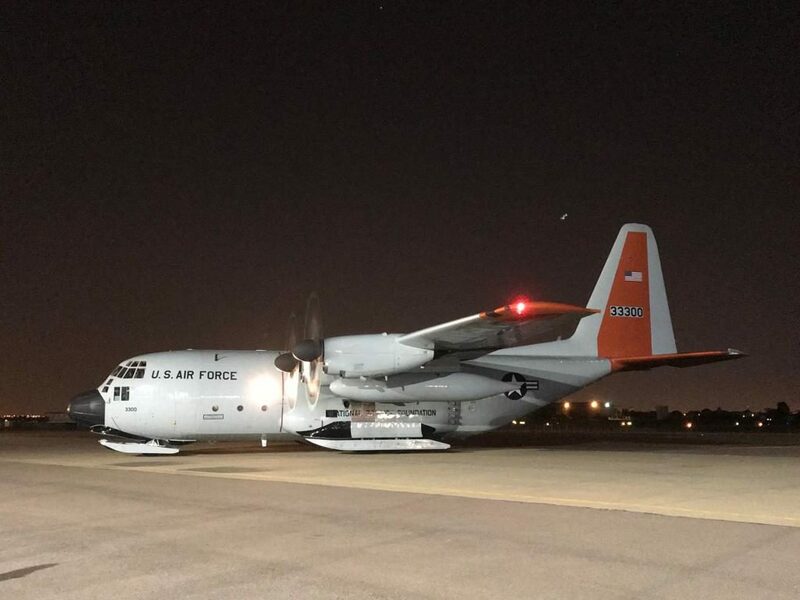 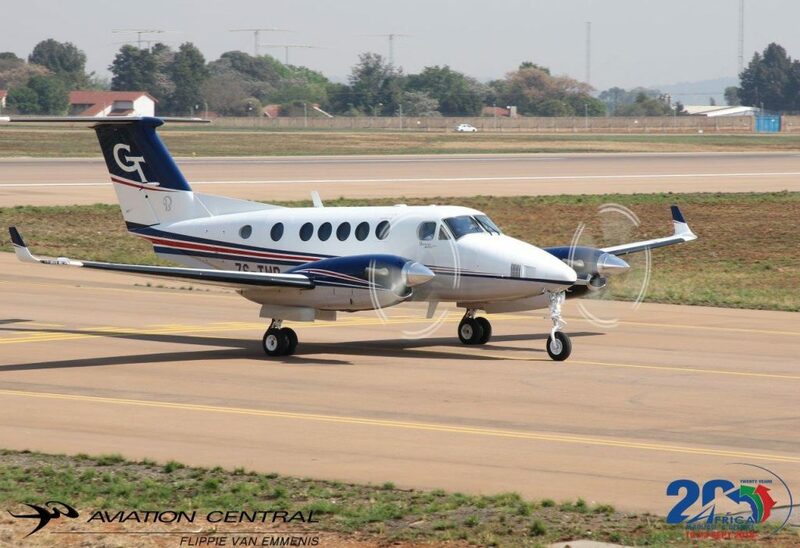 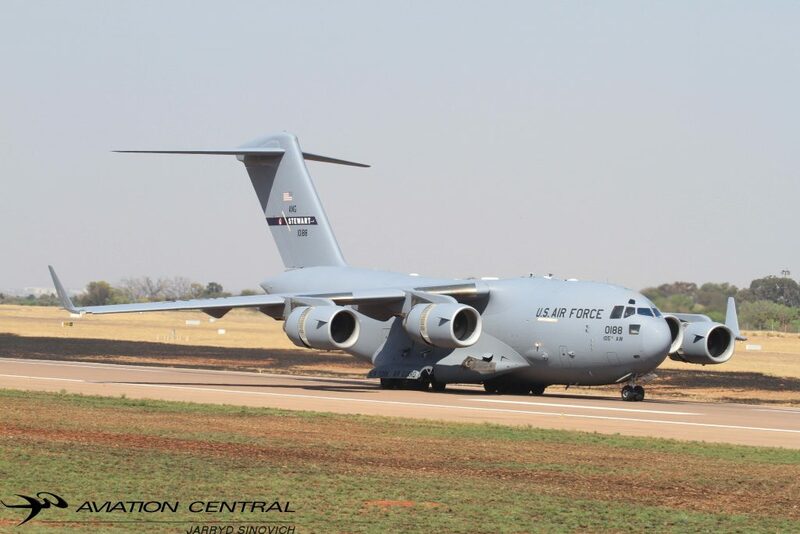 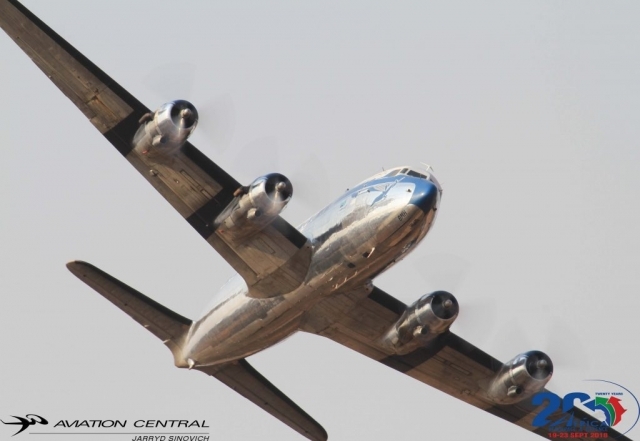 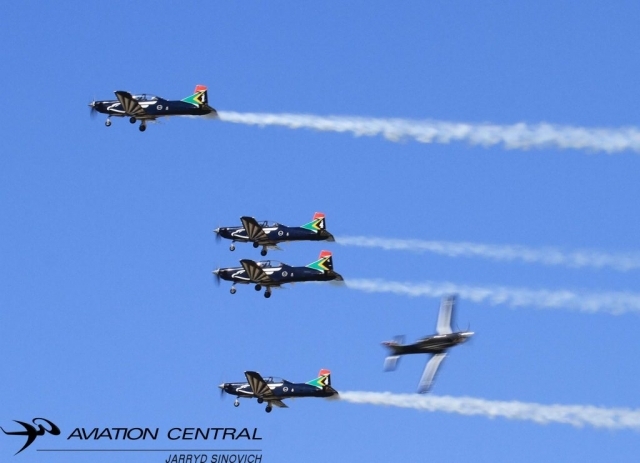 Low flying aircraft will also be busy over the north of Johannesburg as they fly from AFB Swartkop and AFB Waterkloof for the first couple of days of the Rand Easter Show. 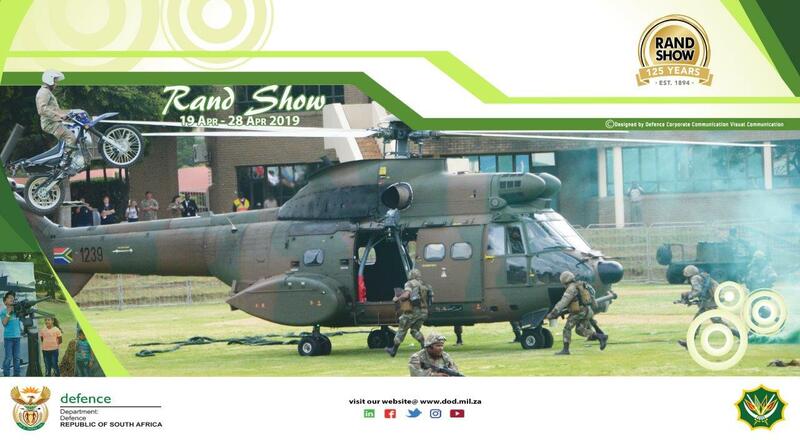 Note the SANDF Capability display will take place for the first 4 days of the opening of the show. 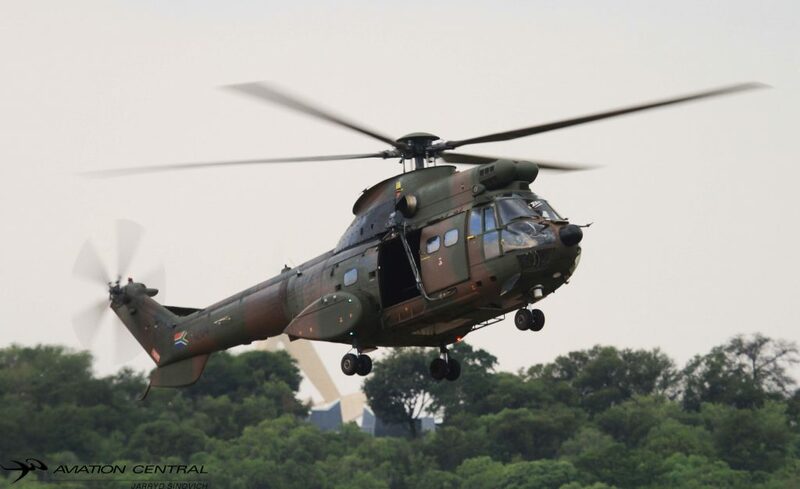 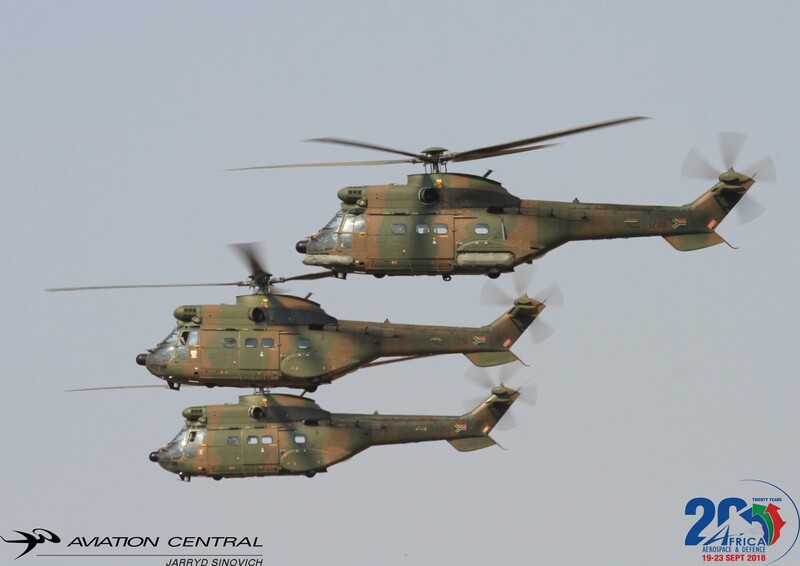 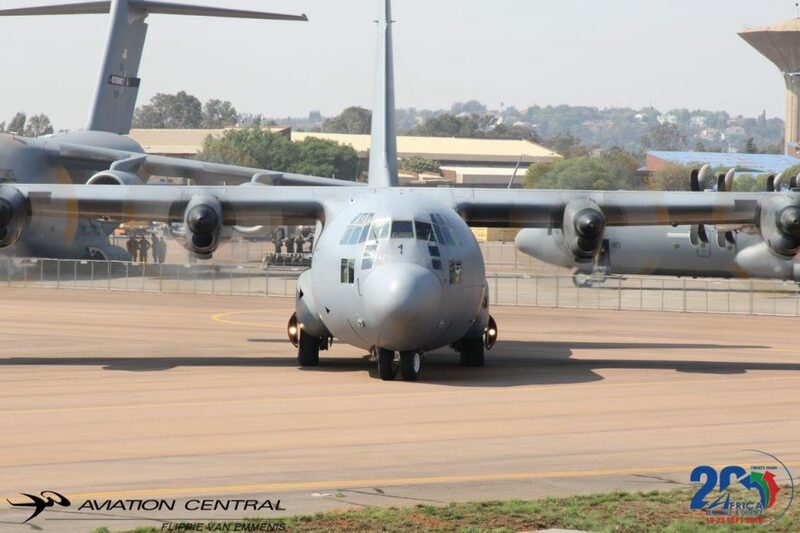 More details on what aircraft and other SANDF assets will be posted once confirmed. 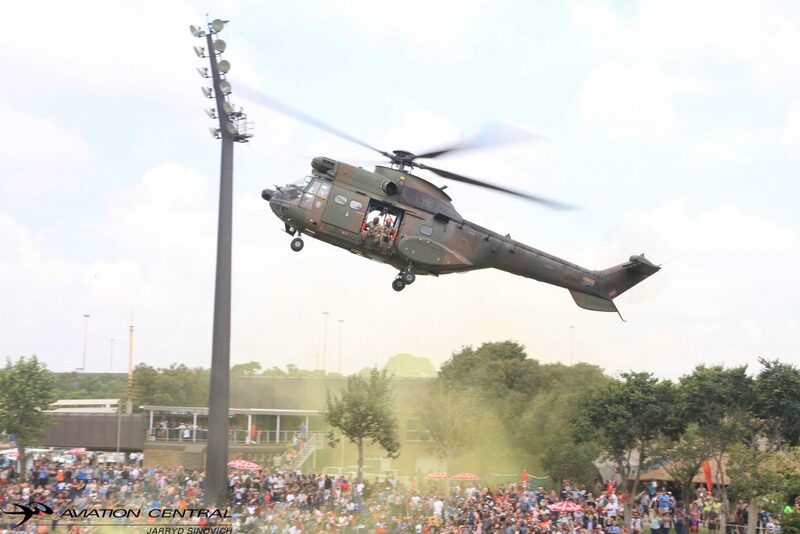 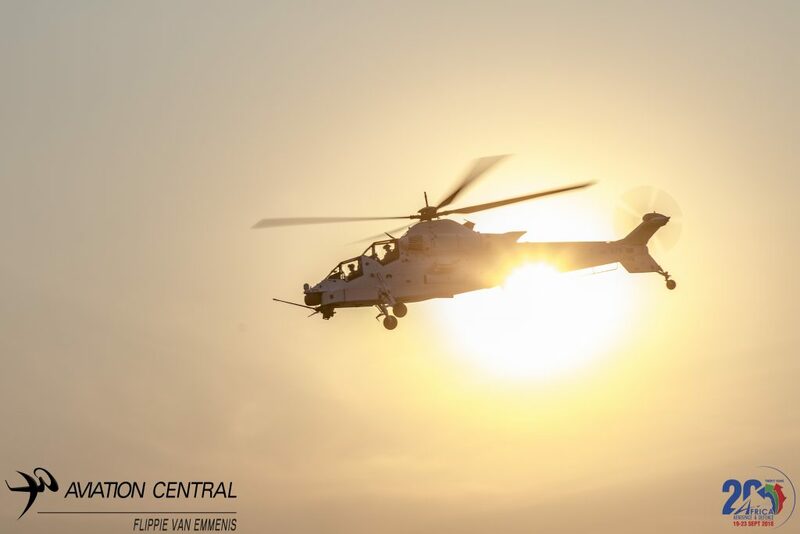 Oryx Helicopter landing in the arena where the capability demonstration will once again take place. 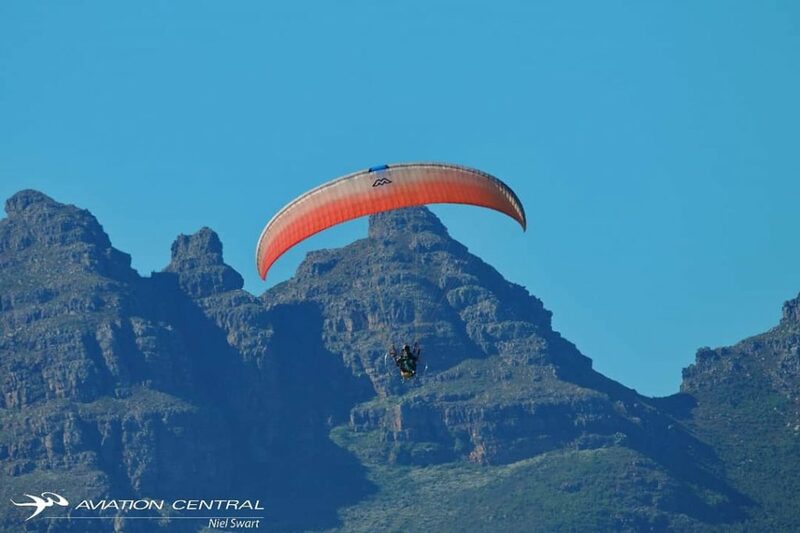 Stellenbosch is situated in the Western Cape, South Africa. 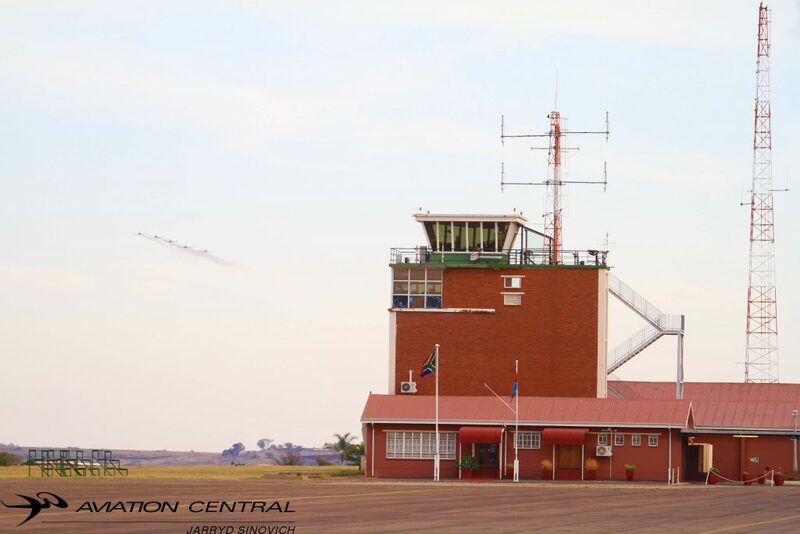 The area is known for its scenery, wine, university and the kindness of the community. 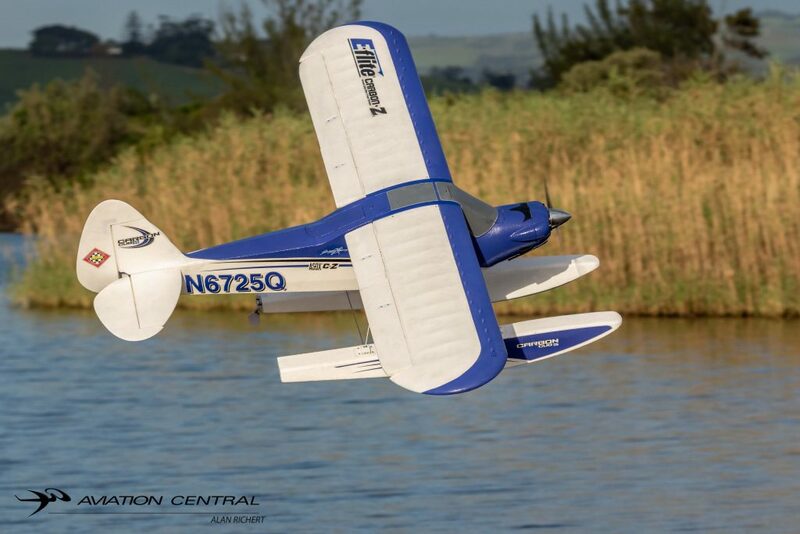 Stellenbosch Flying Club is located just off the R44 leading out of Stellenbosch and has a relaxed atmosphere where flying, local craft beer and good food makes for lazy Saturday afternoons. 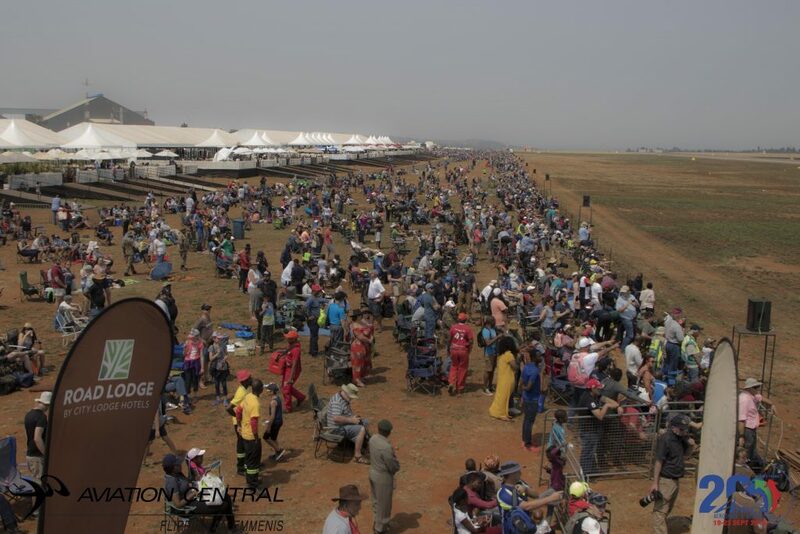 On the 23rd of March 2019 this changed to a hive of activity and the day where it all came together, months of meticulous planning with hard work and preparations came together. 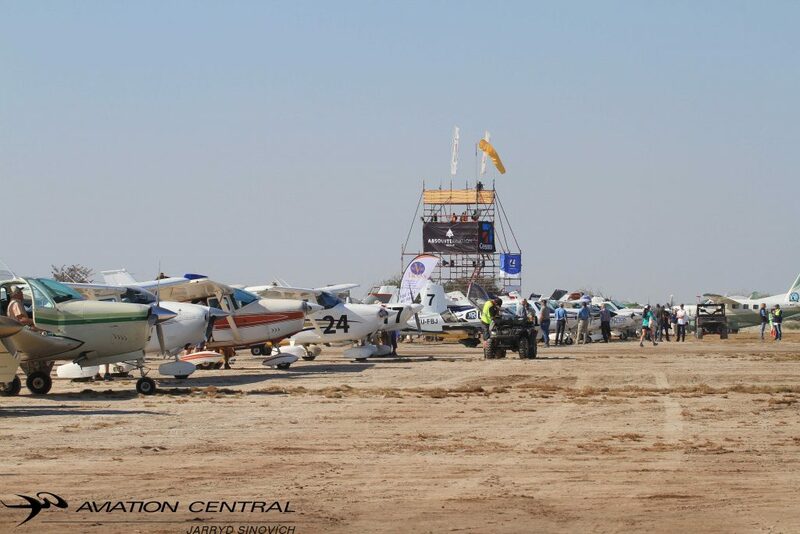 The scene was set, the queue at the gates forming just after sunrise and the weather being almost perfect. The packed program list and the variety of participating aircraft is proof of a wonderful show that warmed the hearts of many. 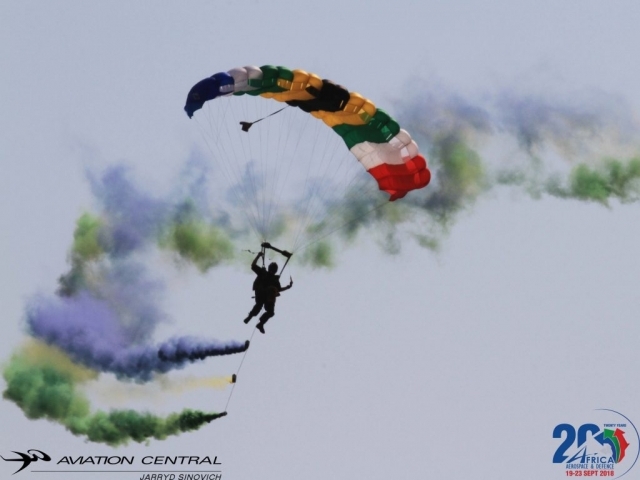 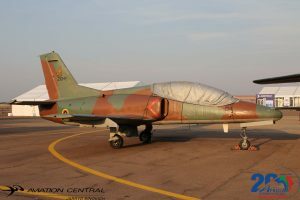 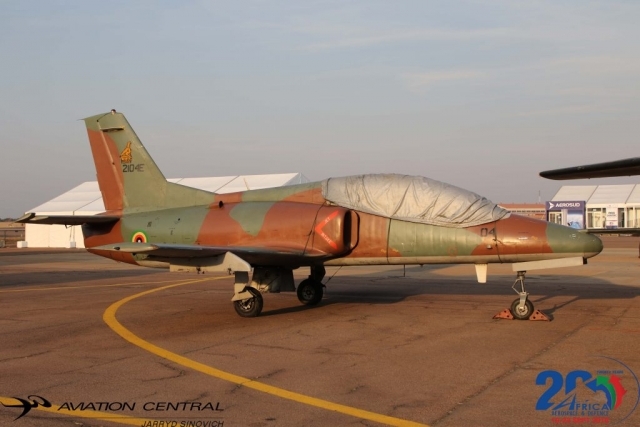 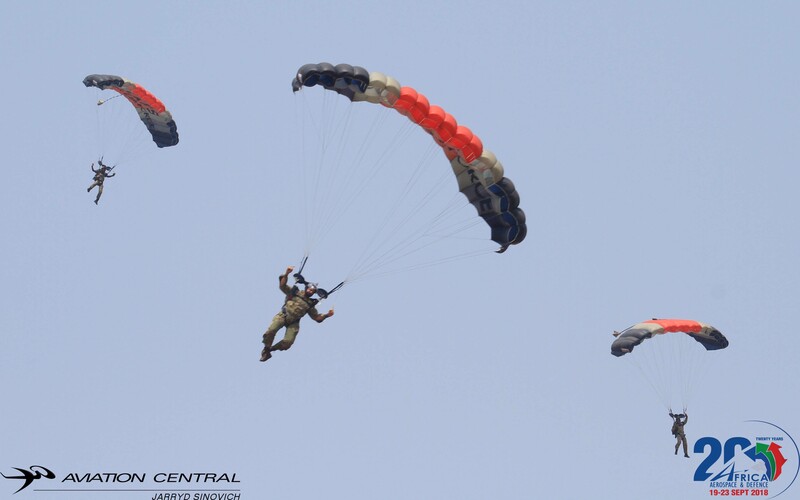 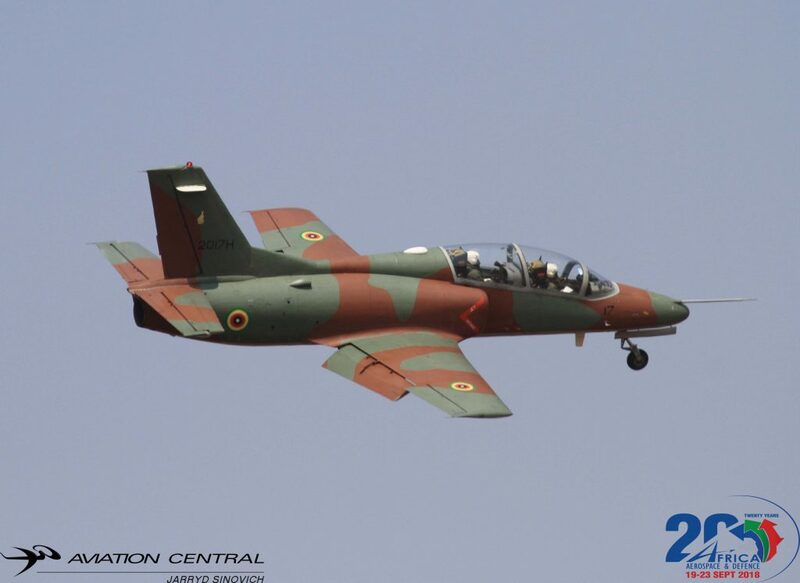 The biggest flag in Africa was parachuted in from a C206, the emergency cavalcade was on display and the props of the aircraft of the first display were turning… out came the Silver Falcons to open the show. 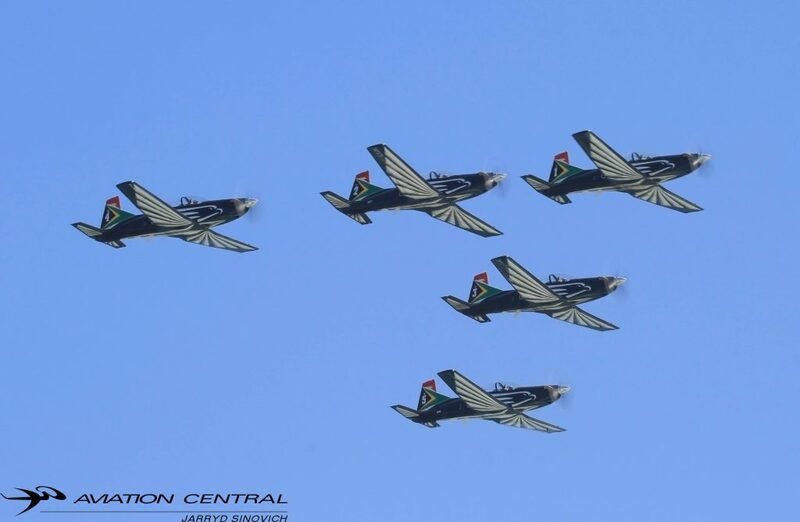 With the mountains and greenery from the surroundings being the scenery, the Silver Falcons took to the sky and gave a shortened but wonderful display. 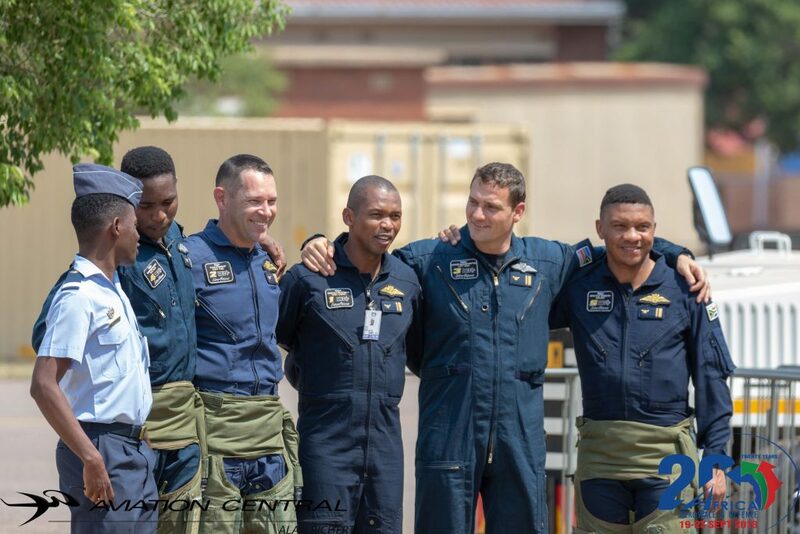 Really being the cockpit ambassadors for the South African Air Force. 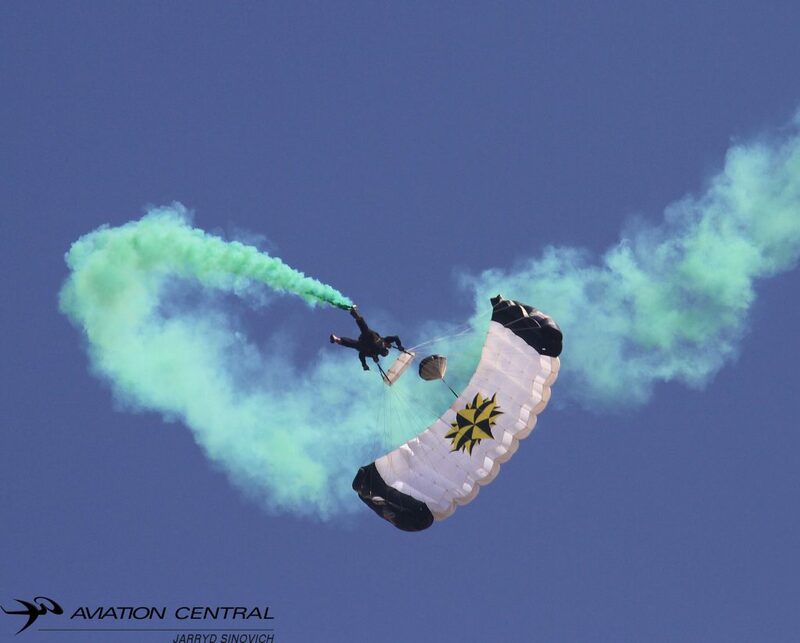 Special mention is to be made of Mr Air Show, Brian Emmenis. 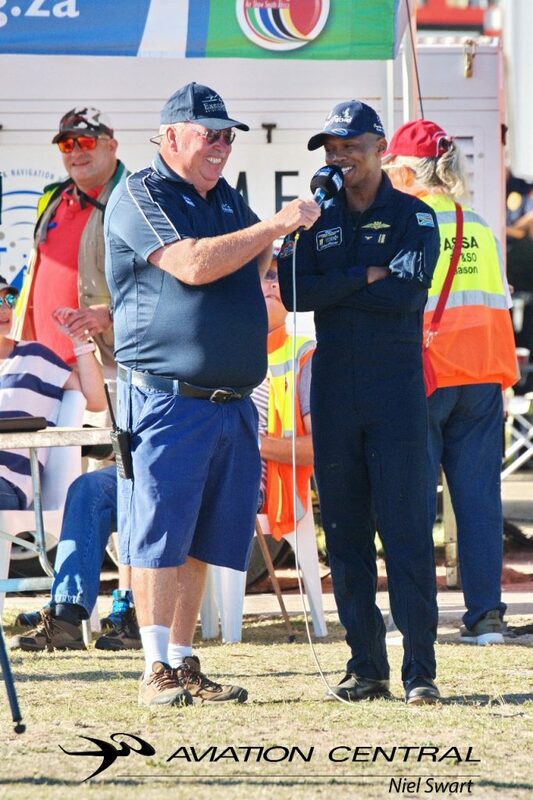 As many will know, he is the voice of air shows in South Africa and abroad. 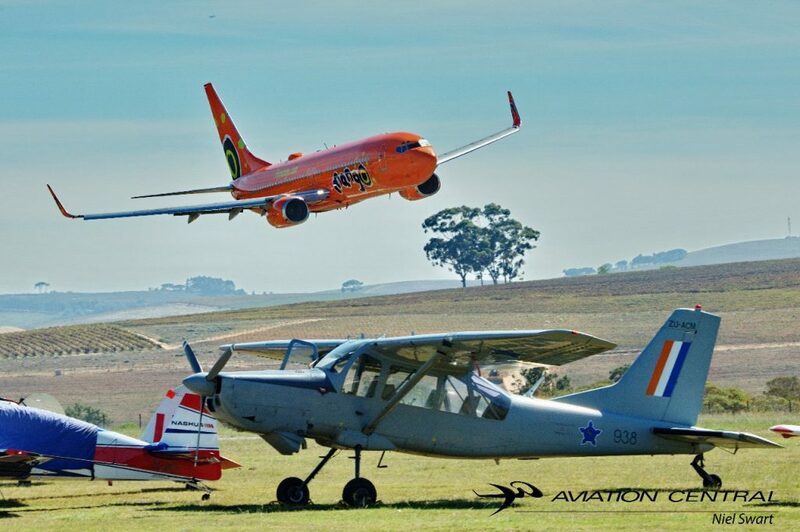 While the first few displays where happening, interviews were performed with James Vos: MEC Tourism and Economic Affairs, Major Omphile Mutloane, Phillip du Preez: Head of ExecuJet Cape Town, Franz Smit: Pilot insure and Graham Smith who received a lifetime membership from Stellenbosh Flying Club. 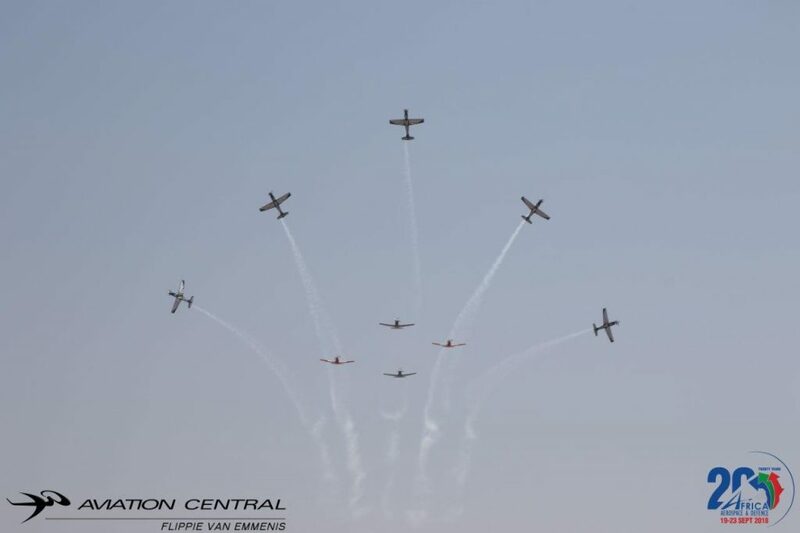 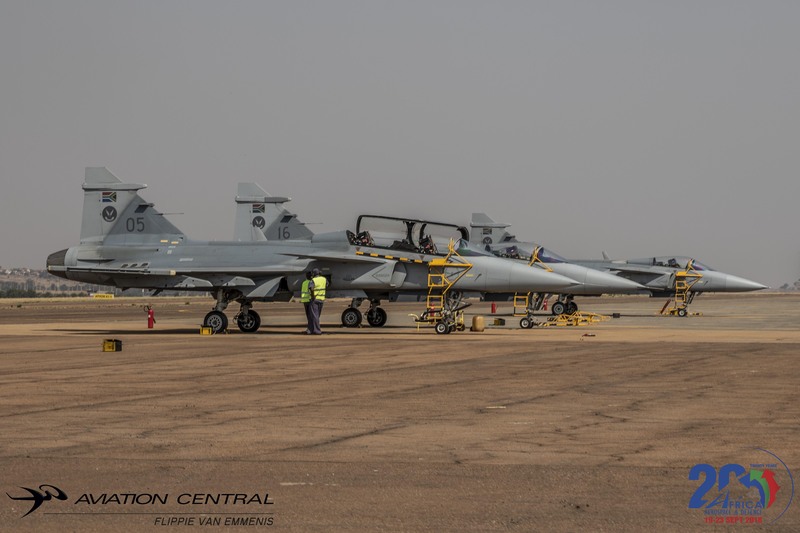 The program consisted of The Silver Falcons, Team Extreme, a Mango B737, Ex-SAAF Bosbok, Working on Fire display consisting of two Hueys, a Cessna and AT-802, L39, NAC Bell 407, Shock Cub, Raptors RVs, Tigermoth, J51C Glider, Boeing Stearman, Howard Vintage, Radio Control Models, Husky, Harvard T6, a display by TSU/AGA involving vehicles, dogs and a EC145, M16 Gyro, NAC Mirage PA 46-350. 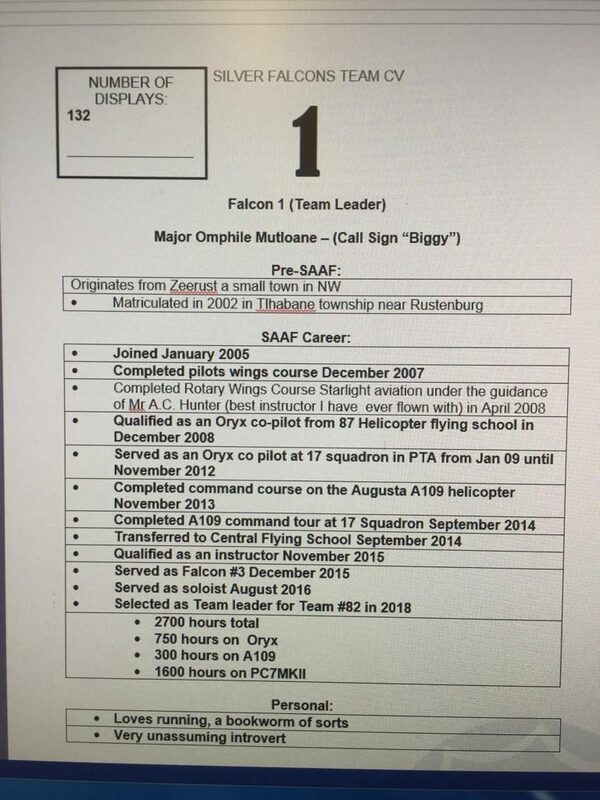 The list of pilots being as impressive as the list of aircraft consisting of Scully Levin, Pierre Gouws, Trevor Warner, Nigel Hopkins, Glen Warden, Trevor Milton, Ivan V/D Schaar, Jurie Steyn, Trevor Milton and many others. These pilot put up energised displays that had the crowds entertained, camera shutters clicking all day long (making downloading, editing and posting a challenge) and made this show a memorable one. throughout the day there were constant movements by staff between the crowds to collect litter which easily makes this the cleanest show I have witnessed. 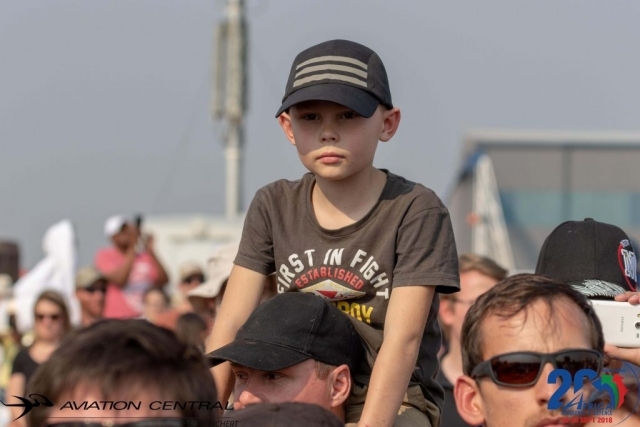 After a long hot day, the warmest in weeks, with loads of liquids consumed and the crowds leaving, there was not a single piece of paper or empty bottle lying around. 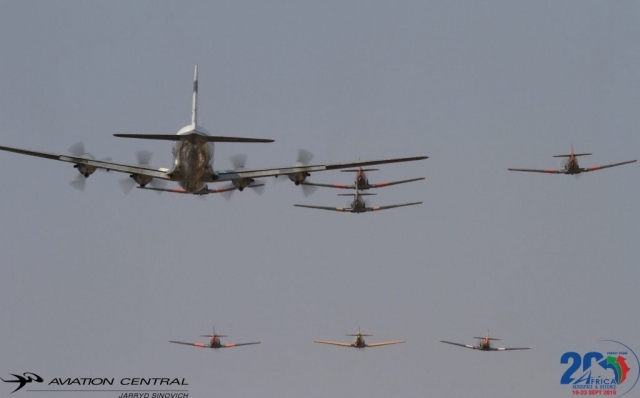 With the crowds heading home and some staying for a last drink or chat with old friends, the departing aircraft made for a mini show as many did the traditional fly by as a thank you. 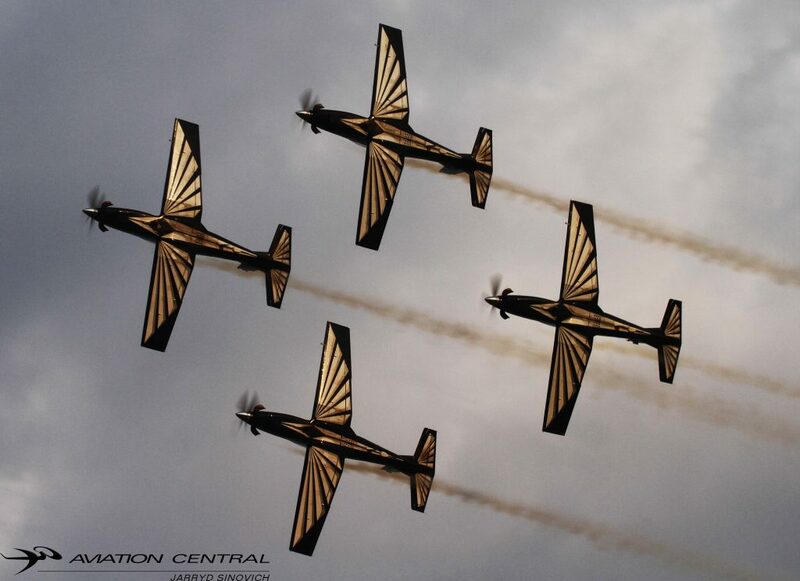 The Silver Falcons being no exception. They took off, the formation was formed and the six ship came past 3 times, almost as if they didn’t want to head home as yet. 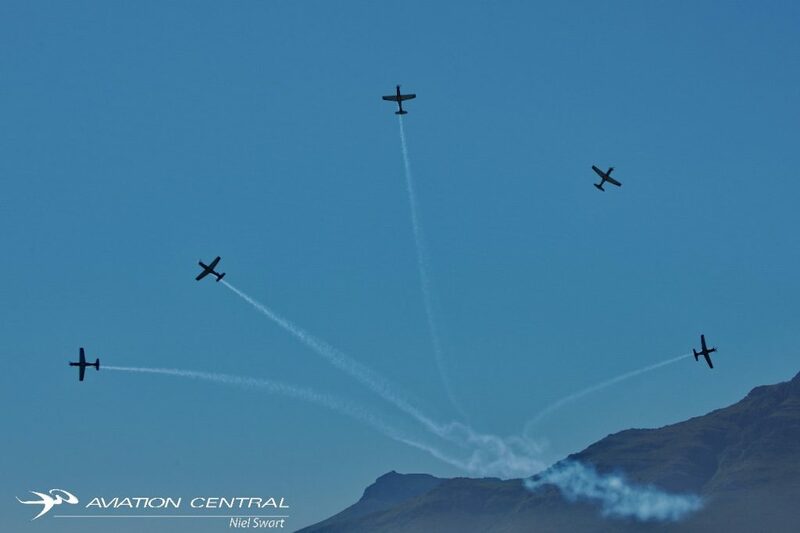 As the sun set on the mountains, the light being amazing, the dust from the show settled these were observed by a few and was truly magical. 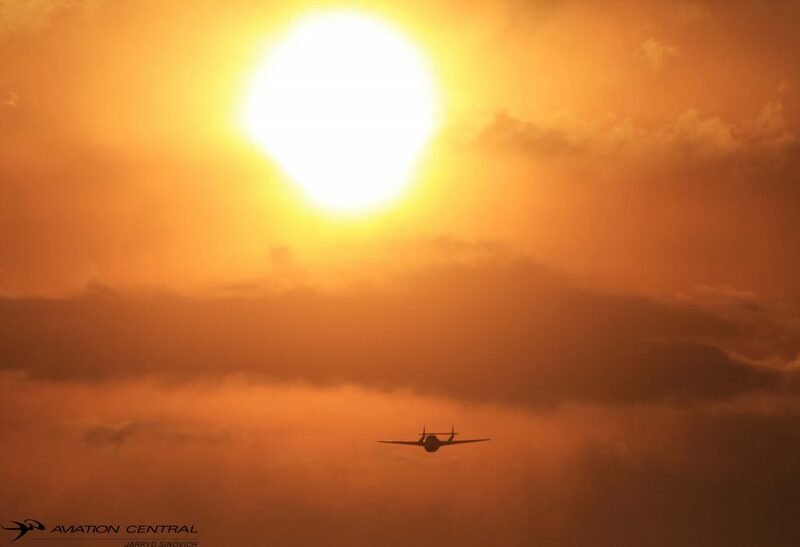 A time to reflect on the day. 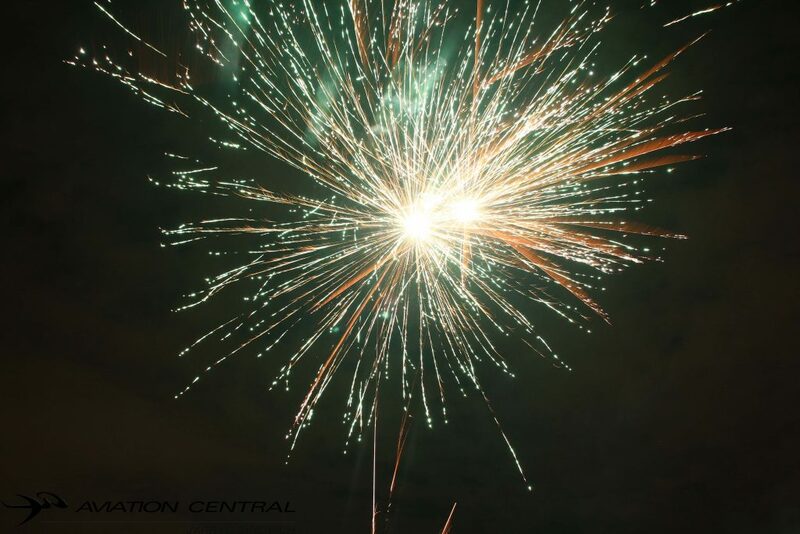 To cement the memories made. 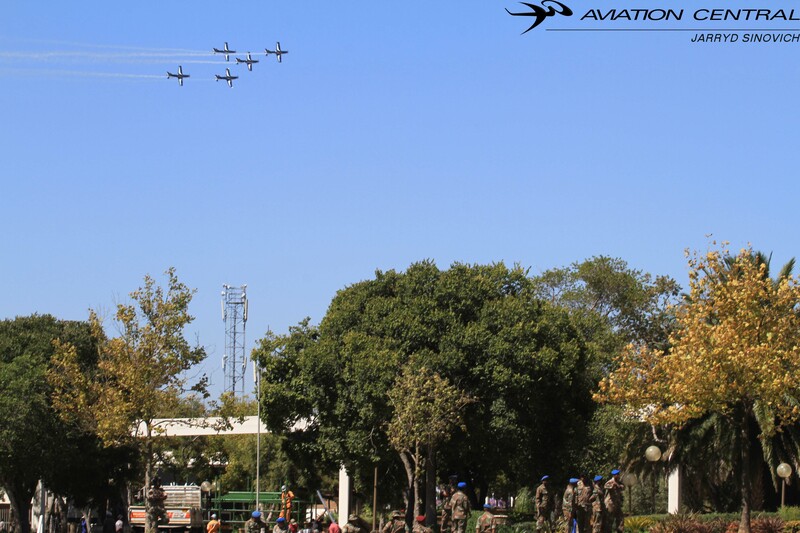 To salute an organising team and everyone involved, from pilots to ground crew and cleaning staff. 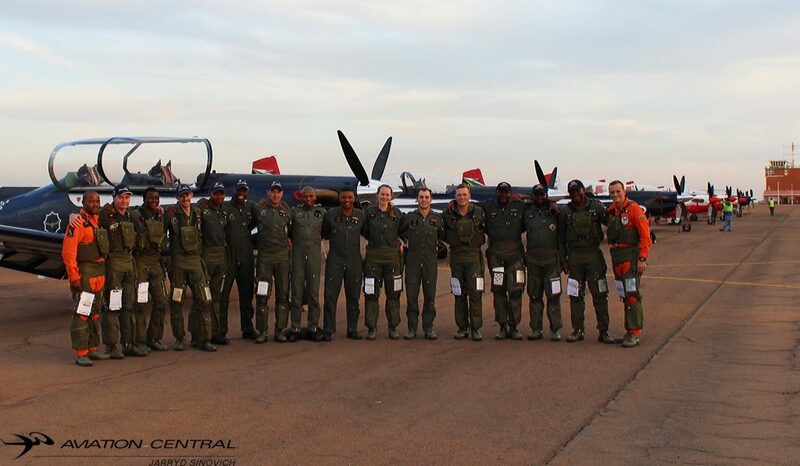 A massive thank you to all. Not even load shedding could dampen spirits or impact the show! 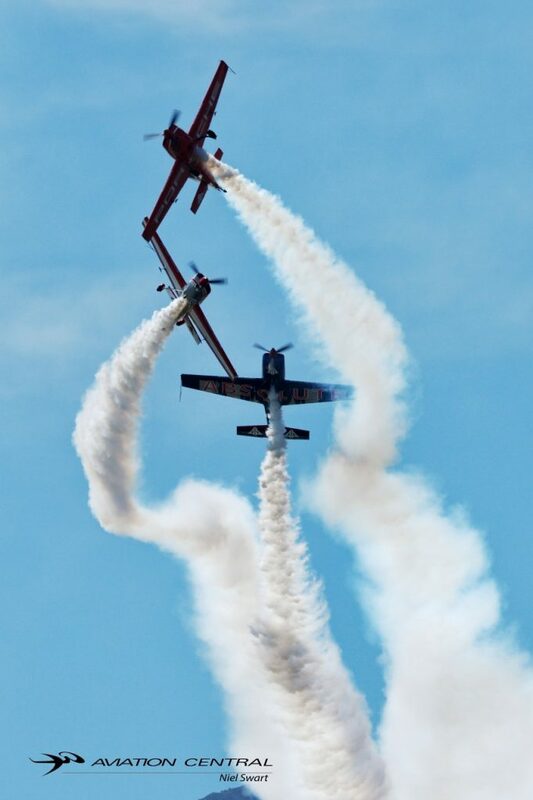 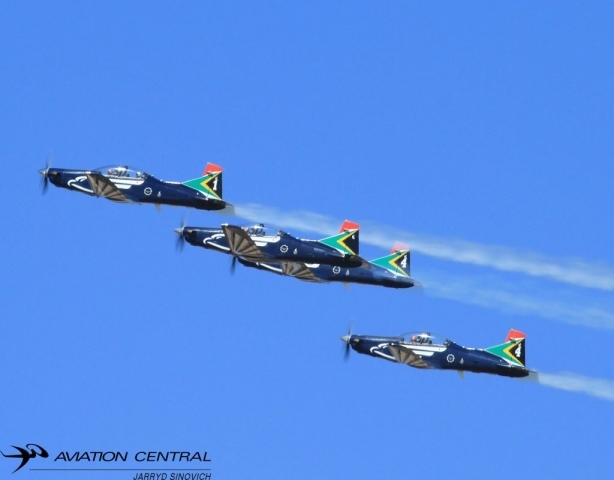 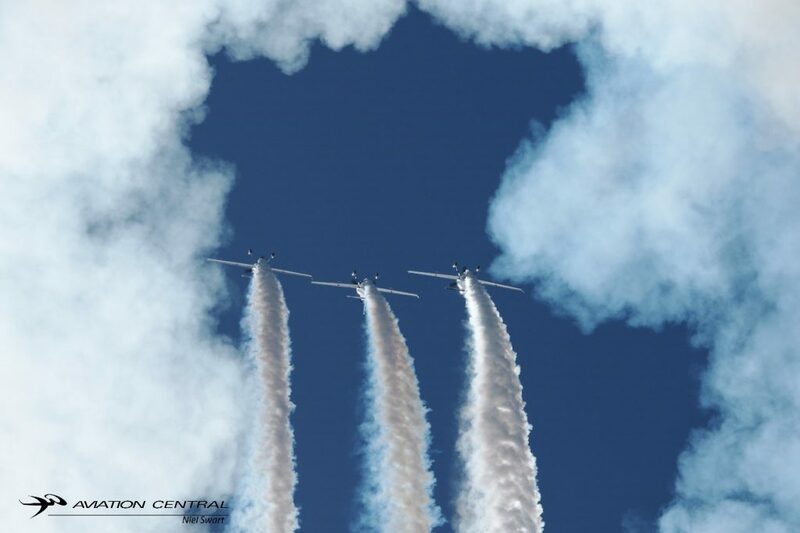 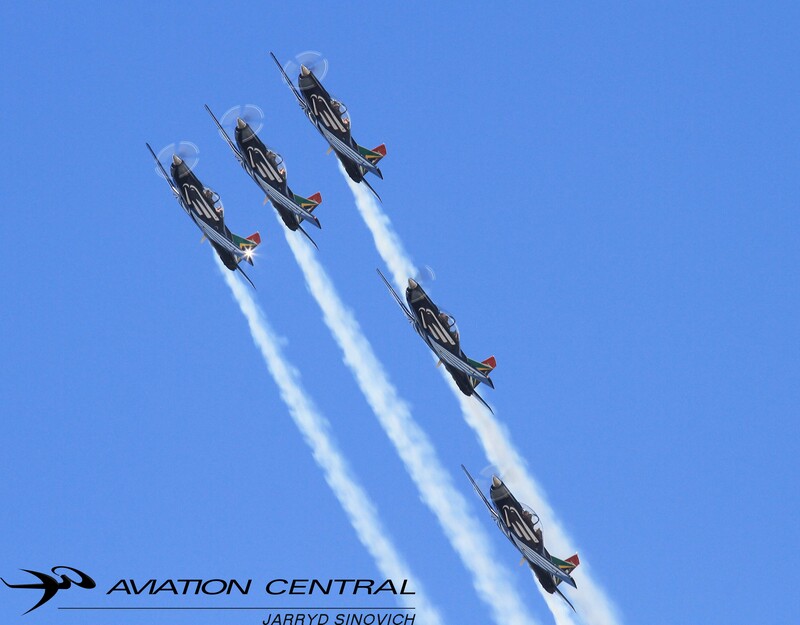 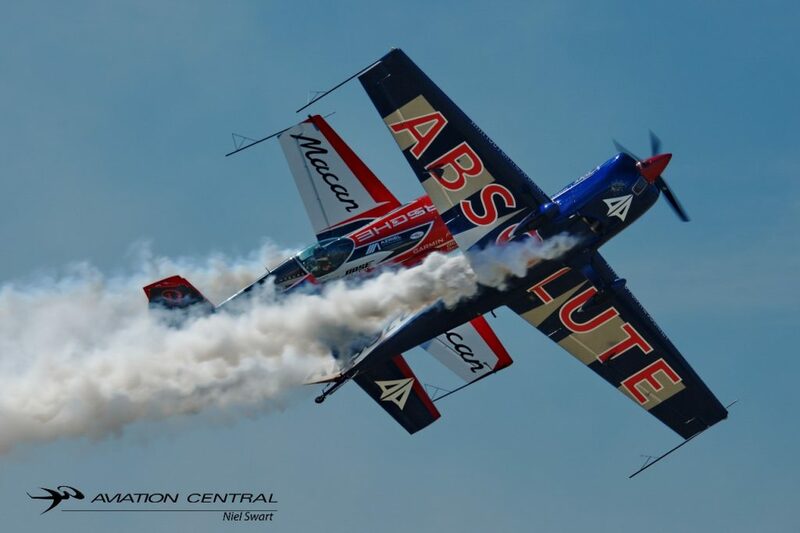 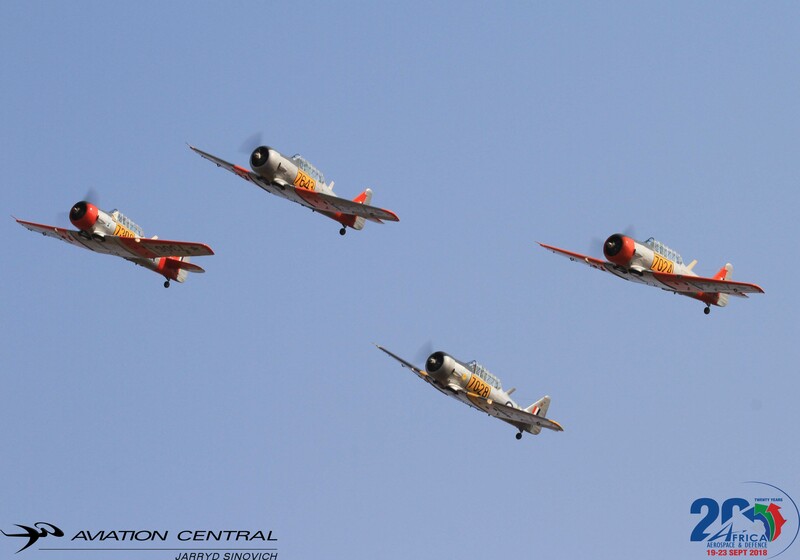 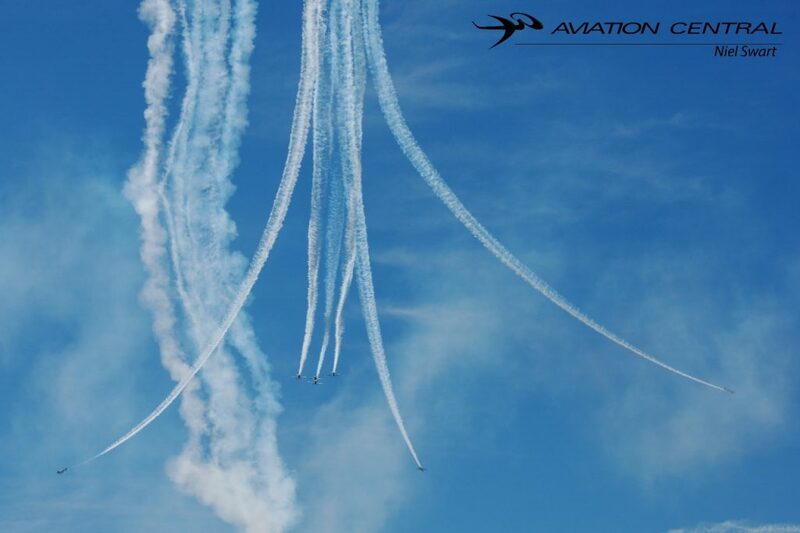 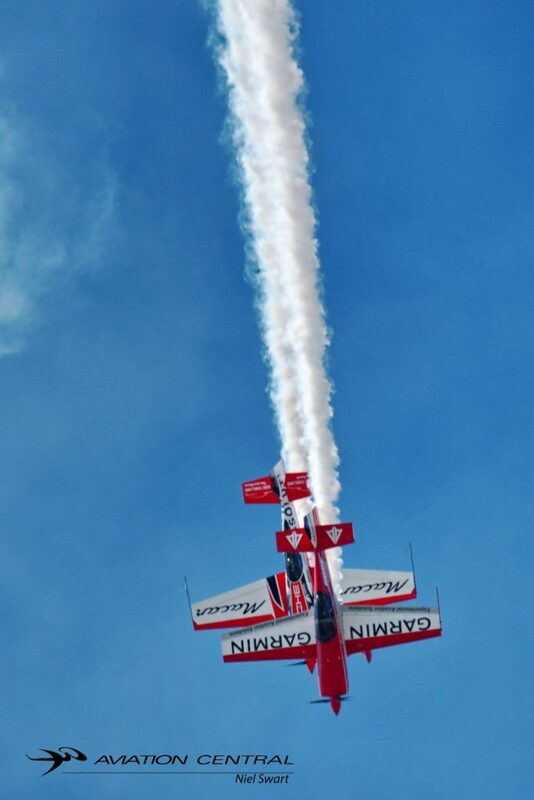 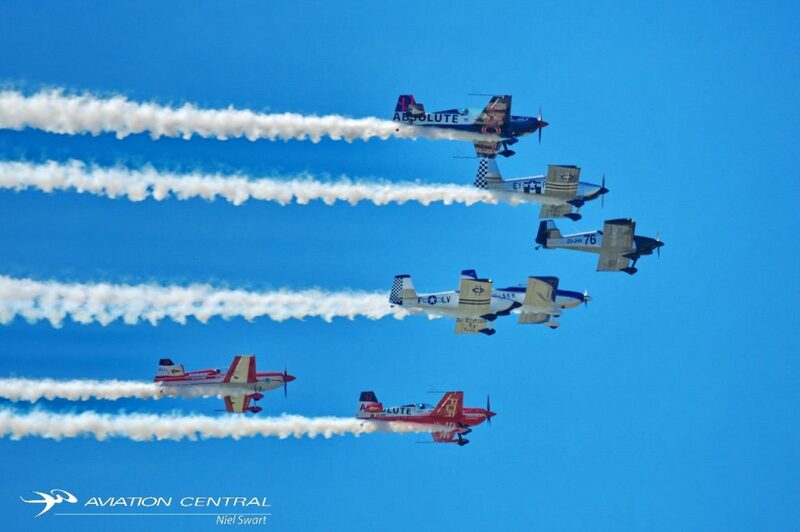 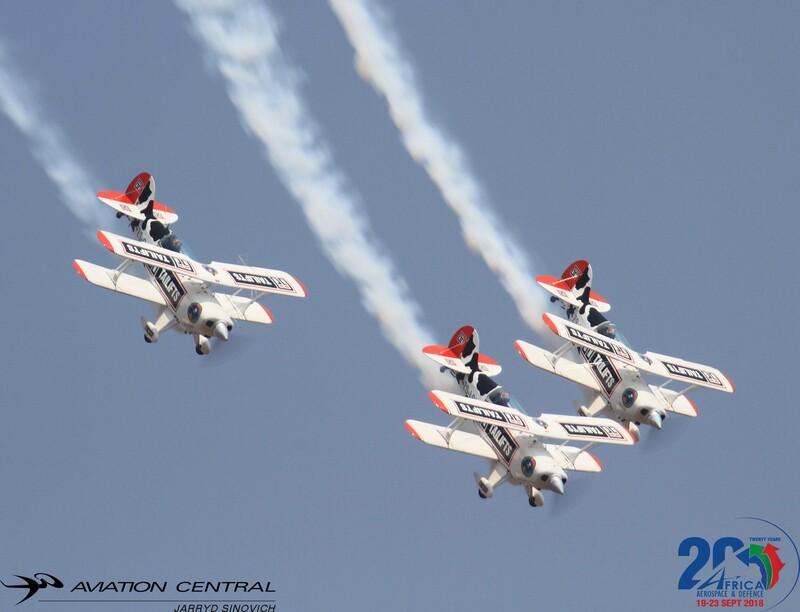 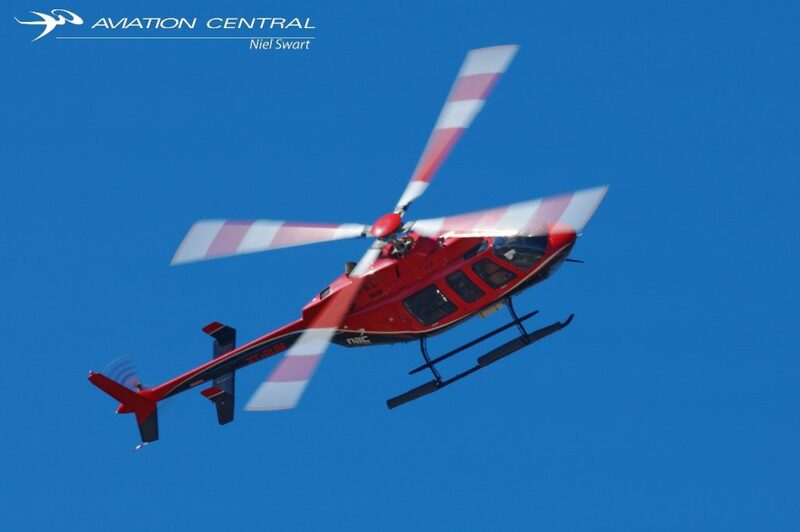 The Stellenbosch Air Show hosted by the Stellenbosch Flying Club is to be an annual event and surely one to diarise! 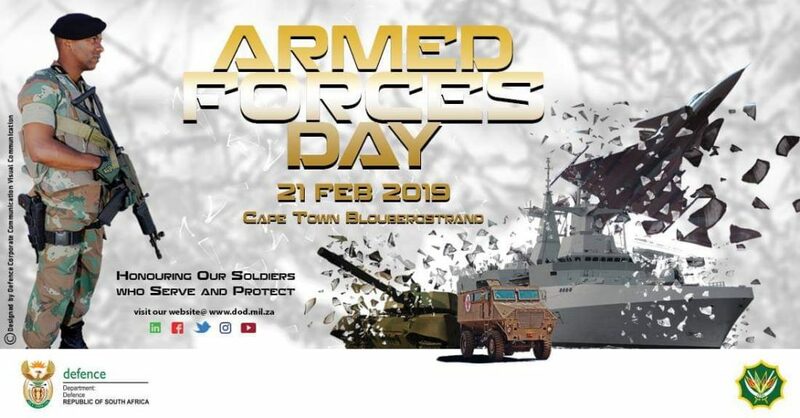 I for one will be there. 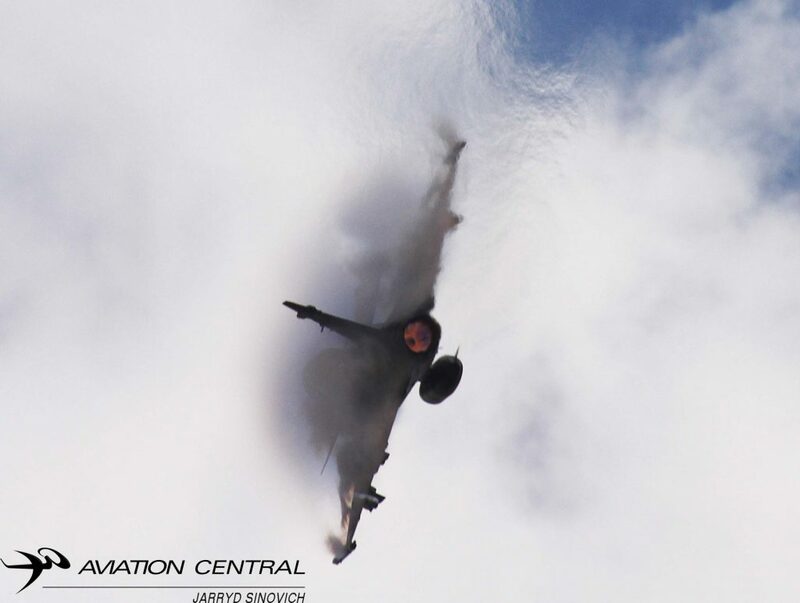 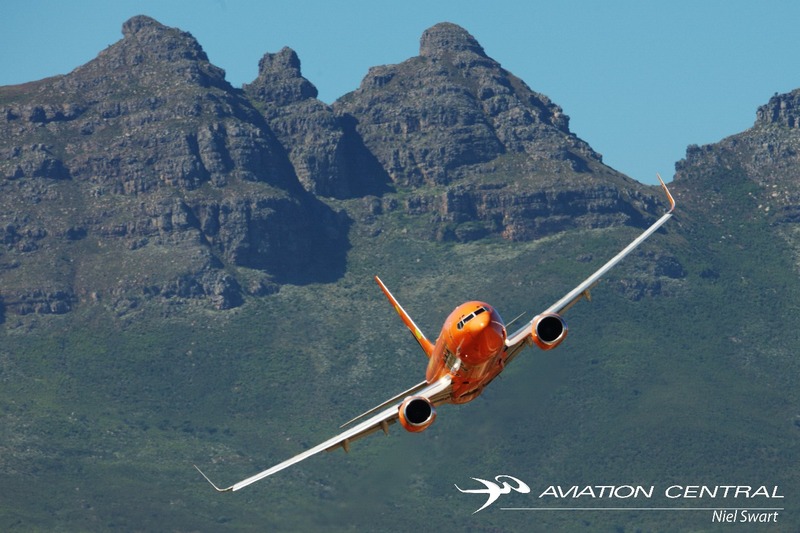 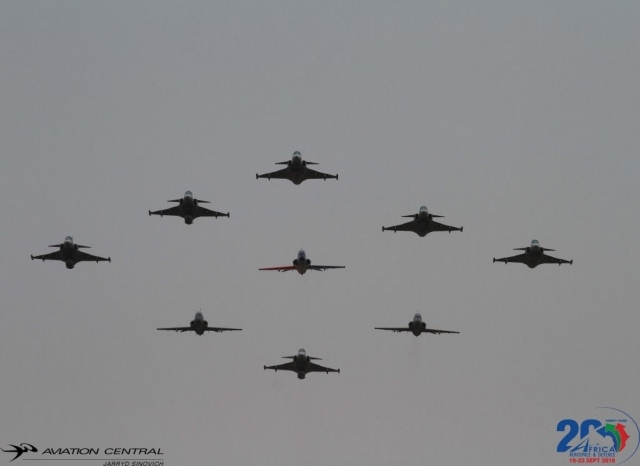 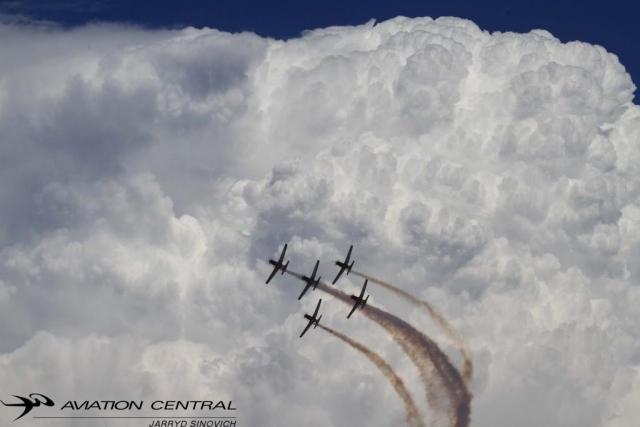 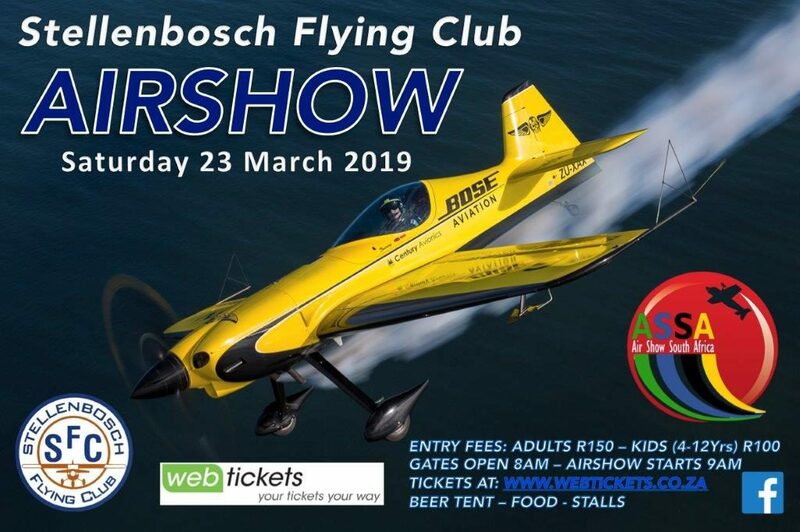 The skies over Stellenbosch are getting Busy with the Big airshow this coming Saturday, 23 March at Stellenbosch Flying Club in the Western Cape. 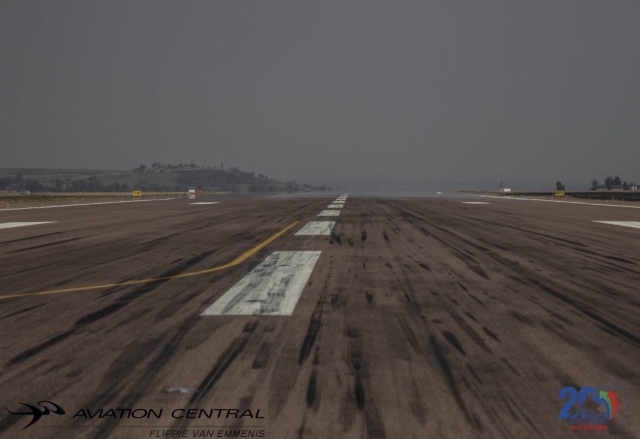 Stellenbosch hasn’t hosted an airshow since 2015,the Cape aviation enthusiast’s are sure hungry for an airshow. 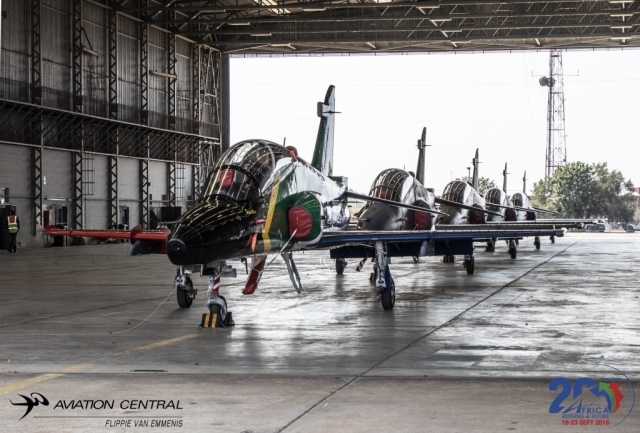 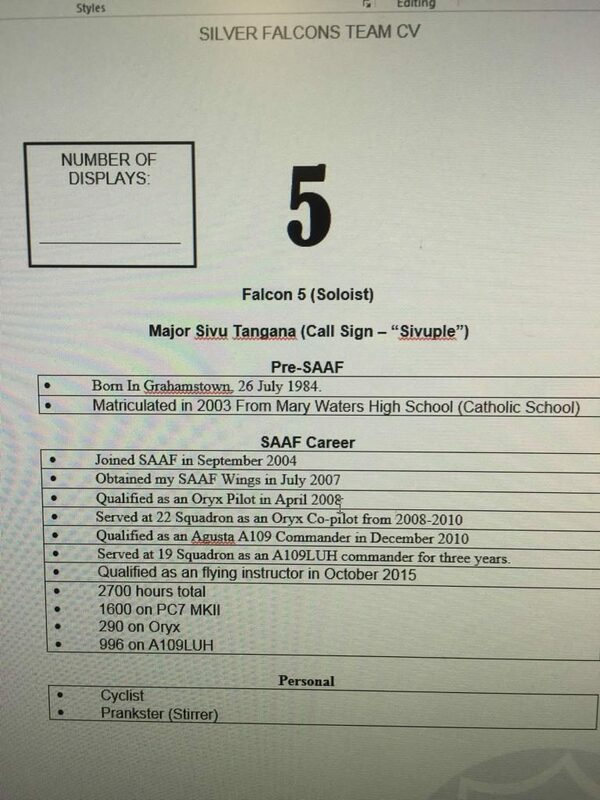 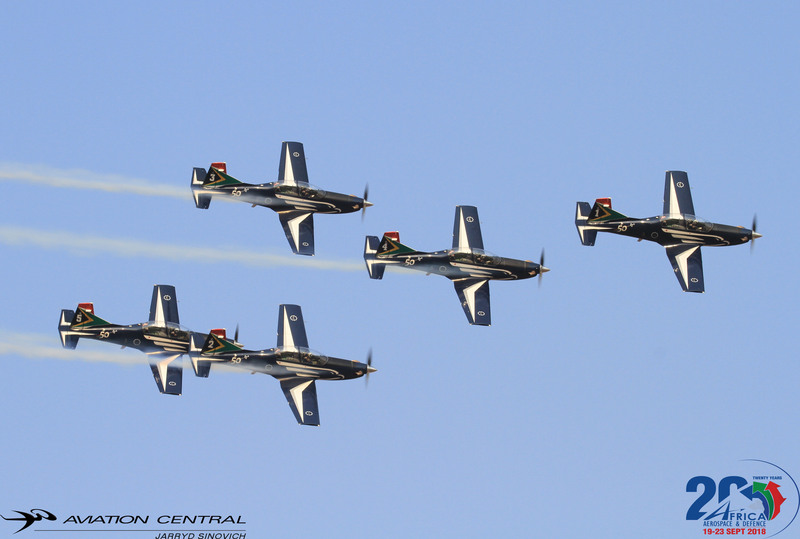 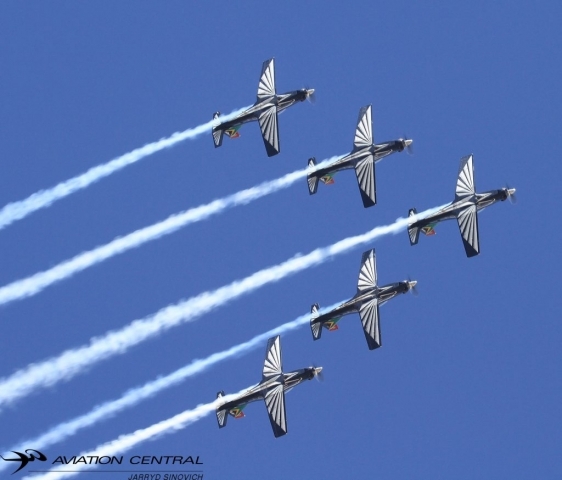 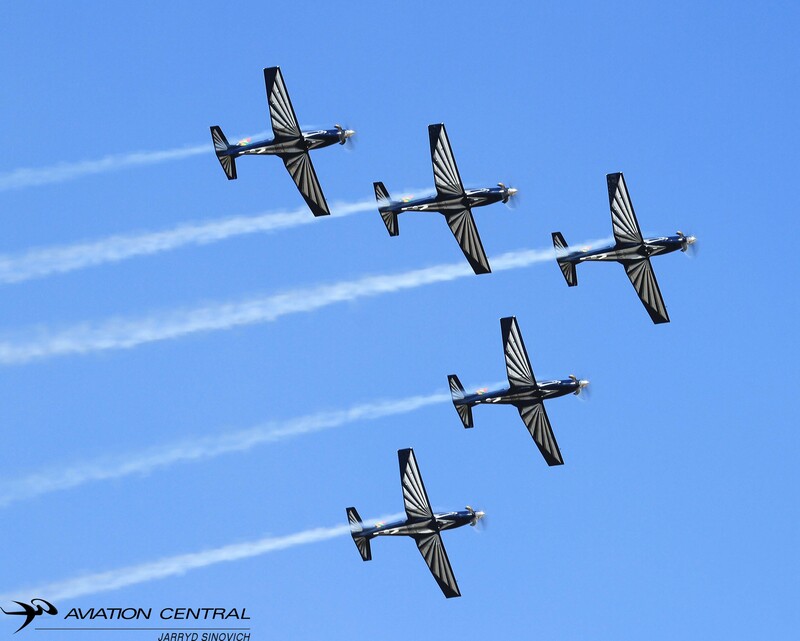 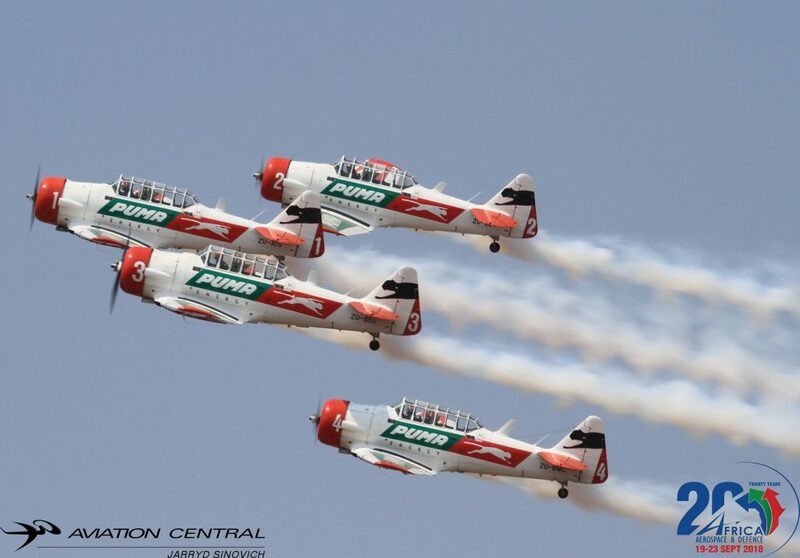 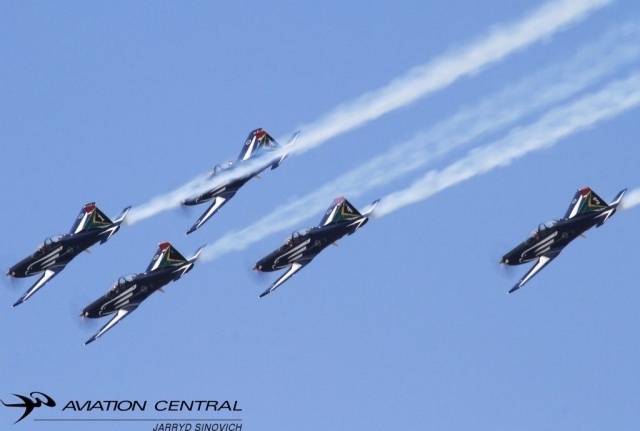 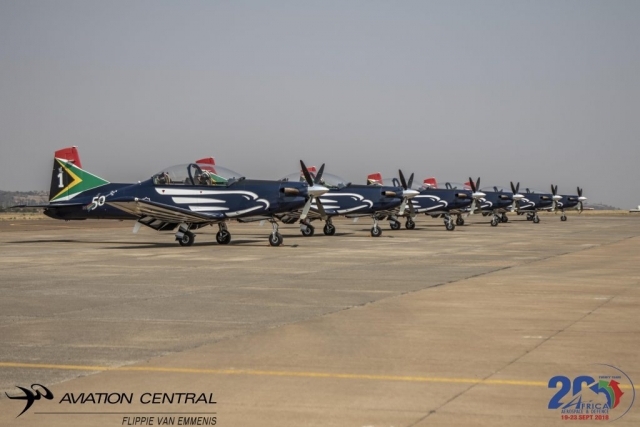 The Silver Falcons will be displaying at their first airshow for 2019 at Stellenbosch this coming Saturday under the leadership of Major Omphile Matloane. The team recently displayed at the past Armed Forces Week in Cape Town in February 2019. 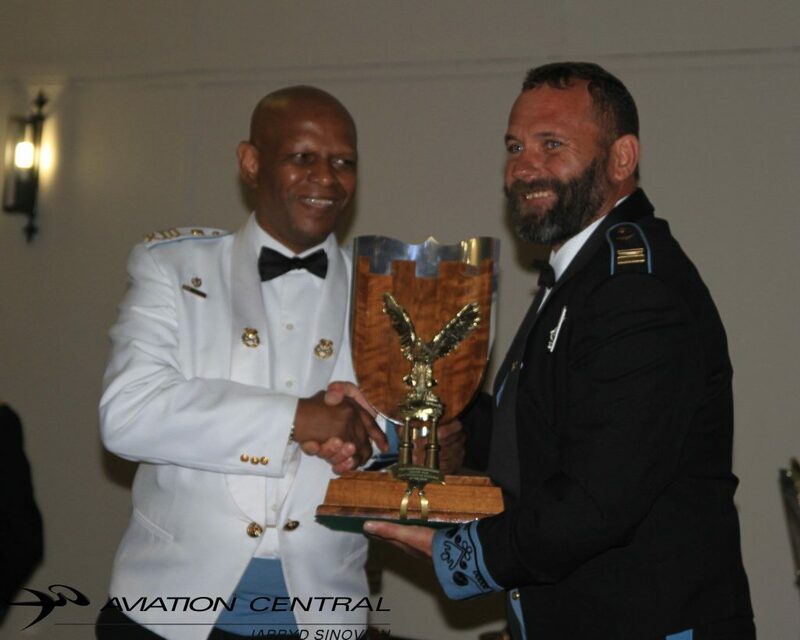 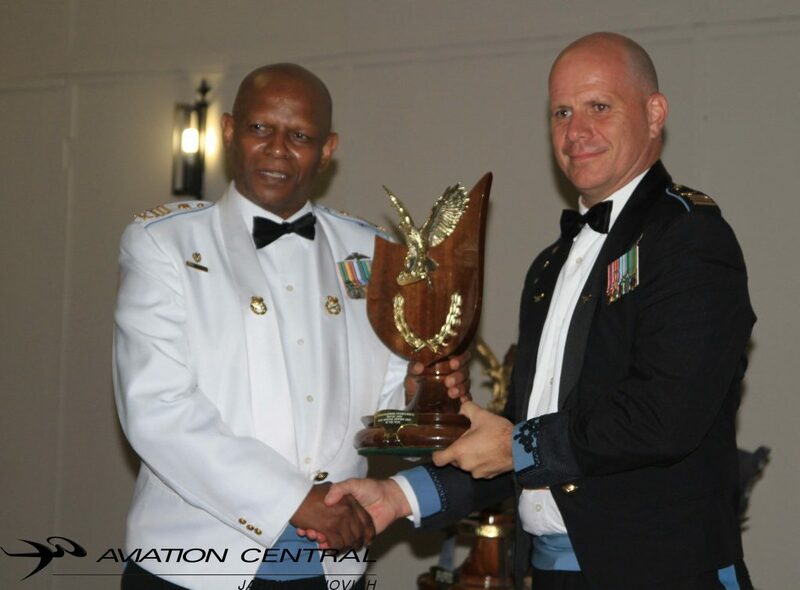 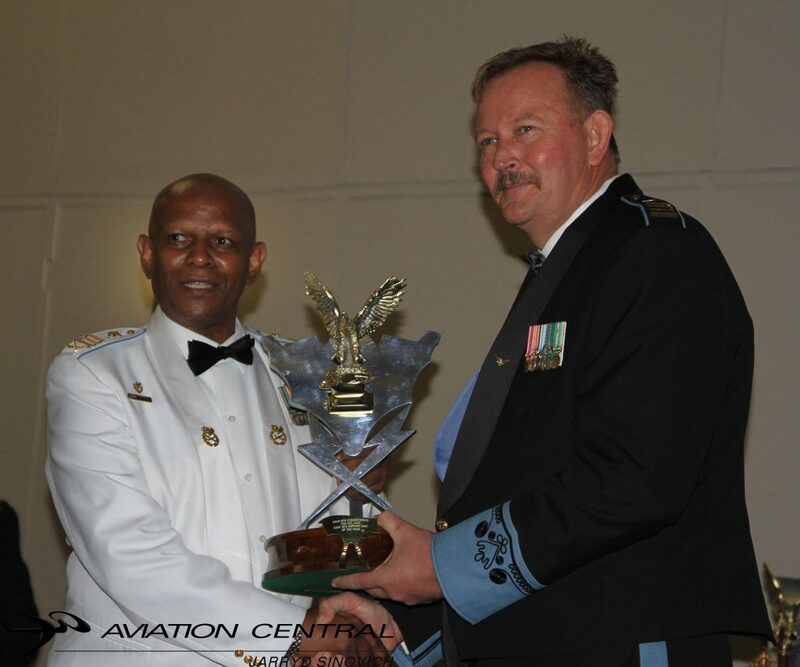 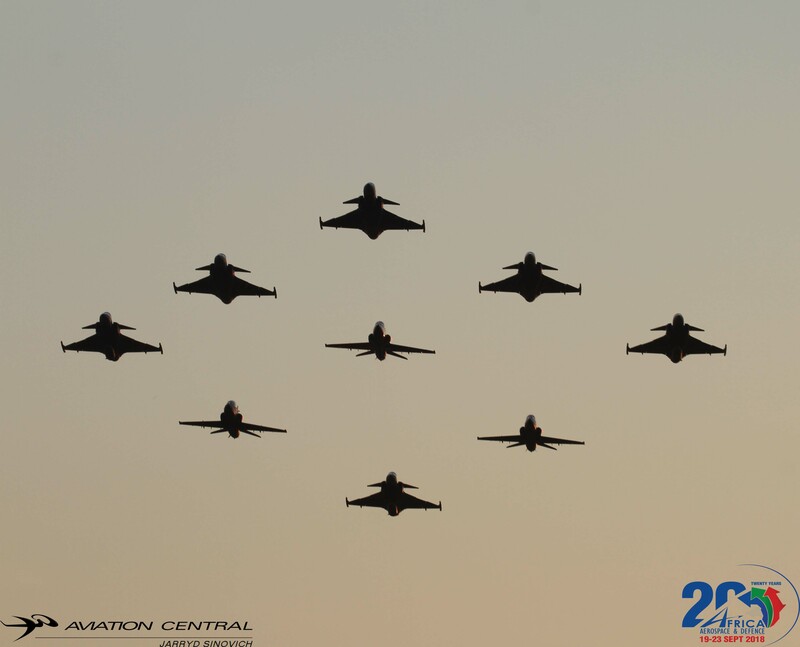 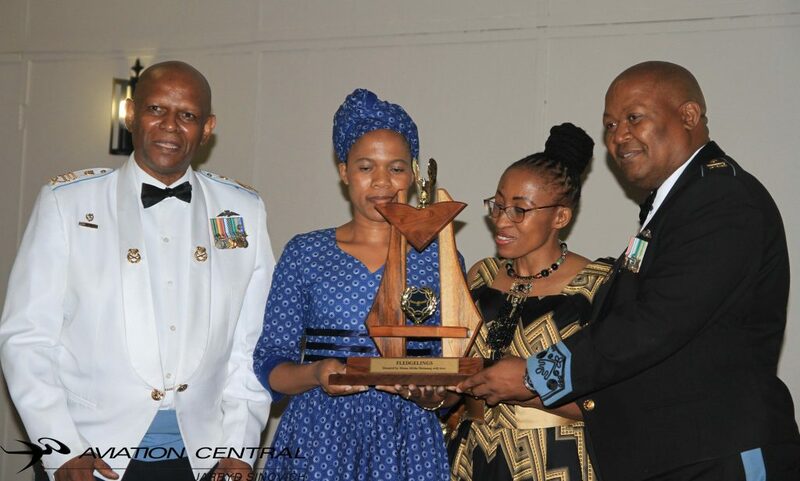 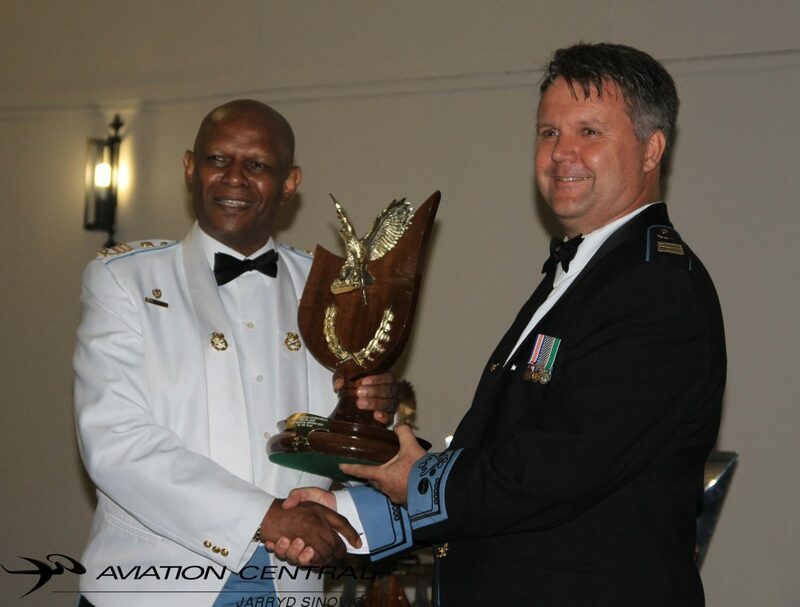 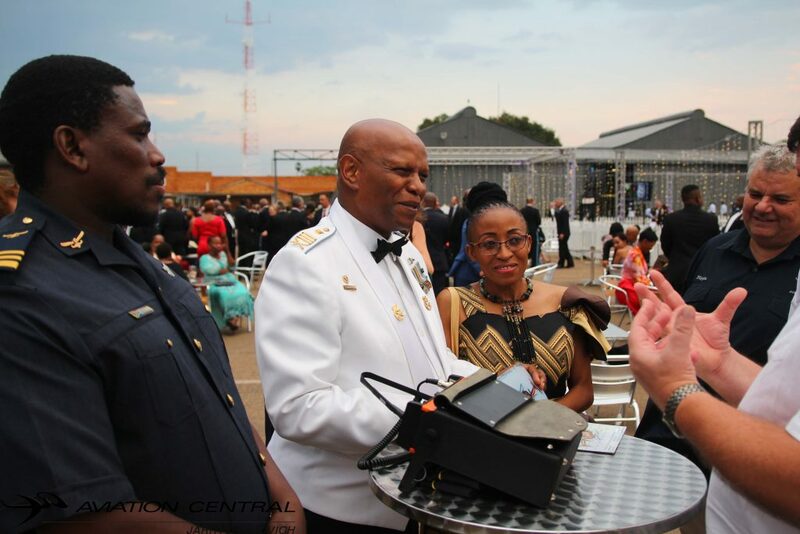 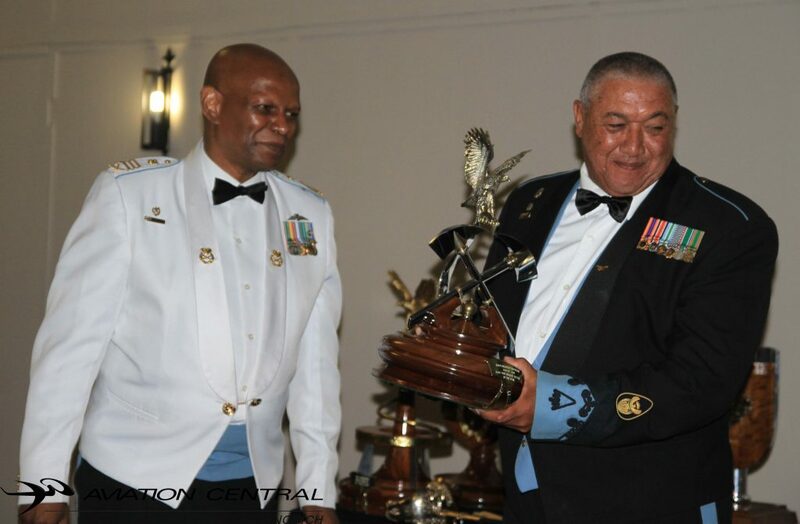 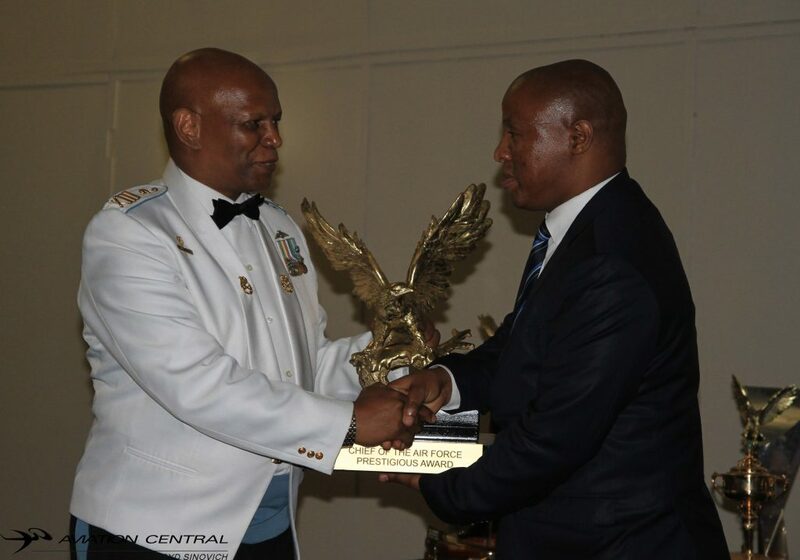 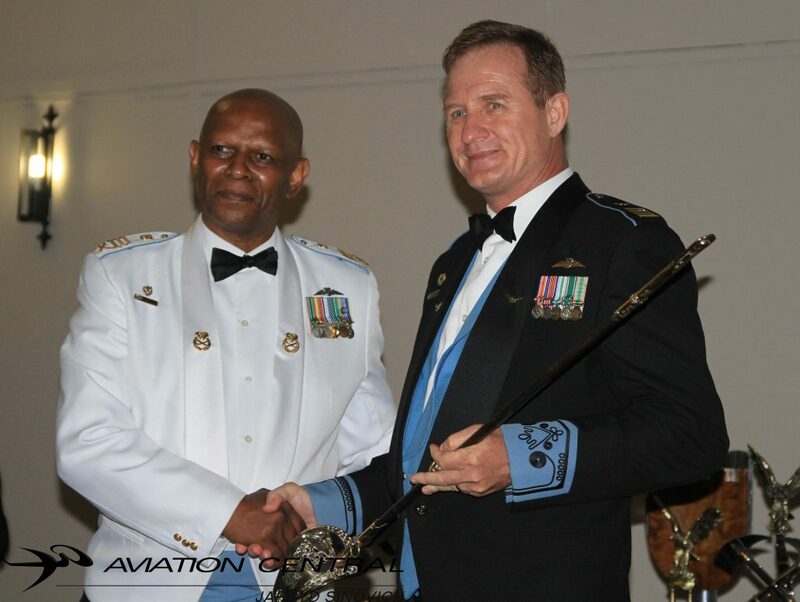 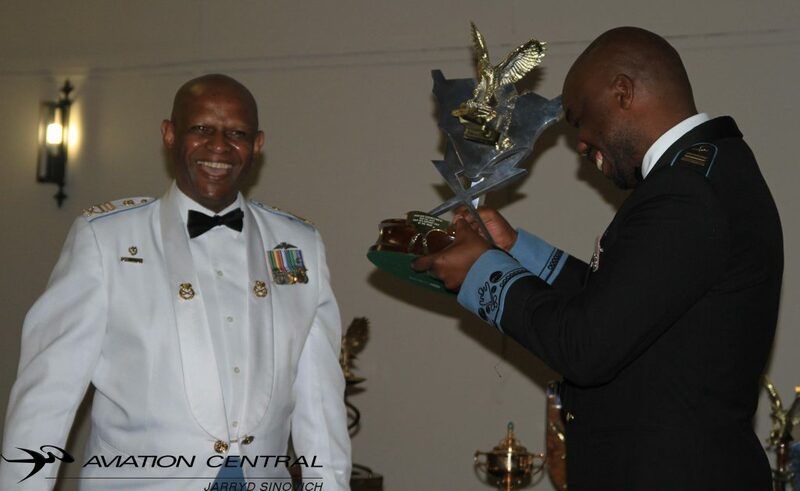 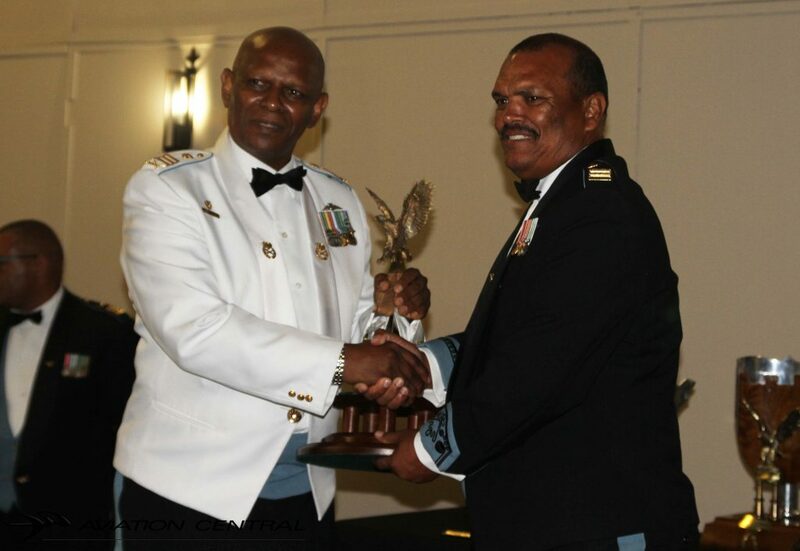 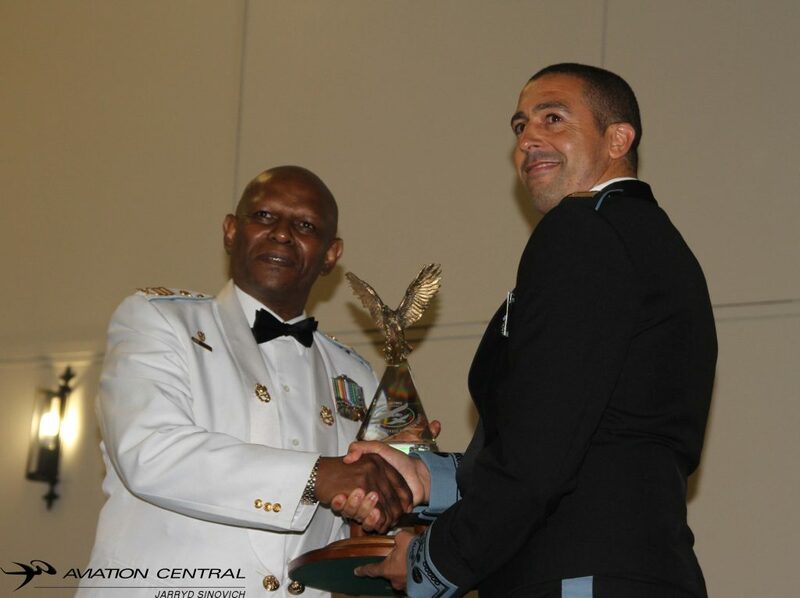 The South African Airforce held a Prestige evening awards ceremony at Airforce Base Swartkop on the 31 January 2019.The following day the Airforce was to celebrate 99 years of air power excellence. 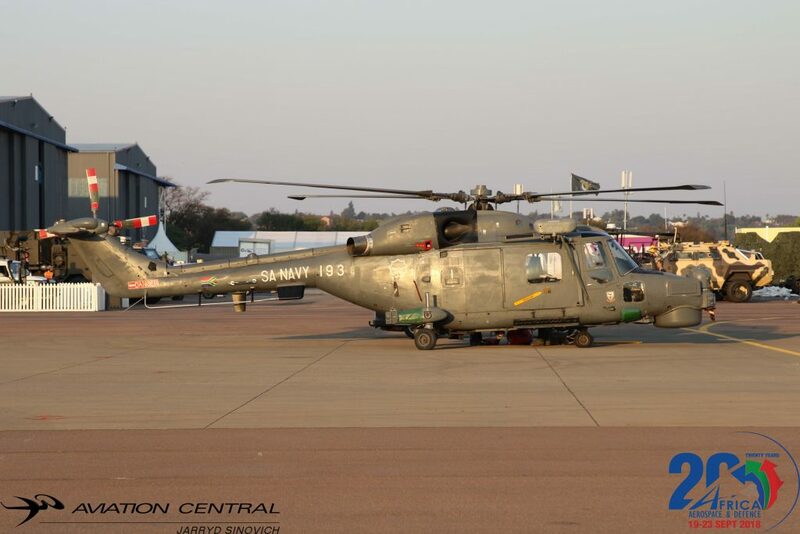 85 Combat Flying School Hawk MK120 “Gannet” on static display. 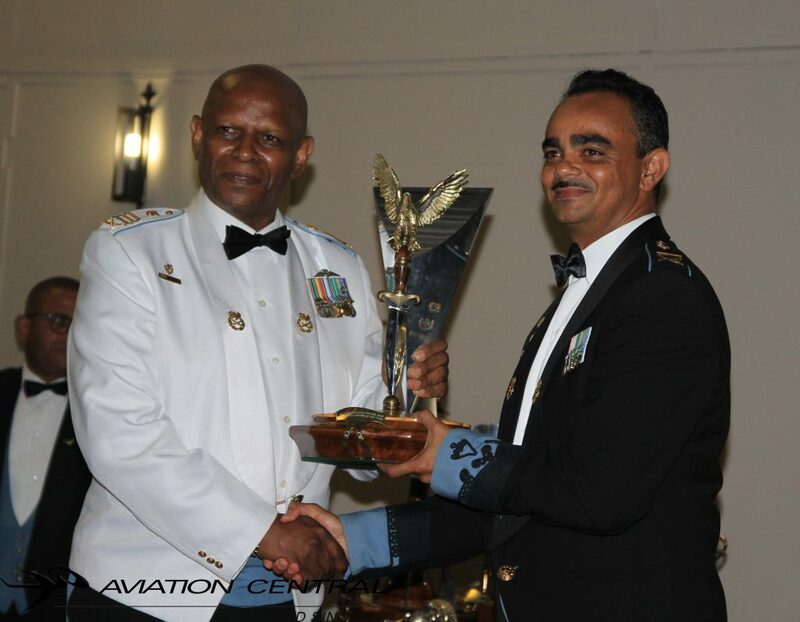 The aim of the Prestige Evening is to showcase the service excellence by bestowing honours and eminence to the sterling work the done by the different SAAF entities and individuals in their varied stations. 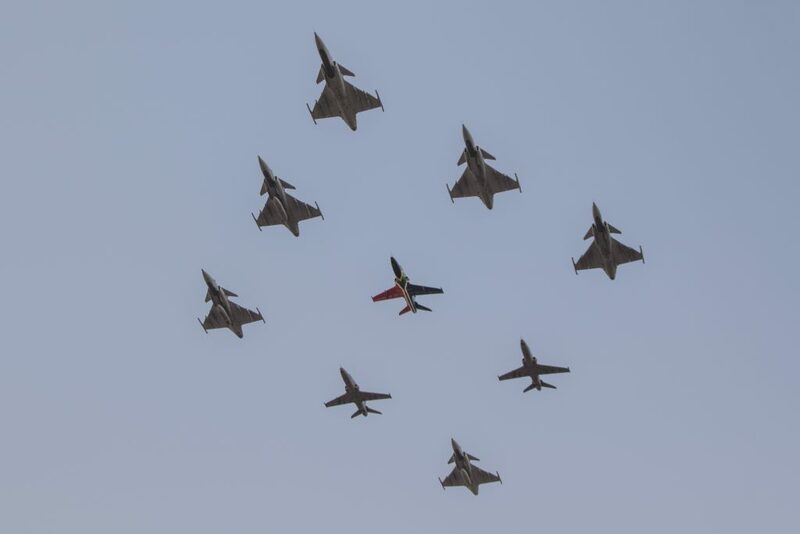 Invited guests were treated to a mini flying display by various aircraft in the South African Airforce inventory, that being the Silver Falcons led by Major Omphile Matloane ,an Oryx helicopter and the SAAF Museums De Haviland Vampire flown by Lt Col Glen ‘Gringo’ Warden. 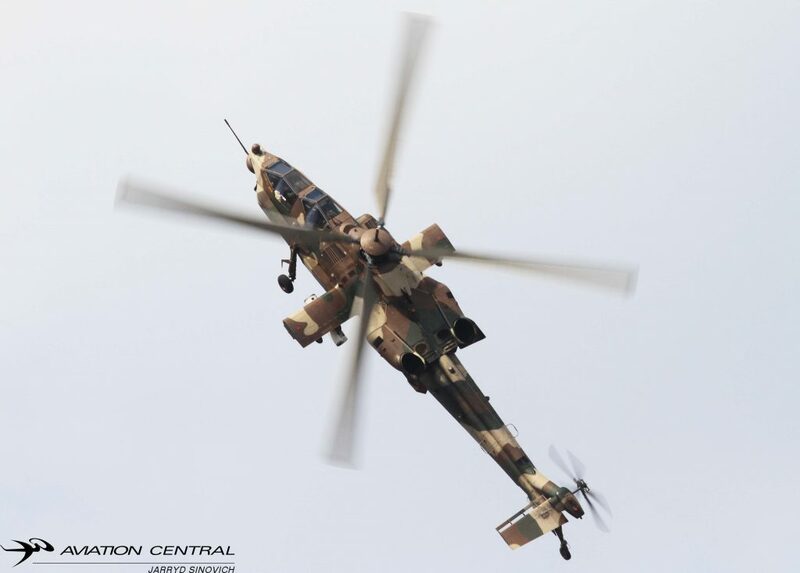 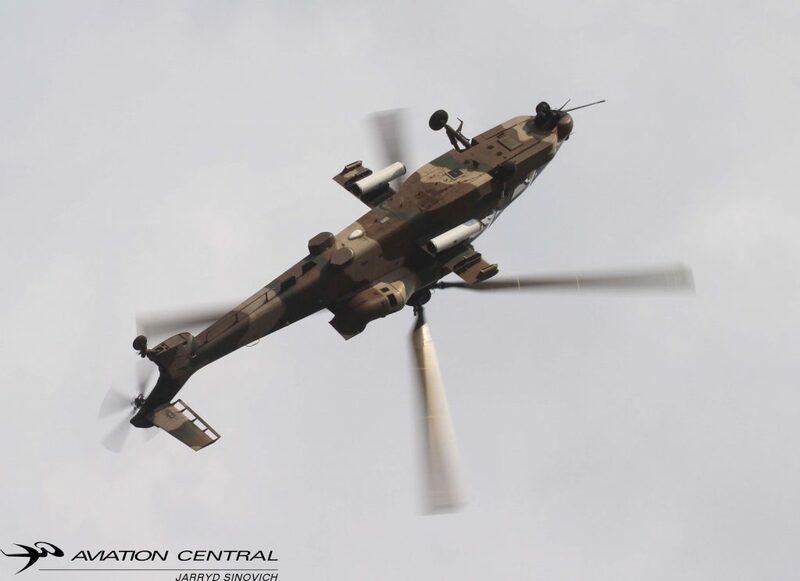 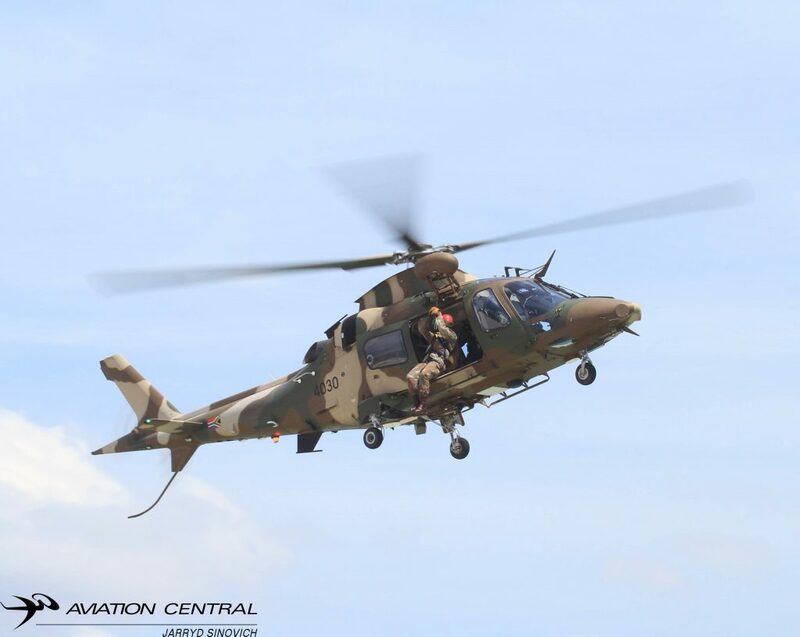 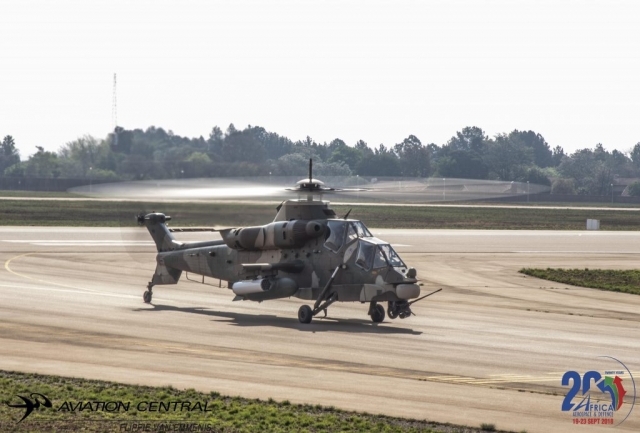 Unfortunately there was no Rooivalk display due to the helicopter picking up a snag during its validation flight earlier in the afternoon. 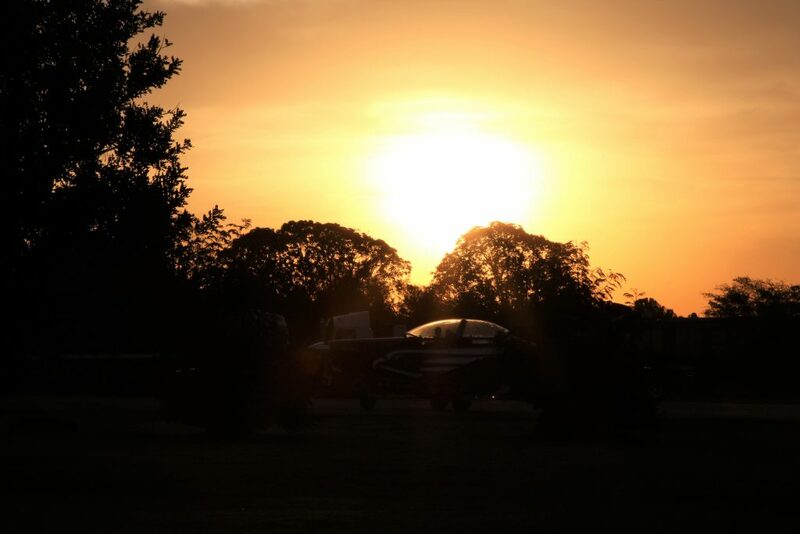 The Weather gods also didn’t agree with the evenings proceeding’s and rather made everyone move into Hanger 5 where supper and speeches took place due to the heavy rain downpour. 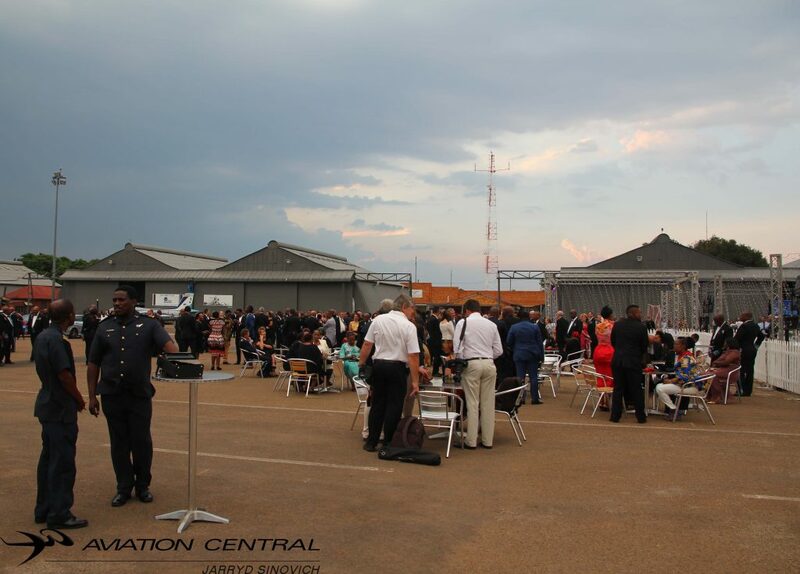 Once everyone had run for shelter due to the rain in hangar five “The Centre of Aviation Awareness Hanger ” where the to the choir entertained us until the awards ceremony began. 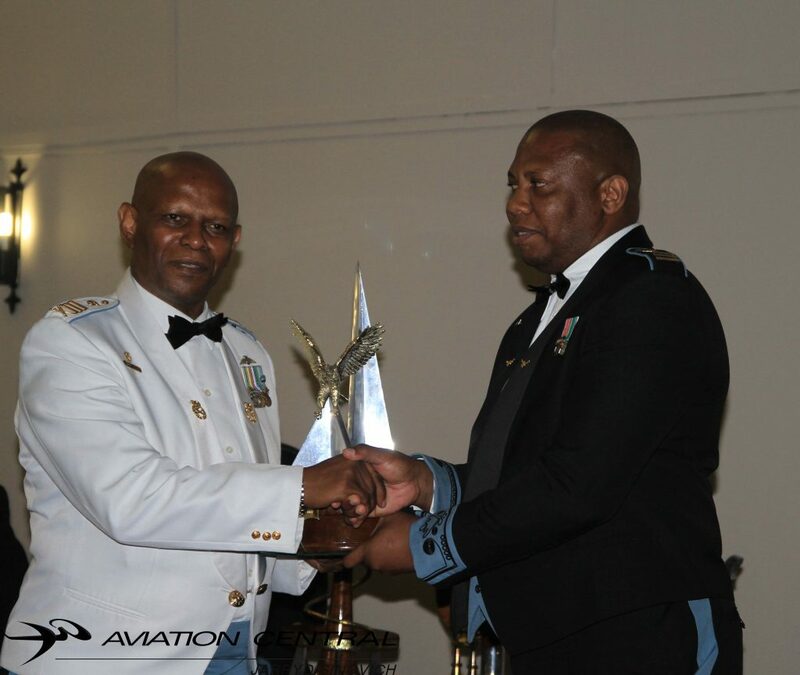 The Chief of the South African Airforce and MCs for the evening congratulated each of the following units for the outstanding contribution to making the organisation a successful team in their different roles they’re play in the SAAF. 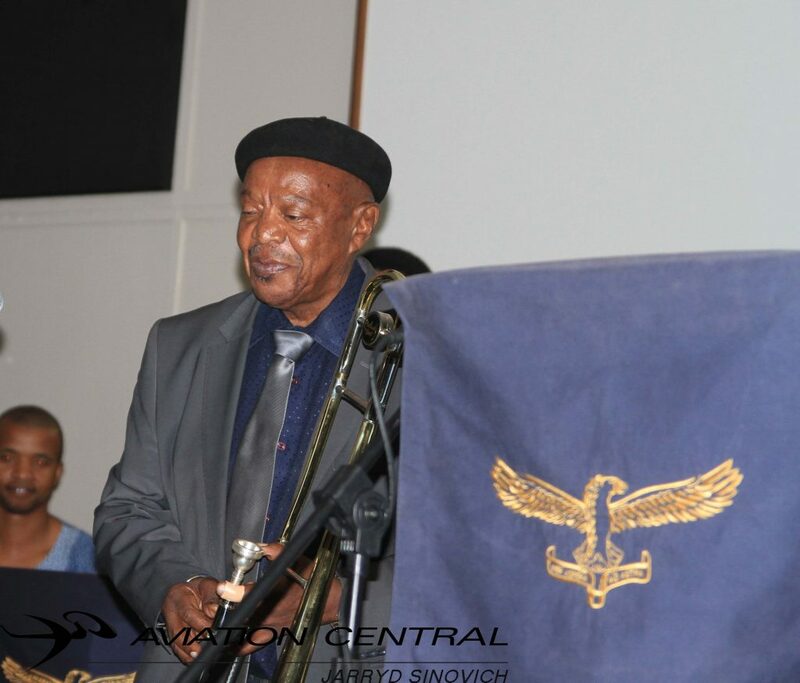 Jonas Gwangwa. 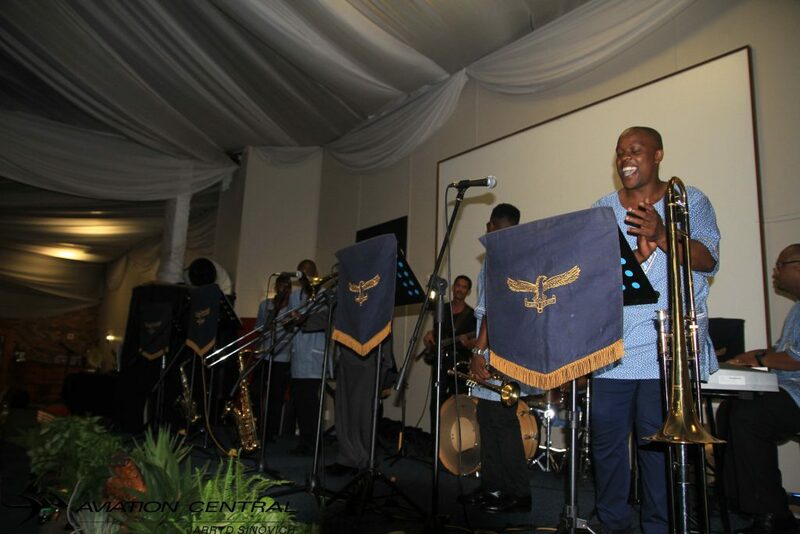 He has been an important figure in South African jazz for over 40 years. We would like to say thank you to the South African Airforce for their hospitality and to the Chief of the SAAF for welcoming us to the event personally.We wish the SAAF a great and safe year ahead. 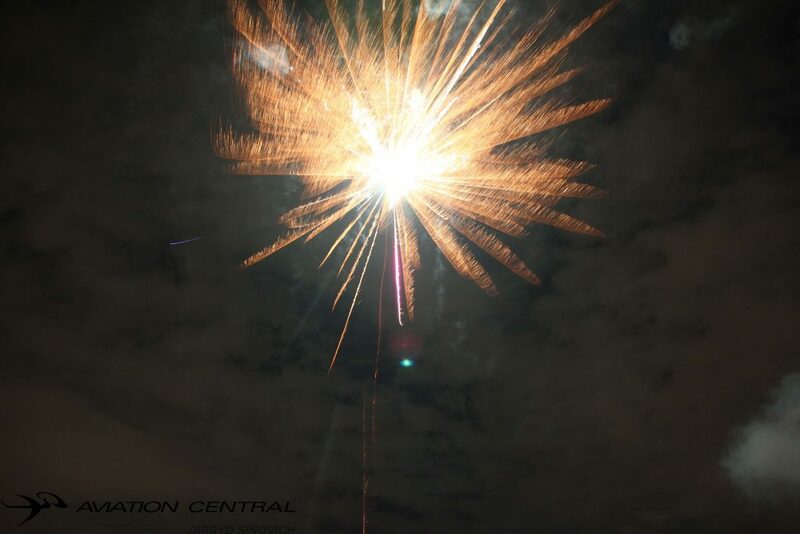 The evening ended with a spectacular fireworks display. 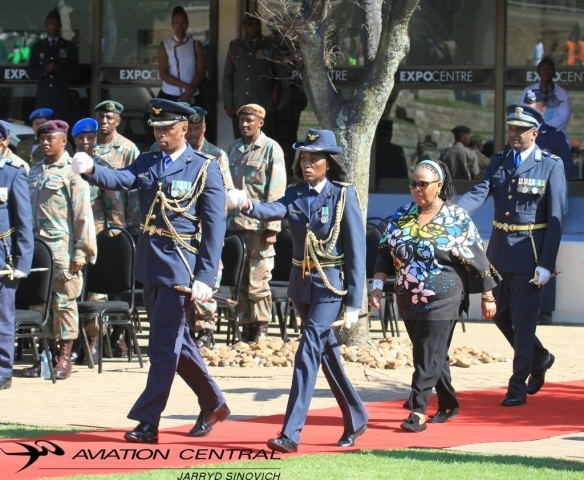 The Chief of the SAAF Lieutenant general Fabian Zimpande Msimang and his wife Ms Afrika Msimang enjoying their copy of their 2019 edition of Aviation Centrals Calendar. 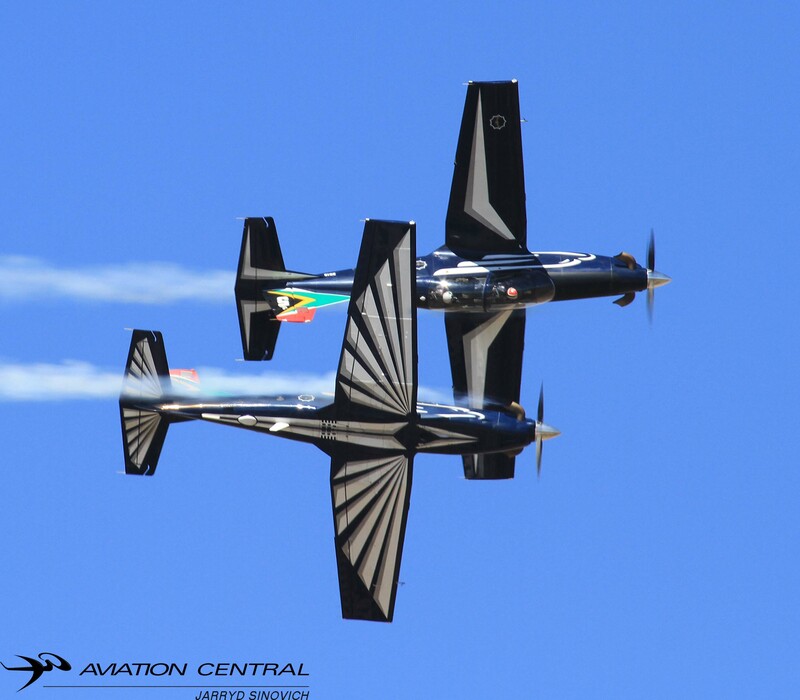 2018 has come and gone and saw some fantastic airshow displays across Southern Africa. We trust all our followers had a great festive season and some well spent time with loved ones! 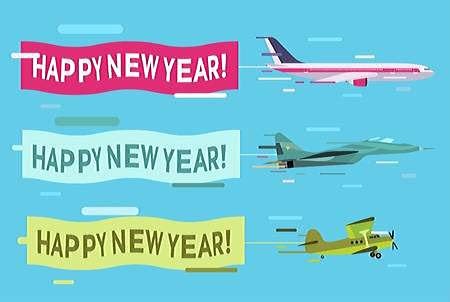 We would like to wish all our followers a Happy New Year to you and your loved ones,2019 we should have a busier year with some action packed return events on the airshow circuit this year. 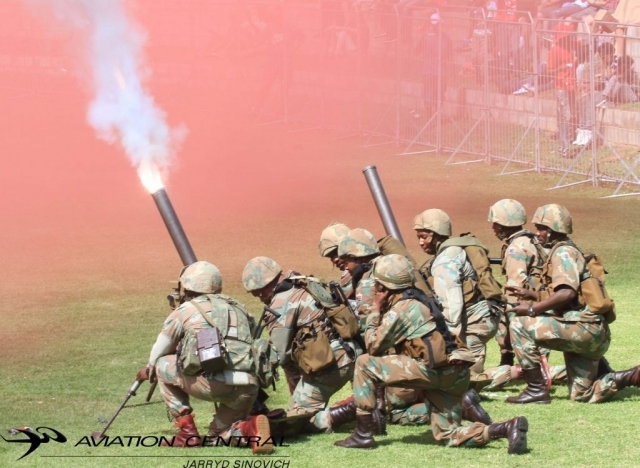 Armed Forces Day which was held in Kimberly Northern Cape had a major SANDF presence, we were lucky enough to be invited to the Weapons Demo at De Brug Weapons Range in Bloemfontein. 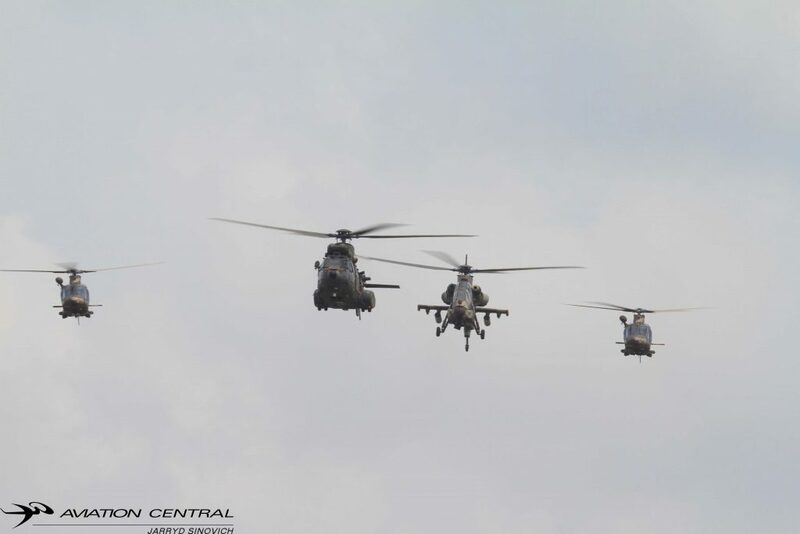 We got to witness all forms of Fire Power from all the South African National Defence Force. 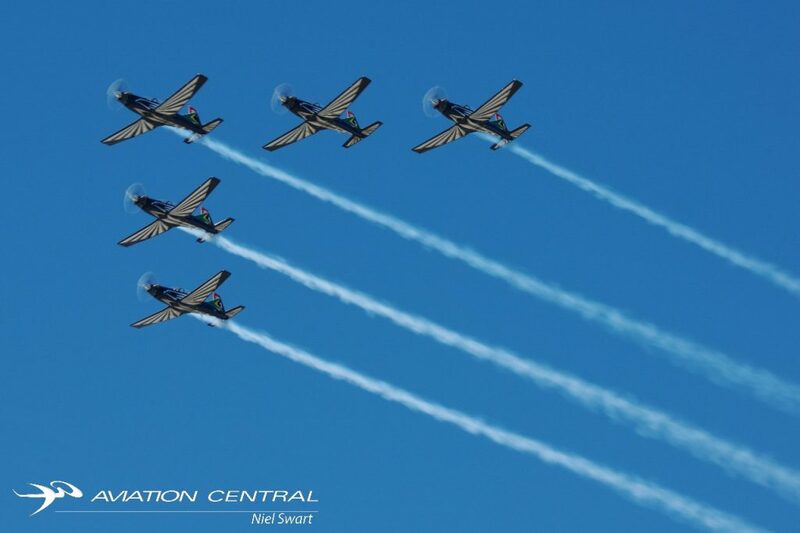 Race for Rhinos saw our team make way to Sua Pan in Botswana, we made our 3 hour journey up from Wonderboom Airport onboard Little Annie AN2.And got to witness the worlds biggest air race, with all funds raised going to supporting Africa’s Endangered Rhino! 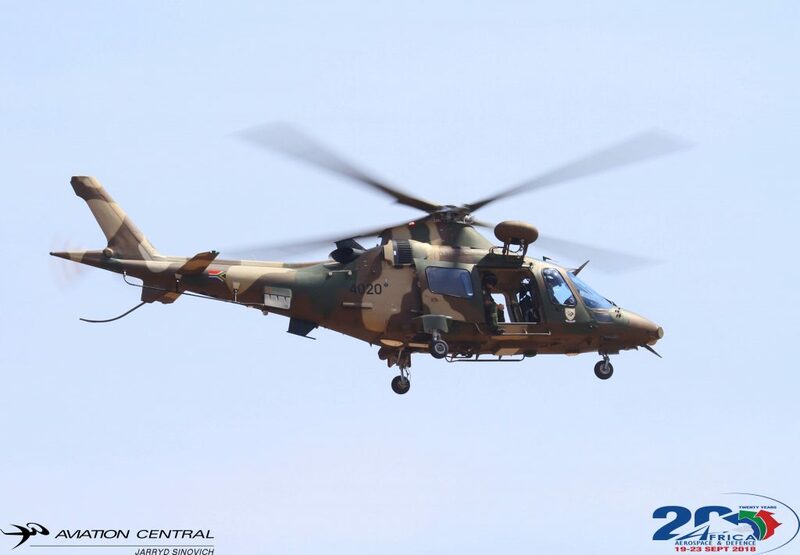 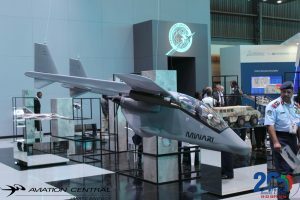 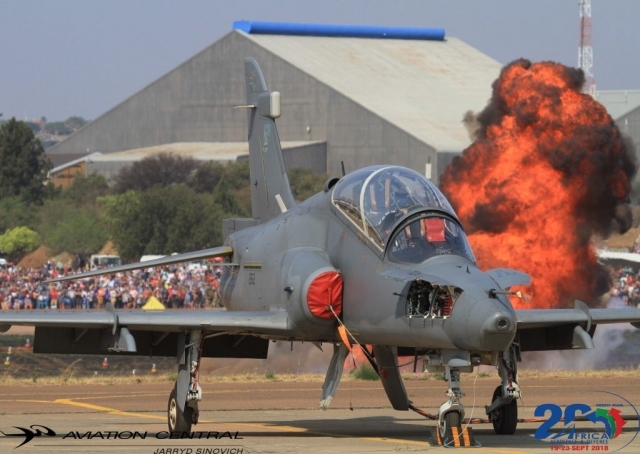 The Africa Aerospace and Defence show at AFB Waterkloof was a major success and I’m sure we all waiting for the 2020 edition of the show. 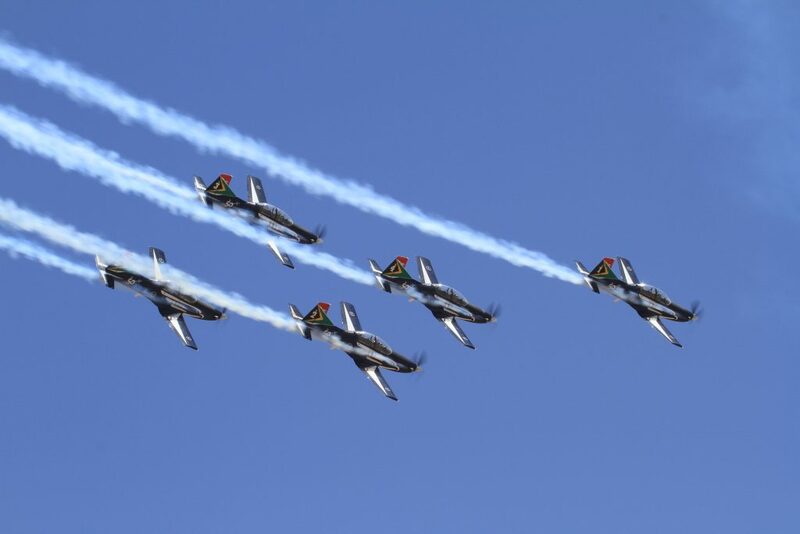 Before any airshows take place the boys and girls in the Cape must get ready for Armed Forces Day which will be taking place in Bloubergstrand. 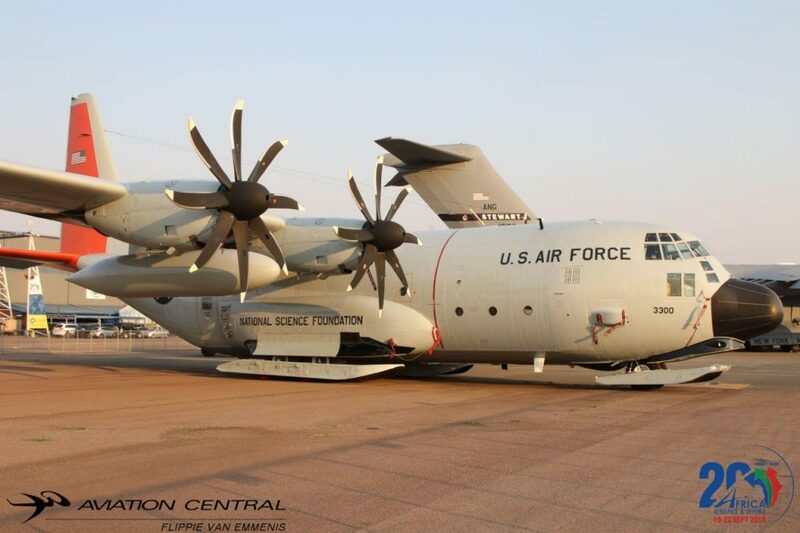 Many types of SAAF aircraft will be keeping Capetonians eyes to the sky. 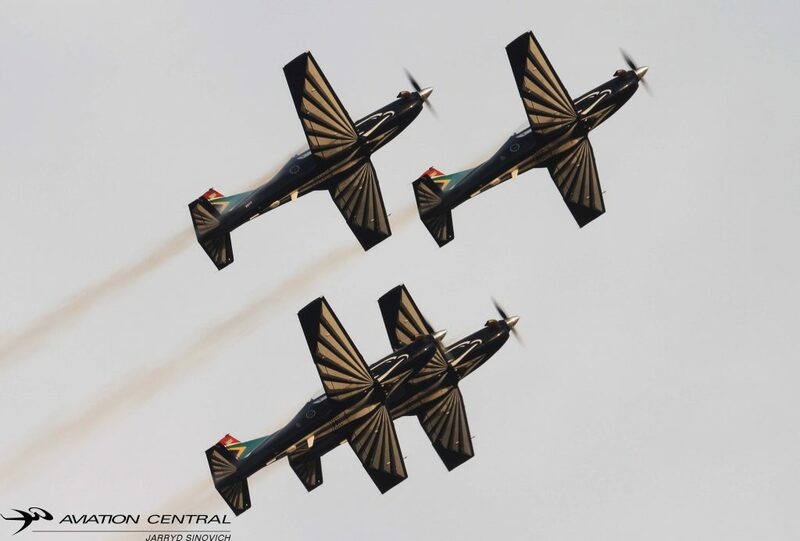 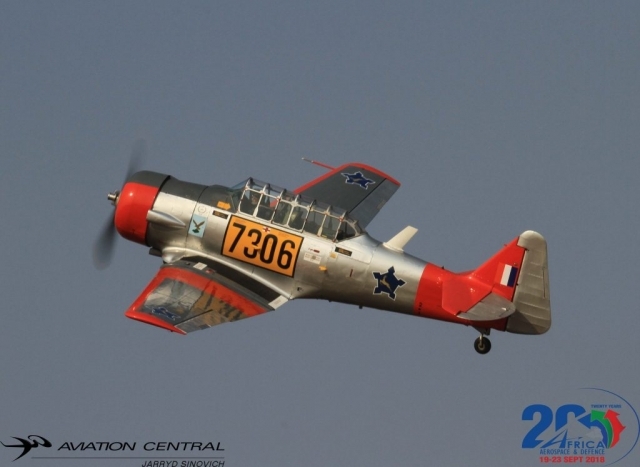 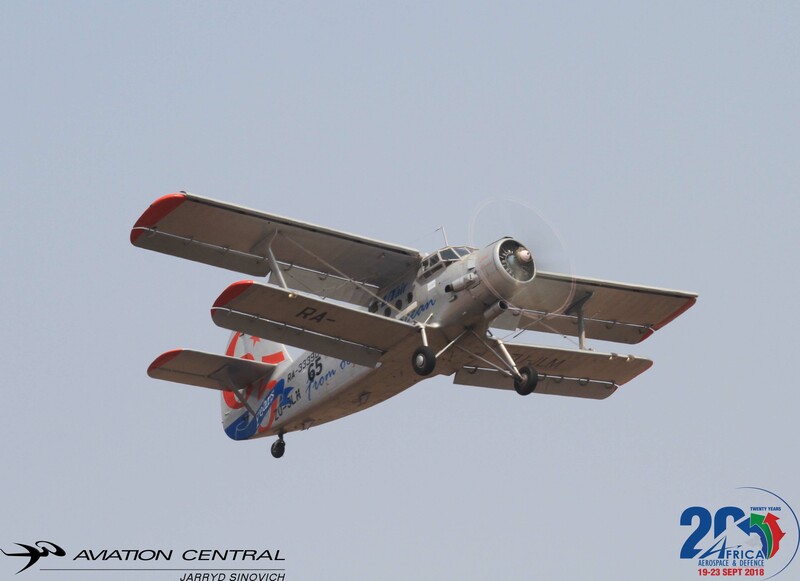 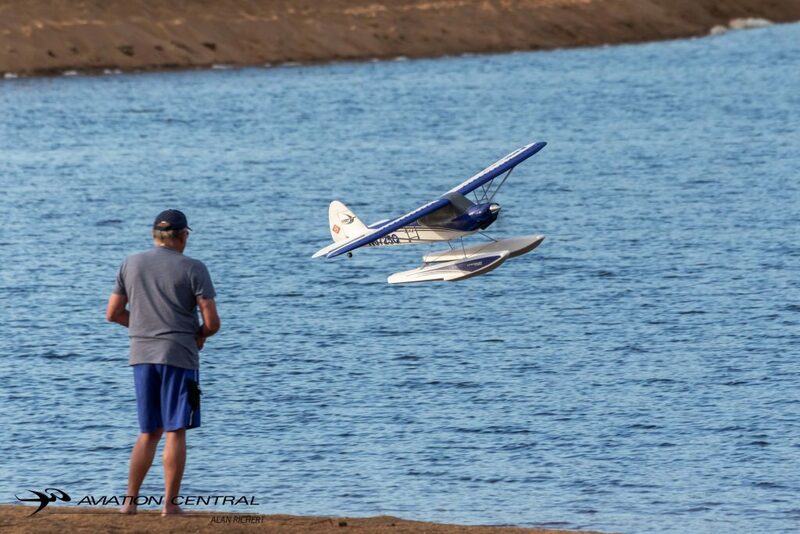 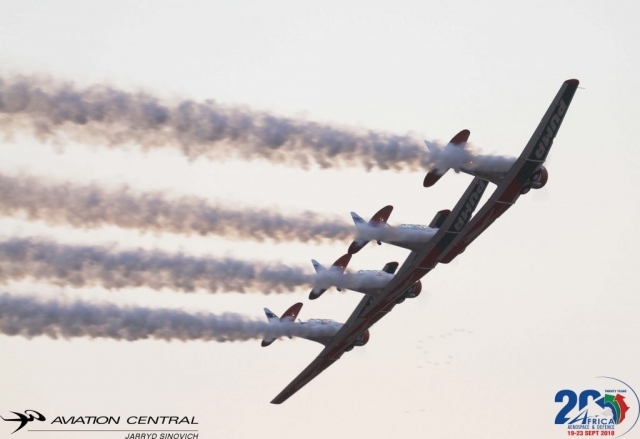 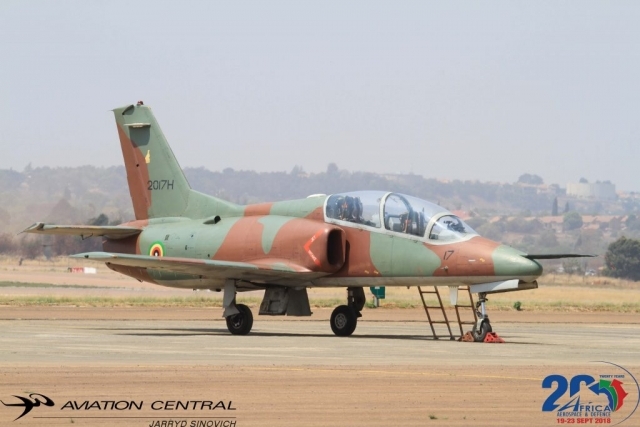 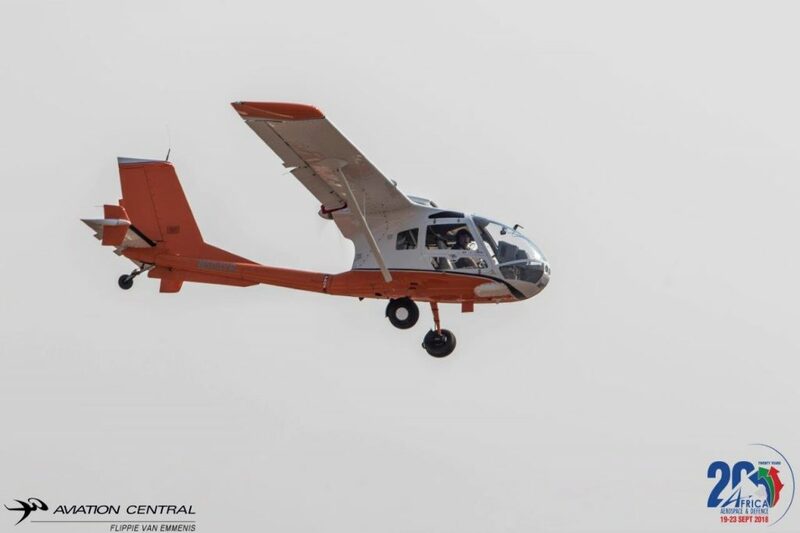 2019 airshow season will be kicking off with the Middelburg Airshow and Aeroclub-Air Week at Middelburg Airfield in Mpumalanga from 7-10 March 2019. 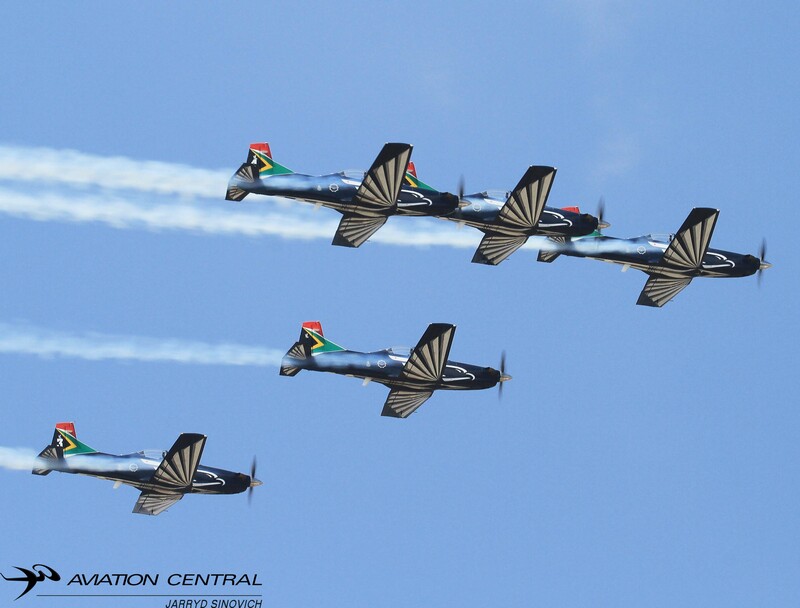 The country airshows are always a favourite and access to aircraft and pilots is always a guarantee among the crowds. 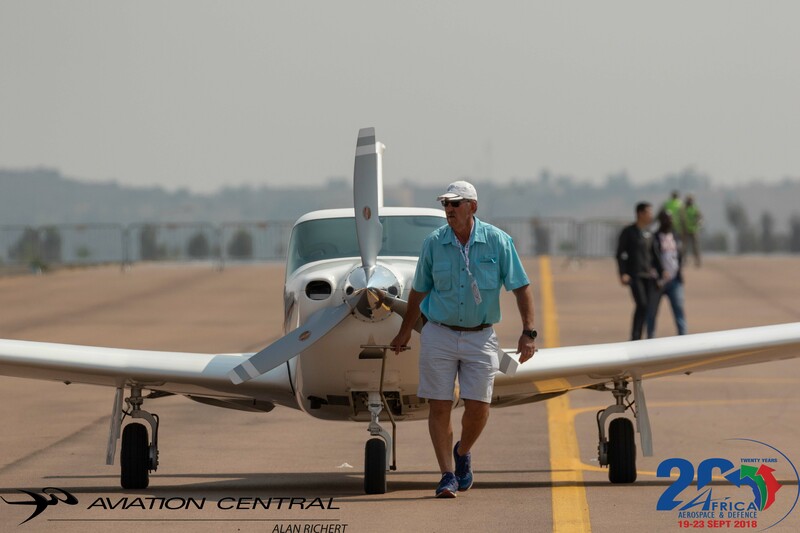 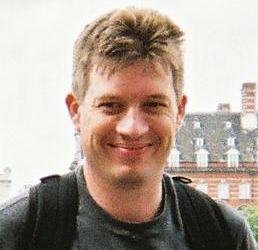 We would like to introduce one of our newest members to the Aviation Central Team, Mr Alan Richert who hails from Hilcrest in Kwa-Zulu Natal. 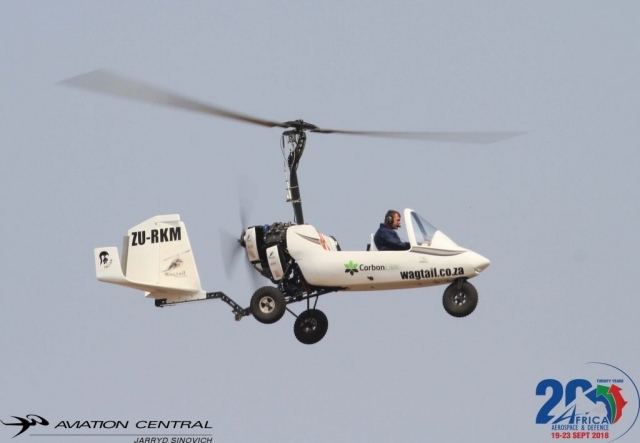 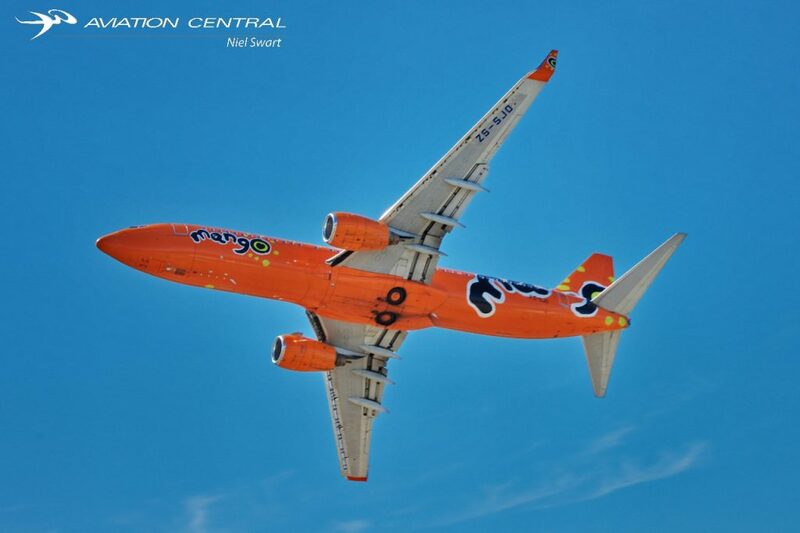 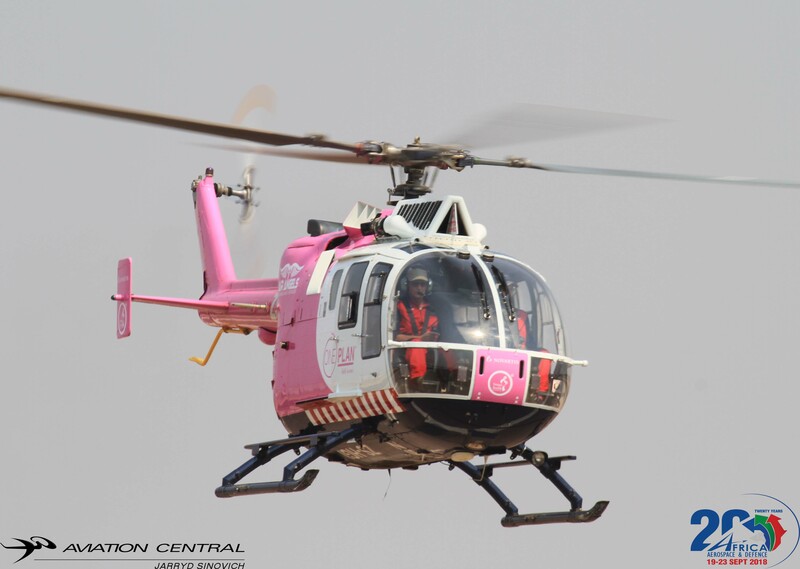 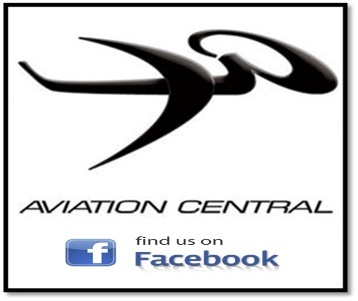 He will be covering the Natal Aviation events with our Aviation Centrals Trevor Viljoen. 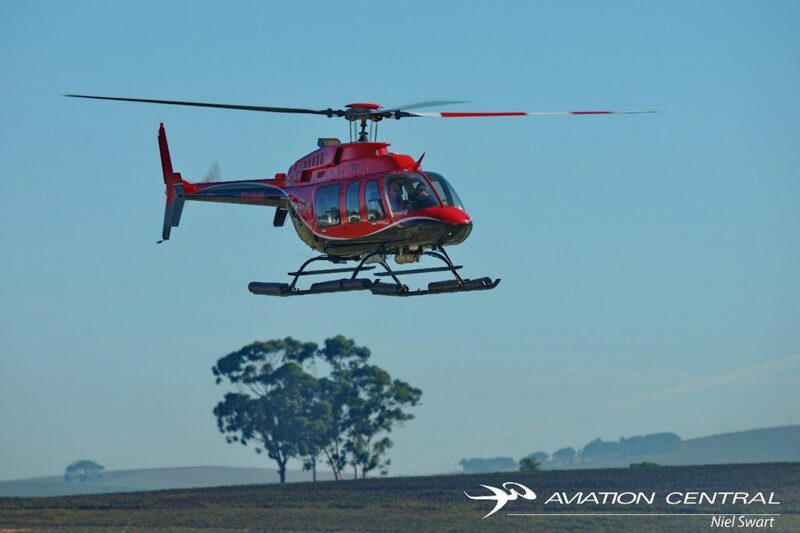 We look forward to your beautiful pictures and reviews Alan! 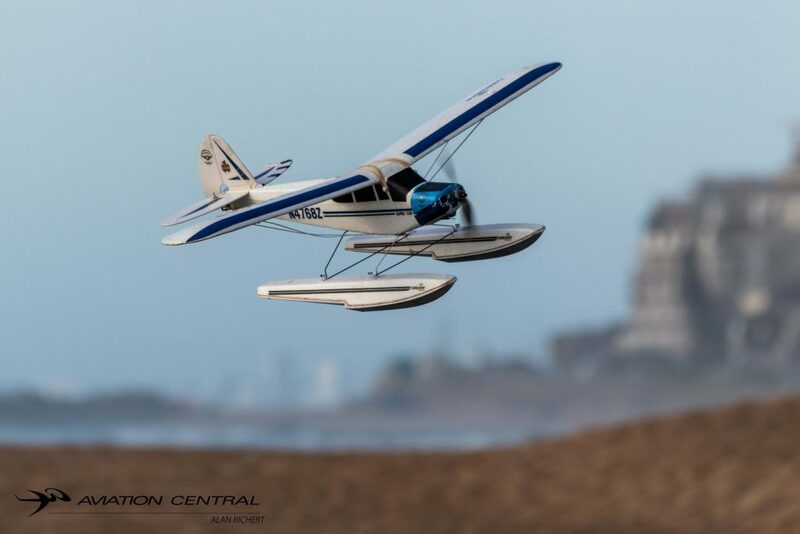 Some pictures from some RC Flying along the coast this past weekend Alan took, while Trevor Viljoen at the controls of the RC Aircraft! 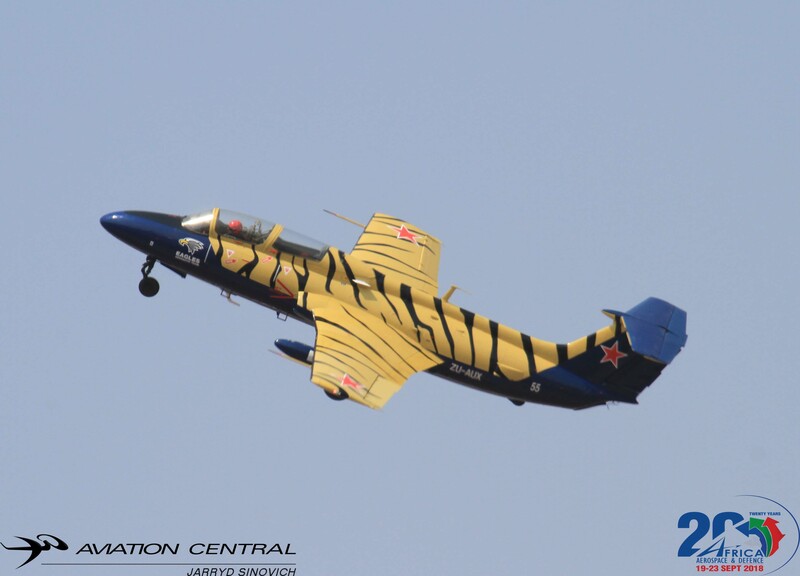 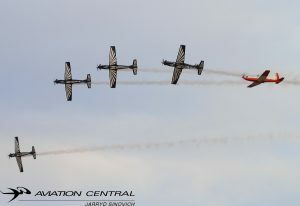 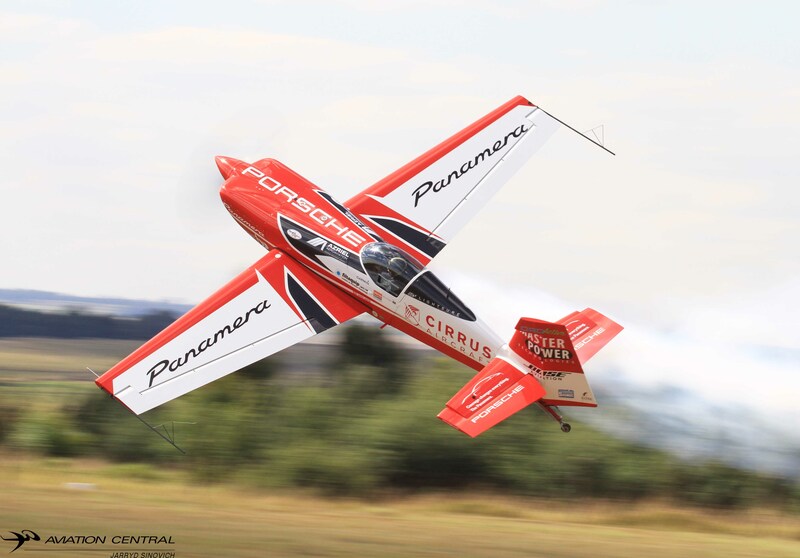 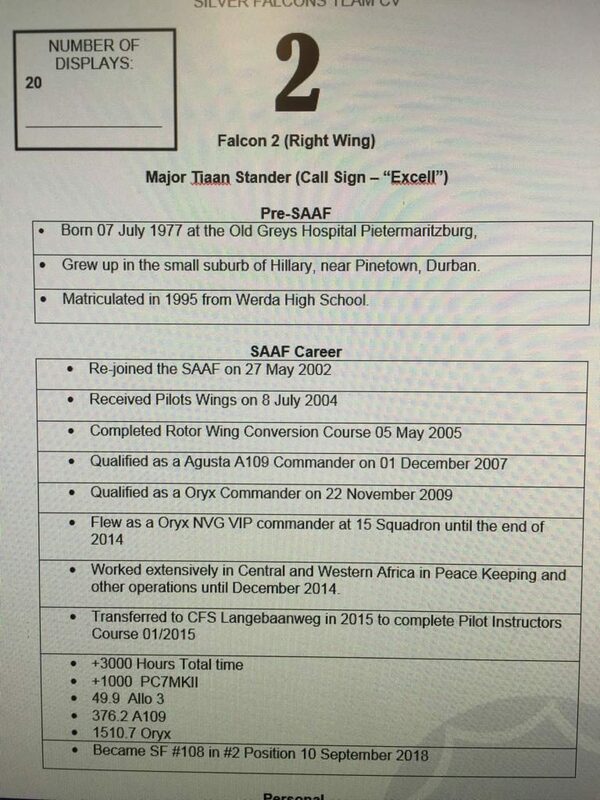 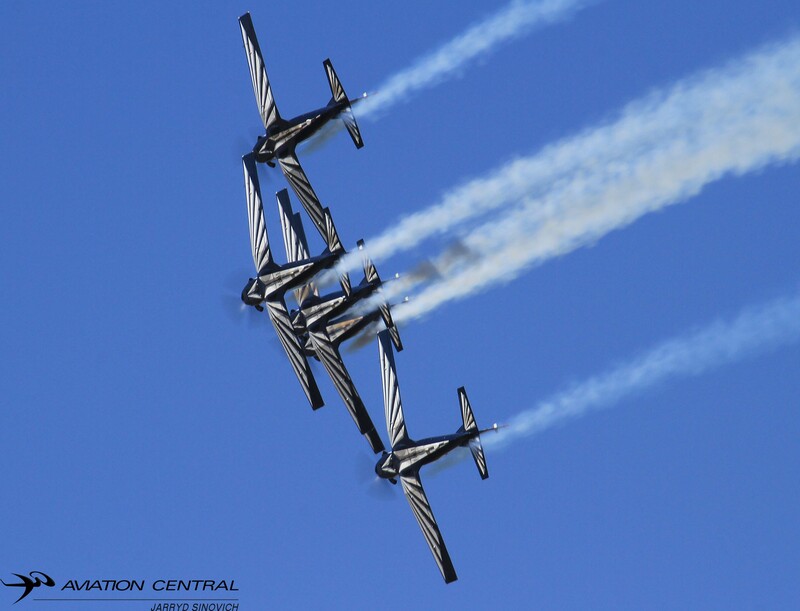 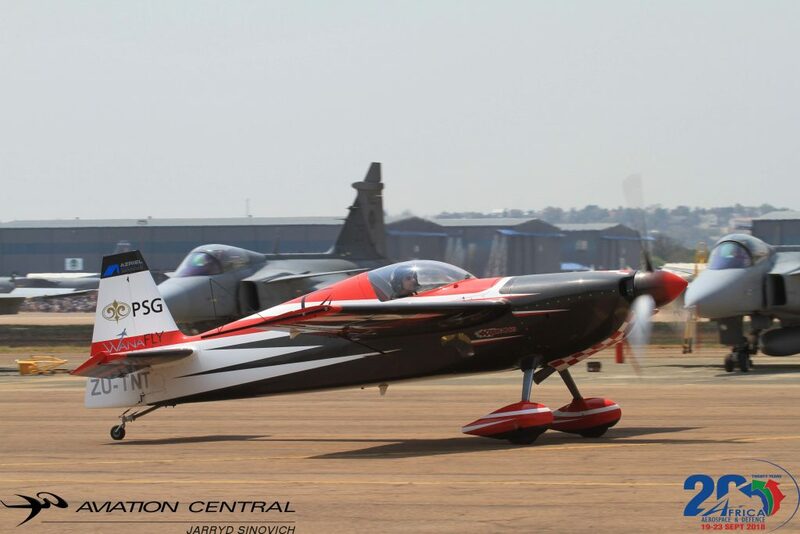 The Silver Falcons Aerobatic Team introduced a new team member to the team, Major Tian Stander became the number two. 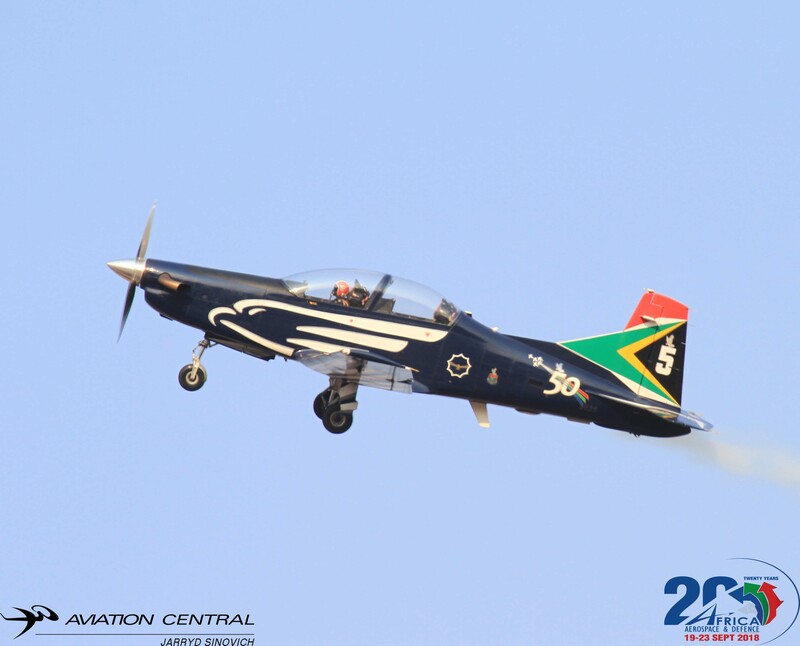 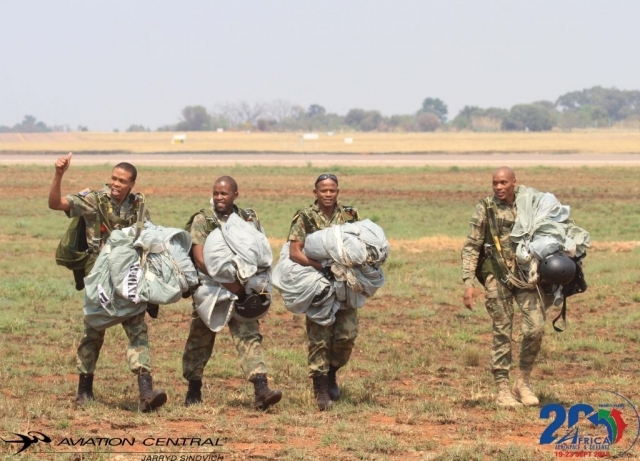 We would like to wish Major Omphile Matloane and the rest of the team a safe 2019 airshow season. 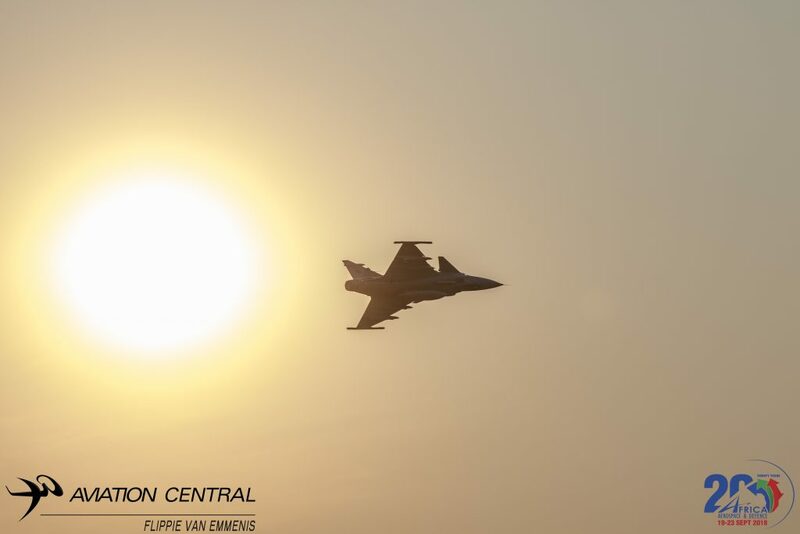 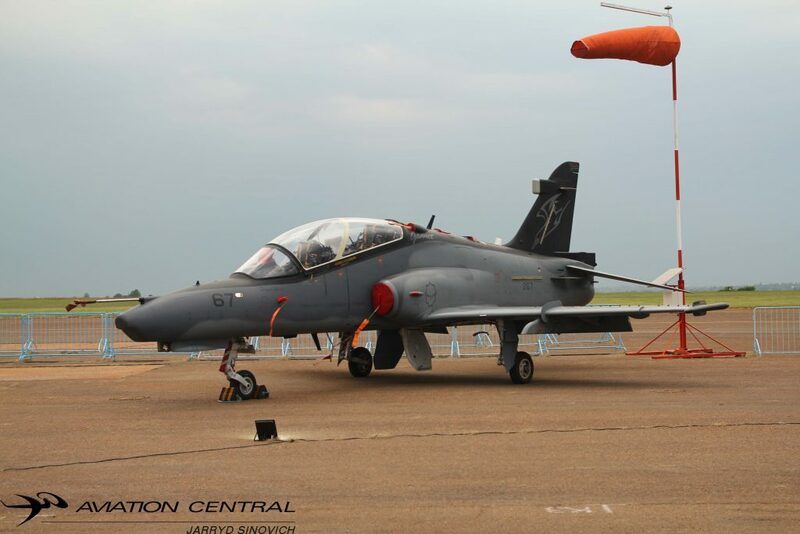 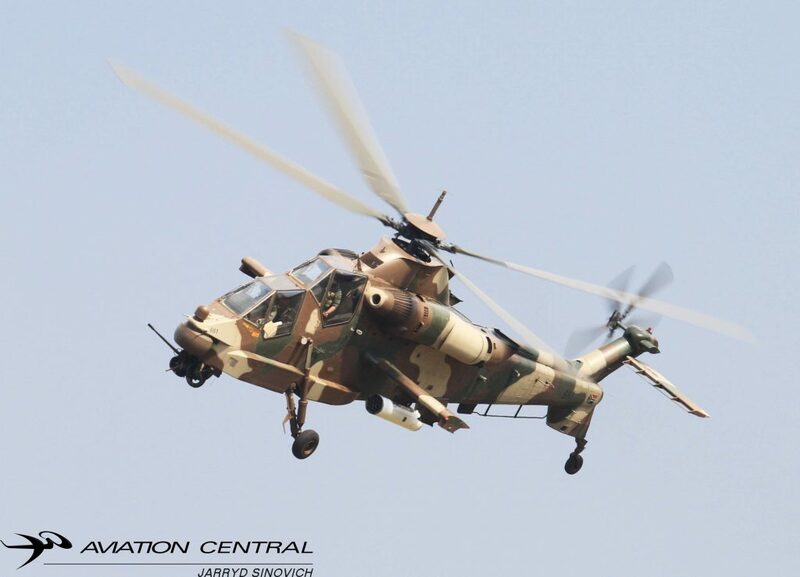 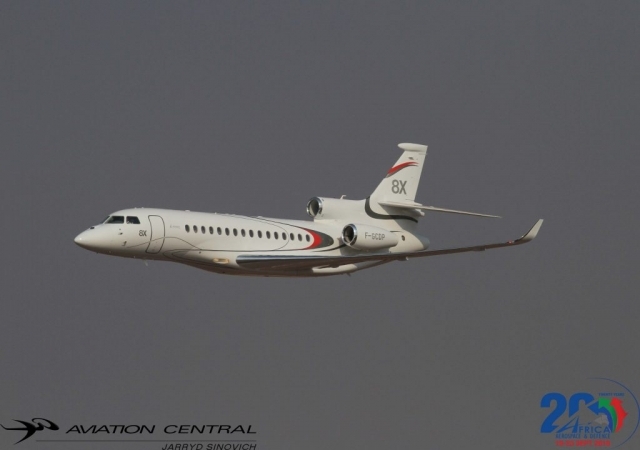 The 10th edition of the Africa Aerospace and Defence trade and airshow has come and gone, what was definitely the most exciting show we all looked forward to panned out to be a great success once again. 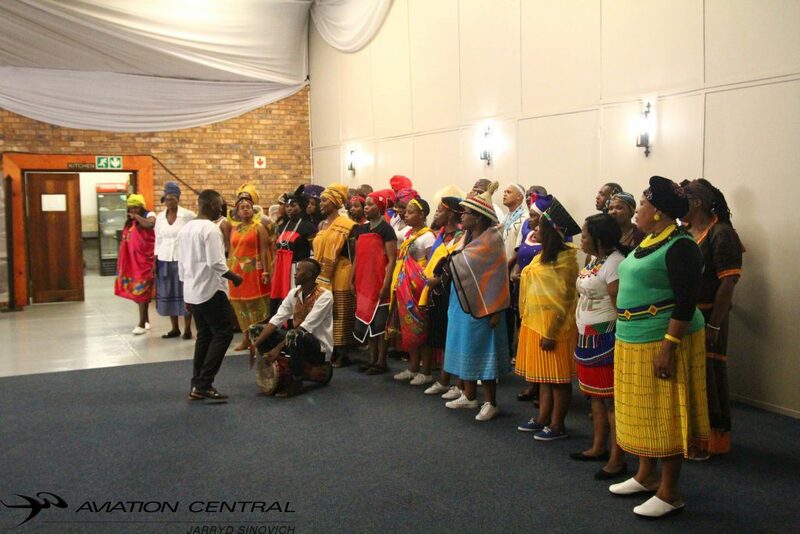 The event took place over the 19th-23 September 2018 at Air force Base Waterkloof, Centurion, City of Tshwane. The apron was full of aircraft and most of the hangers were full of all different companies showing off their technology to the world. 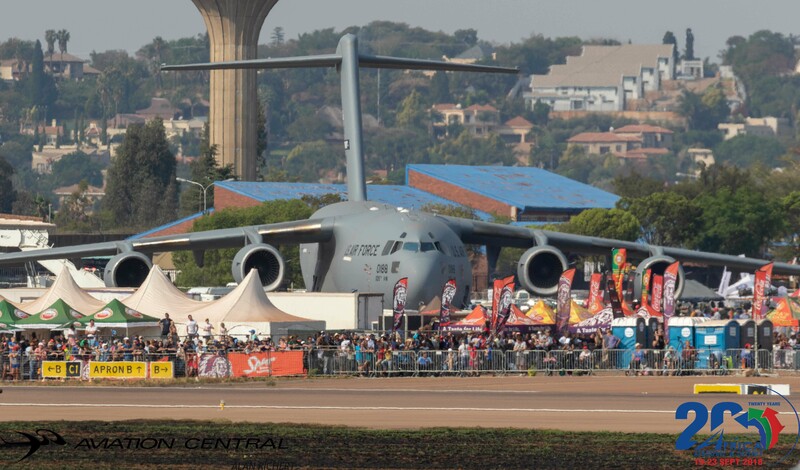 The crowds were kept busy with all the walking through the halls and interacting with aircraft and pilots. 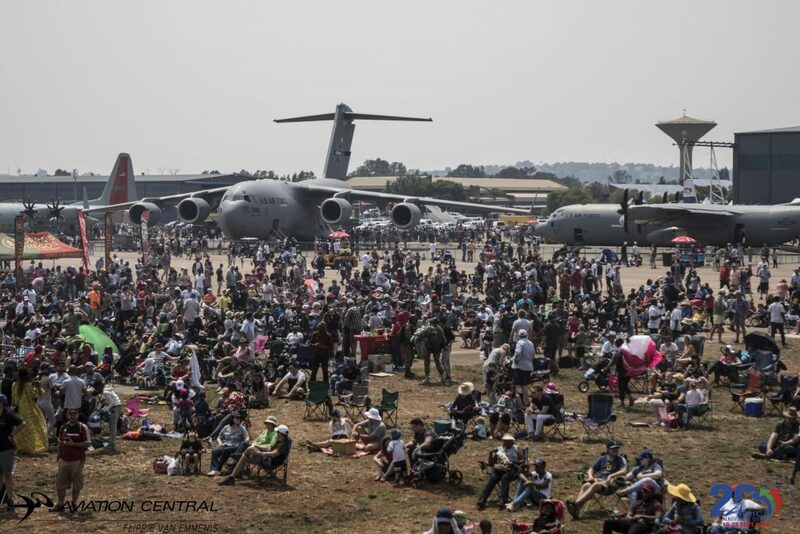 Crowds flocked to the gates around the base from the 22-23 September to get the best seat along the crowd line,this to insure they don’t miss any part of the exiting program Colonel Keith Fryer(flight director) and Keith Andrews and their team put together to excite and show off air capabilities of the South African Airforce (SAAF). 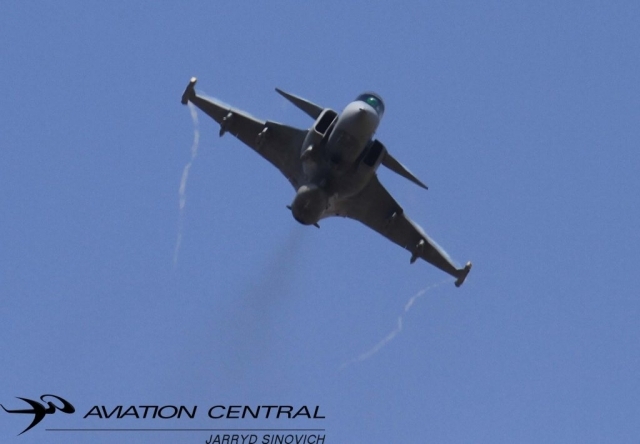 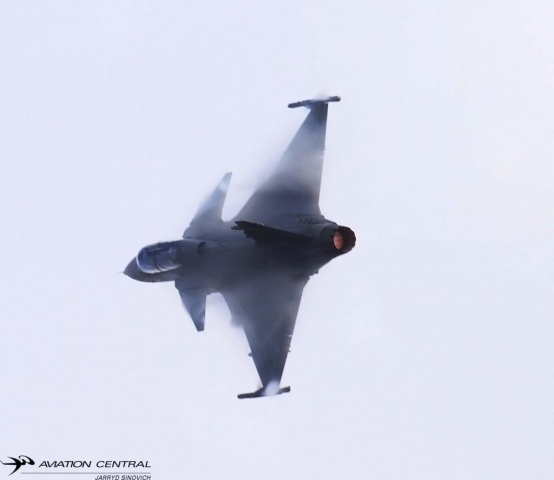 The Saturday show started off with the Sound of Freedom, that been the sound of jets, six Gripens from 2 Squadron and 3 Hawks from 85 Combat Flying School took to the skies and put a formation flypast over the crowds.What a way to start a airshow! 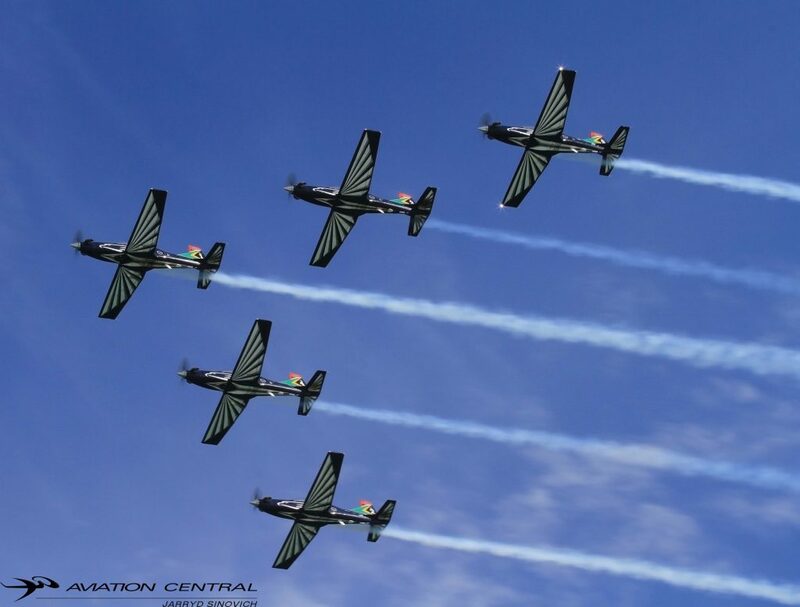 With Airforce Base Swartkop down the road from Airforce Base Waterkloof, Swartkop was used as a second base for aircraft including the new microlight display team known as the Misasa Aerial Display-MAD Team. 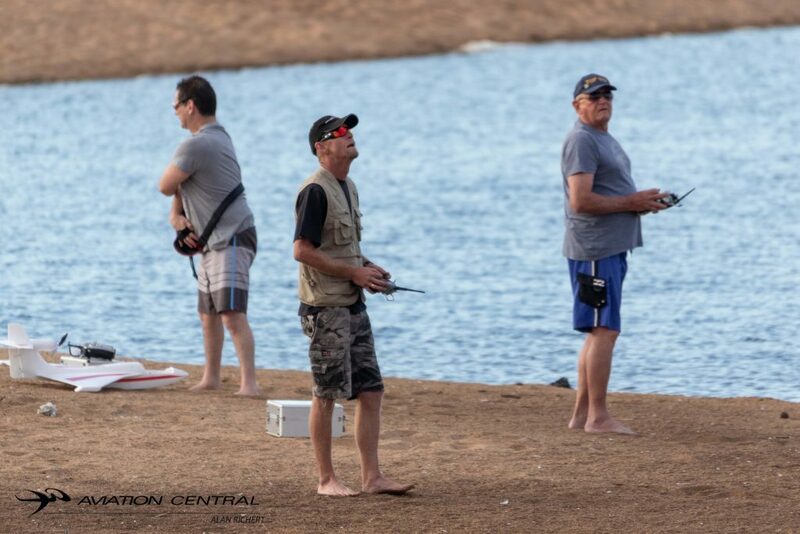 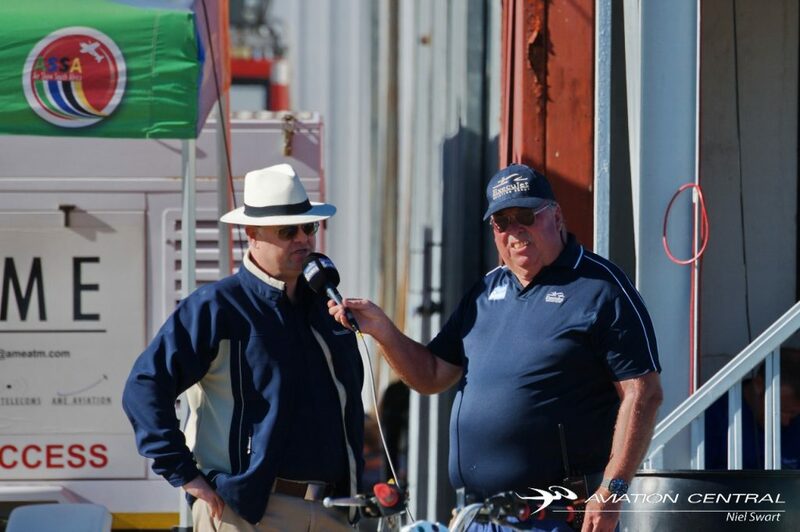 The team is made up of Adrienne Visser as lead, Pieter Kriel at the number two, Gary Heyenreich at number three, Gavin Van Der Berg at four and number five Marius Nel. 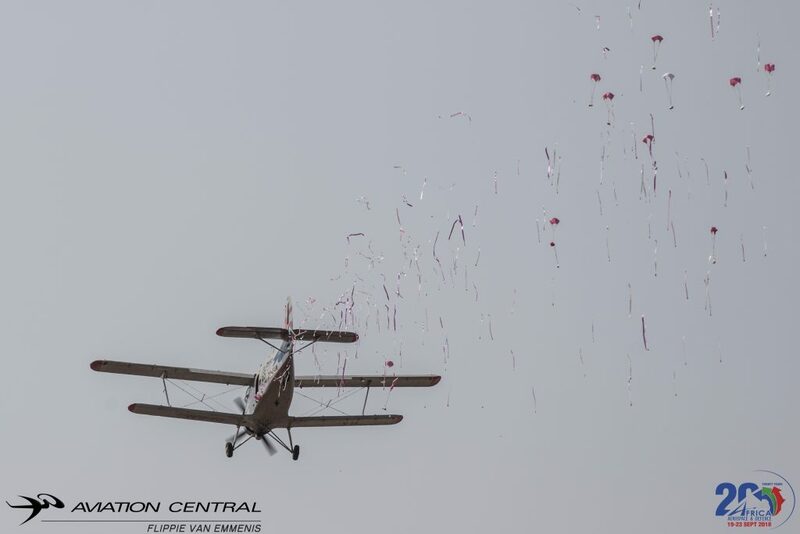 It was great to see a microlight display team after the absence at airshows for some years now,we hope to see them on the regular airshow circuit in the future. 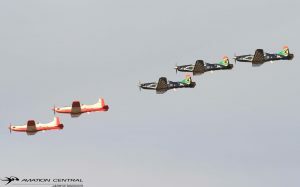 There was a Airplane Factory Sling 4 and a Raven 500 formation Flypast.A mass Bathawk display was put on show, and is shown why its a great aircraft for Anti-Poaching missions.A light sky jeep was also thrown into the formation as well as the wagtail gyrocopter, all aircraft not shy to the African bush! 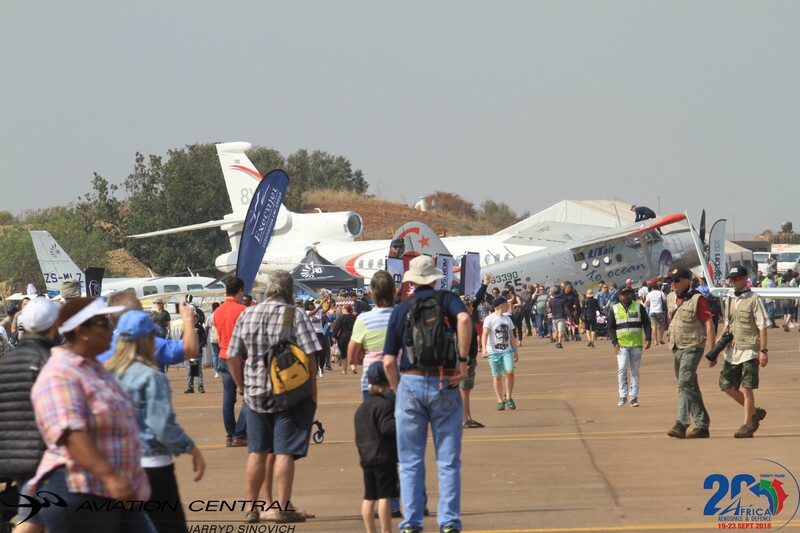 Capital Sounds once again had their ever hard working team at the event and this has to be the longest line of speakers that Capital has at a airshow in South Africa. 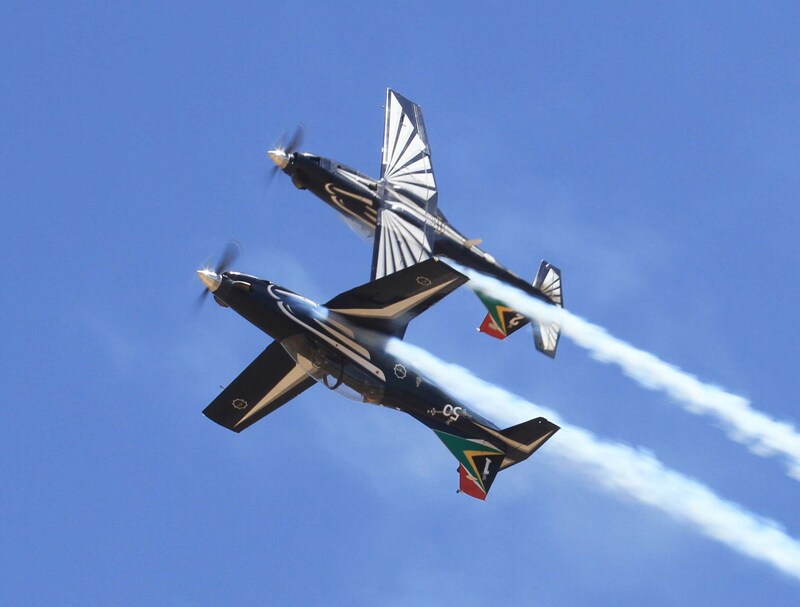 Brian Emmenis and Leon Du Plessis informed the crowd of each aircraft taking to the skies and brought a lot of the airshow vibe to Waterkloof. 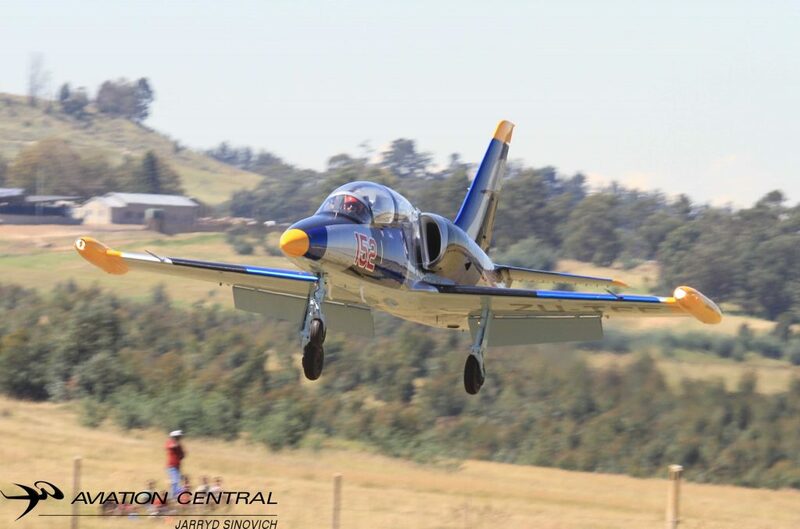 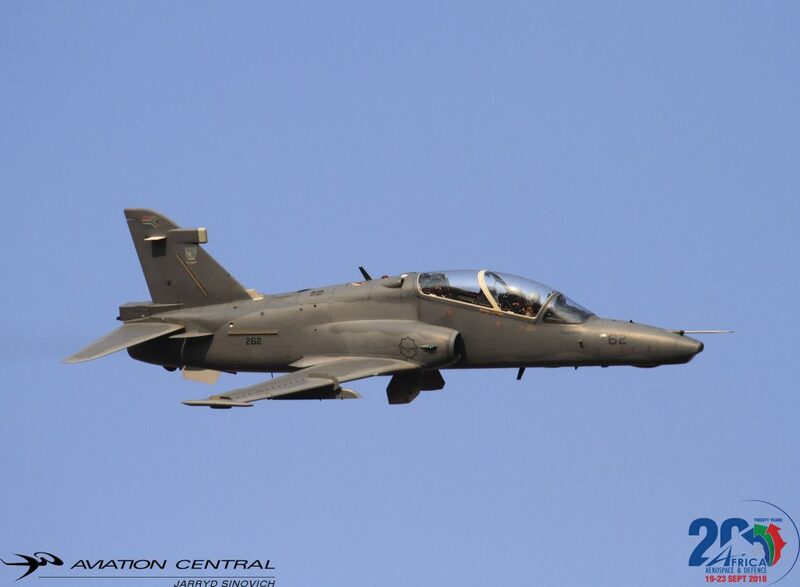 Lieutenant colonel Craig “Shark” Lesson once again did 85 Combat Flying School proud,as he put the Hawk Mk120 through its paces.The Officer Commanding 85 Combat Flying School displayed both one of the Flag Hawks’271′ and one of the grey aircraft during the course of AAD2018.Andrew Blackwood Murray flew his Nashua Extra 300 and Neville Ferriria flew his Slick 540 with a combined aerobatic sequence with high energy aerobatics and low knife edge passes so the crowd could capture the sleek lines on both aircraft. Neville Ferreria had just returned from Hungry where he is flying the Geneavation Aerobatic aircraft for the country. 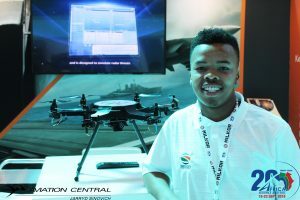 He is surely doing South Africa proud! Paramount Groups AHRLAC aircraft did some tight formation flying and was defiantly a way to show it off to the worlds market of defence. 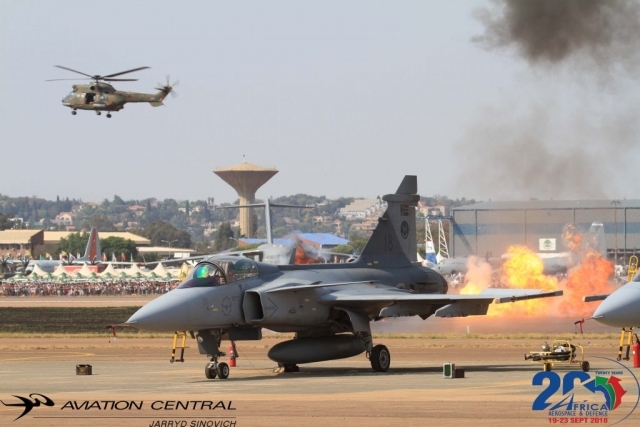 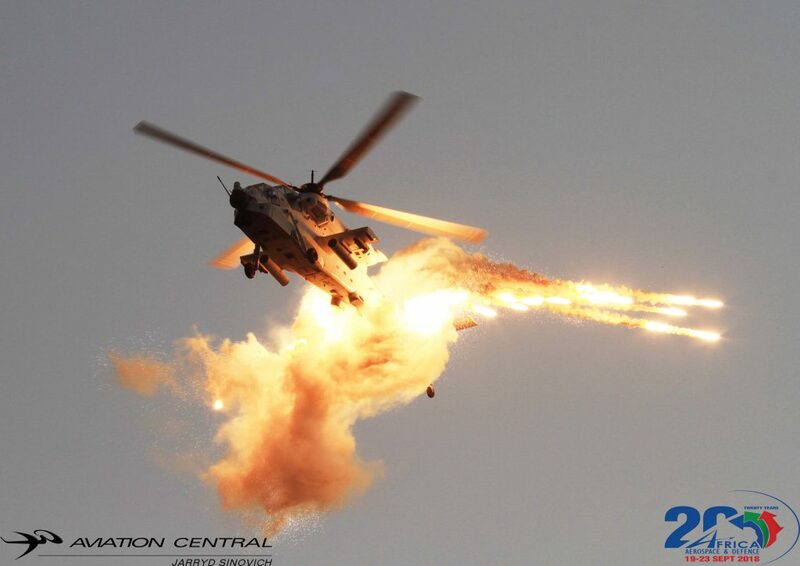 Staying with the locally manufactured aircraft the 16 Squadron Rooivalk was put through its paces in the UN white livery by Major Paul ‘Raccoon’ Kempthorn, at the end of his display he released a large amount of flares,a great end to a display! The Rand Airport based Puma Flying Lions Harvards and Taillifts Cows Pitts Specials flew their usual display infront of the 45 000+ crowds.The SAAF Museum and Harvard Club Harvards and a single Douglas DC4 did a couple of formation Flypasts over the crowd and brought back many memory’s of the former SAAF trainer before the Harvard was replaced by the Pilatus PC7MKII. 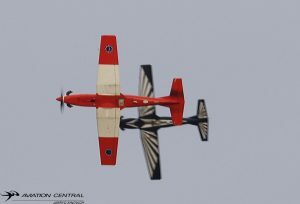 The DC4 then went onto doing a solo display flown by Captain Bill Good. 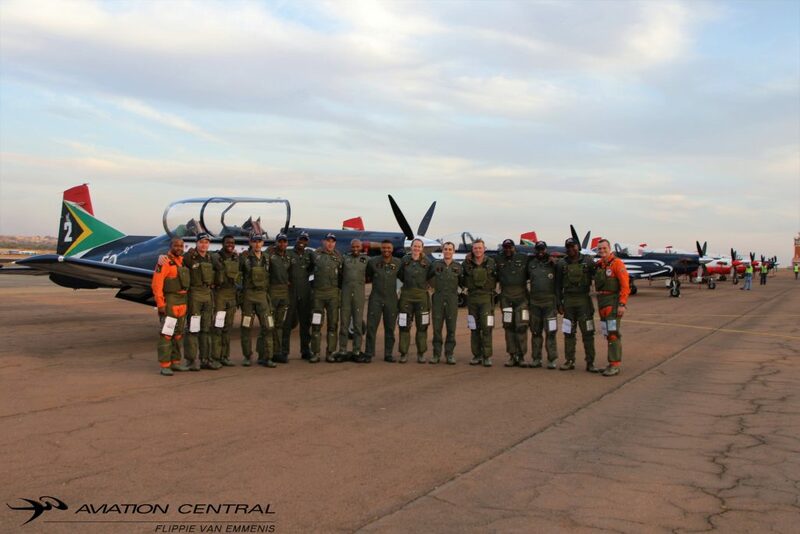 The cockpit ambassadors of the South African Airforce The Silver Falcons Aerobatic Team 82,put on a great display led by Major Omphile Matloane who received his Golden Wings a couple of days before the start of AAD2018.Lt Colonel Glen Wraden flew the Aero L29 from AFB Swartkop, The Airforce of Zimbabwe K8 was also flown with a support CASA 212 on static display. 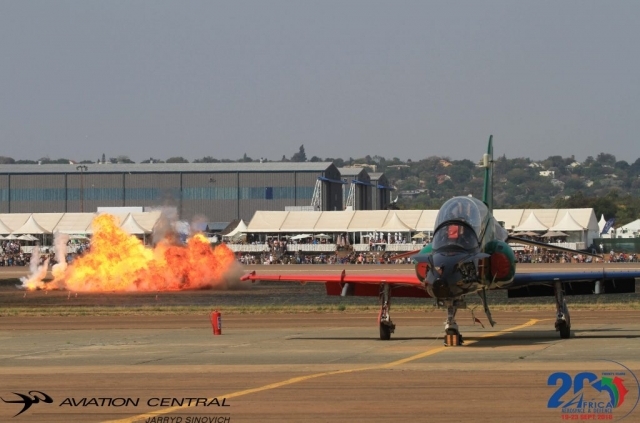 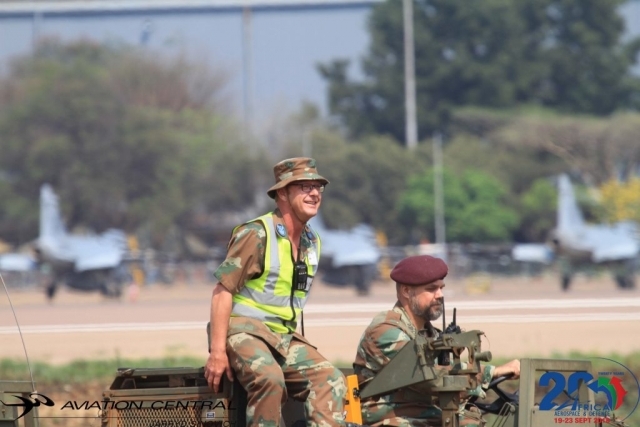 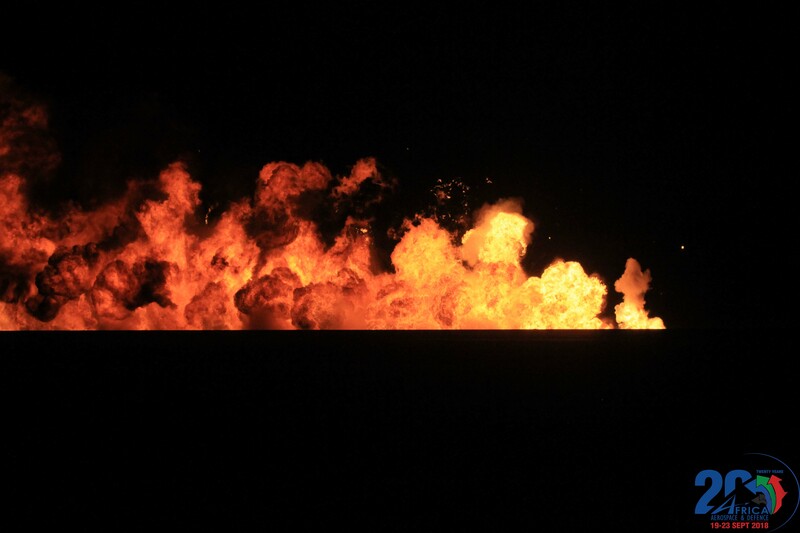 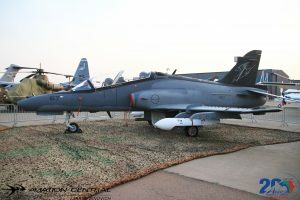 There were two mini-wars on the day of the show,both from the SAAF Museum and from the current SAAF inventory of aircraft.A vast amount of pyrotechnics and armored vehicles were used during the show. 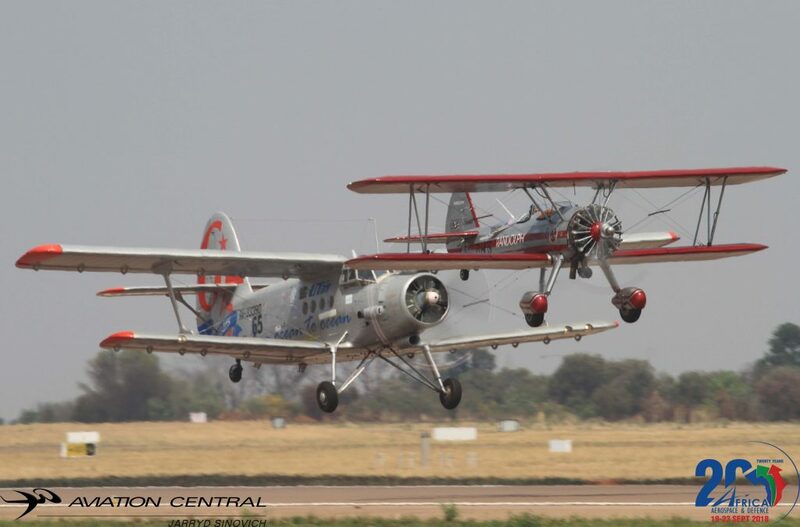 Ivan van Der Schaar and Jon-Marc Hill, Juba Jourbet flew the Bi-plane formation that being a Boeing Stearman and Antonov 2 ‘Little Annie’.Later in the day Little Annie escorted by the Stearman dropped a large amount of Manhattan Marshmellows for the crowds. 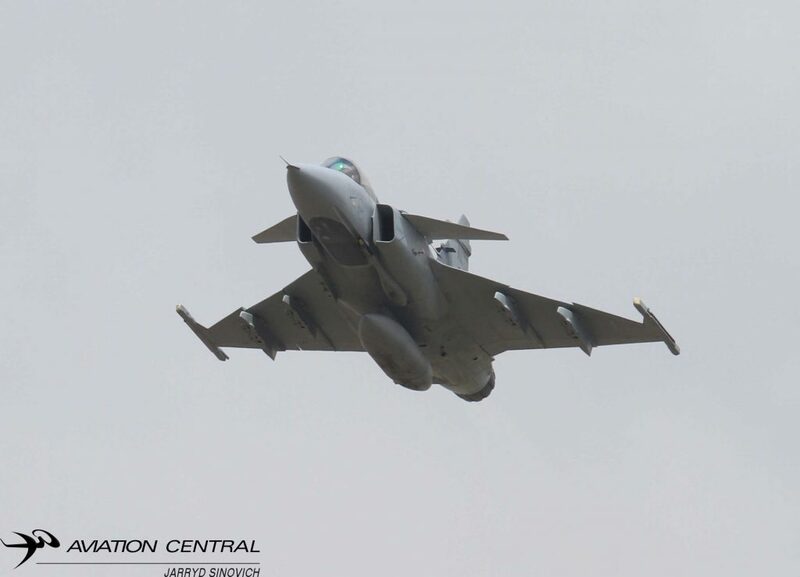 2 Squadron was well represented at the show once again,we were able to see six Gripens in formation,two Gripens in the mini-war and a solo gripen display flown by Major Geoffrey ‘Spartan’ Cooper and a 2v1 combat routine. 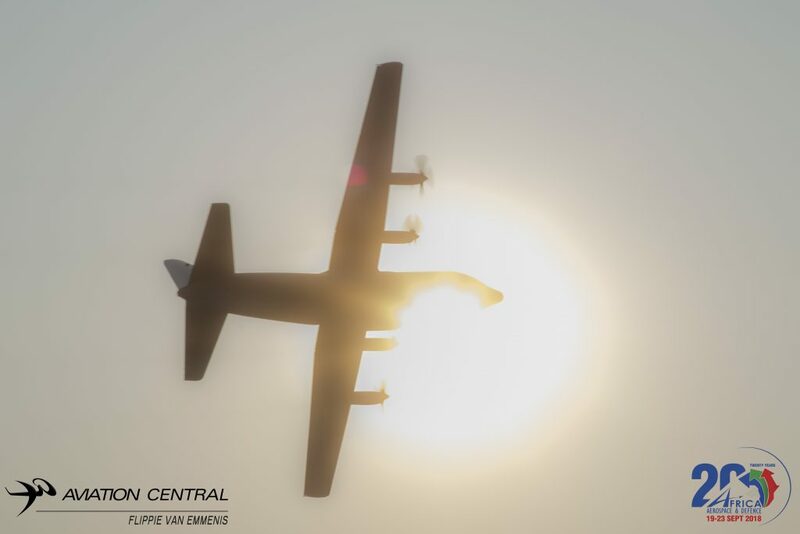 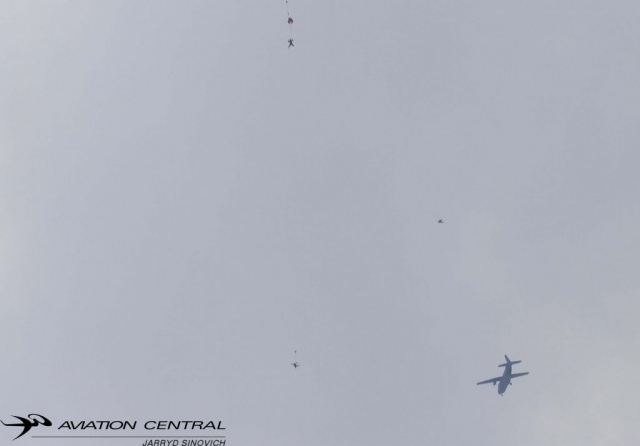 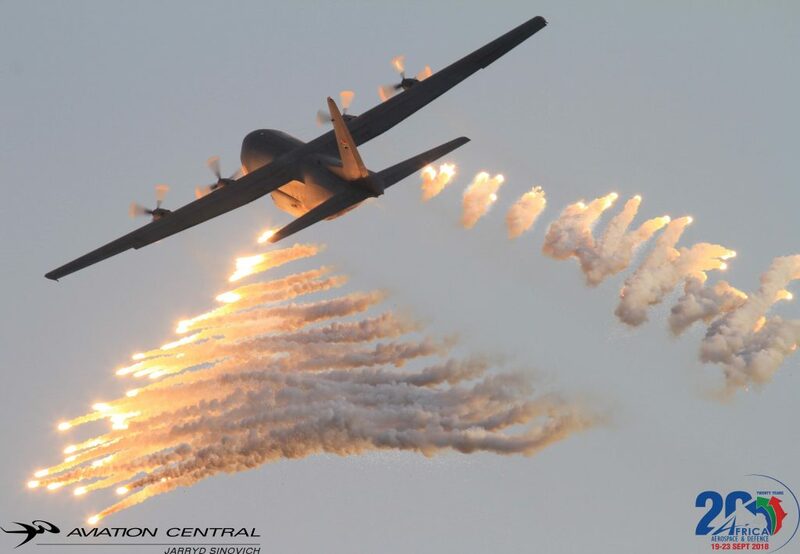 28 Squadron was busy during the mini-war delivering troops into the simulated battle-zone, Lt Col Clint Hawtrey also gave one of the best C130BZ displays to date. What a display it was to witness! 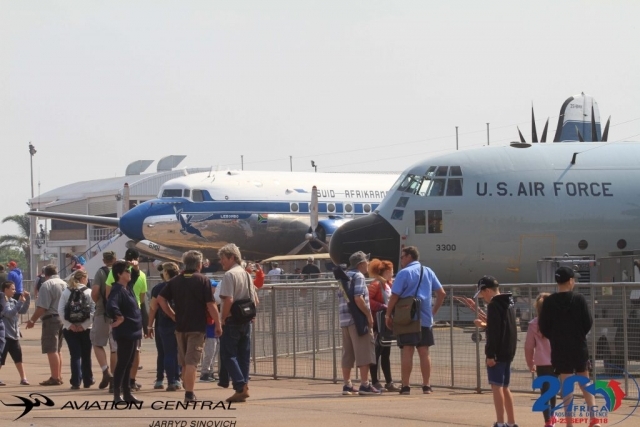 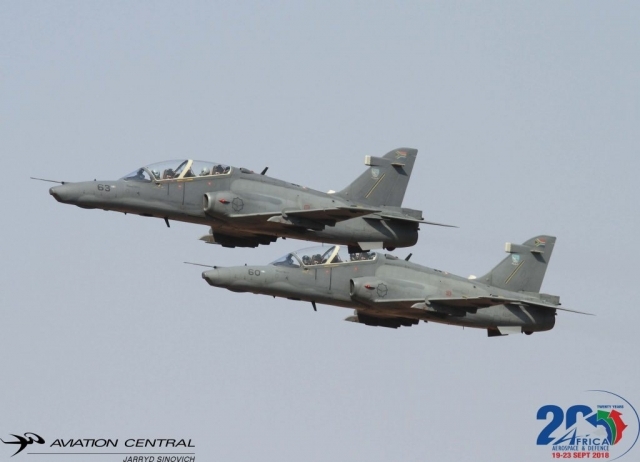 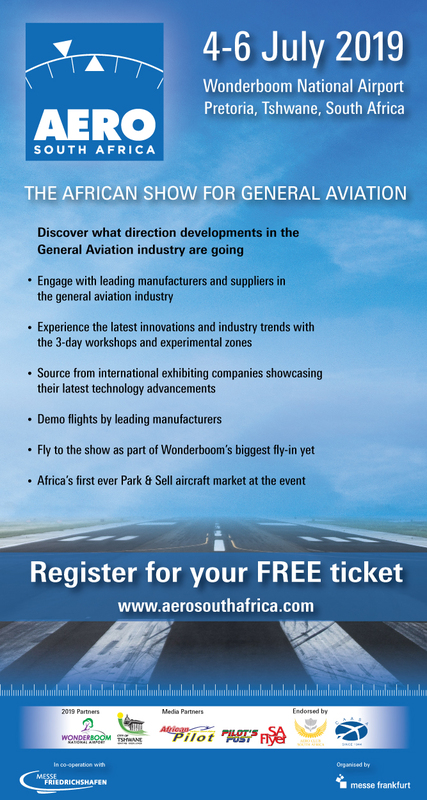 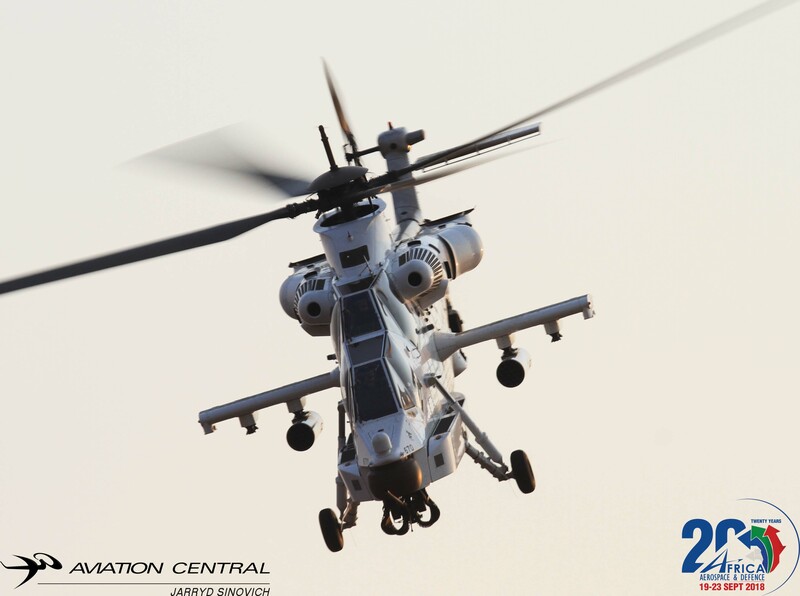 The 11th Edition of Africa Aerospace and Defence, AAD2020, will take place 16 – 20 September 2020. 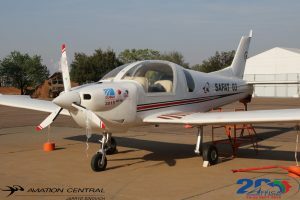 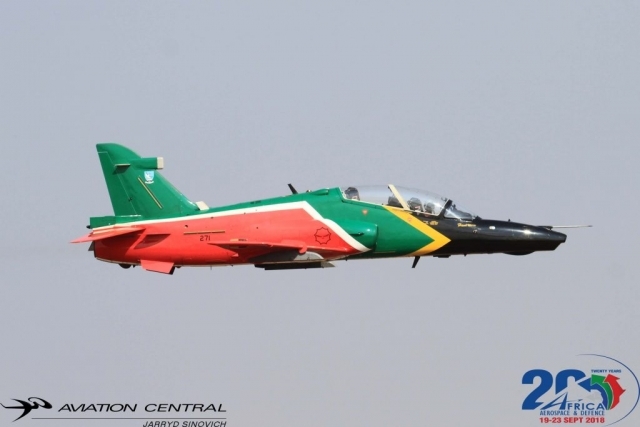 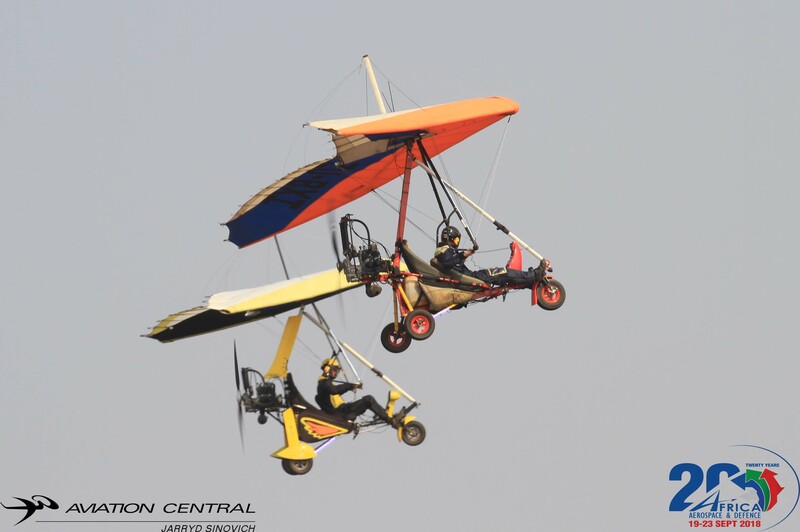 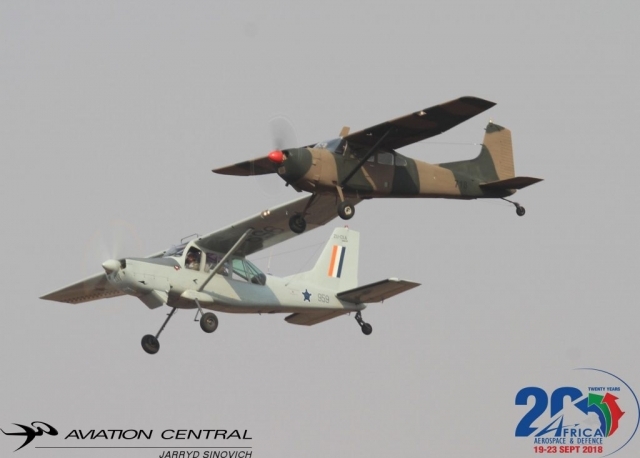 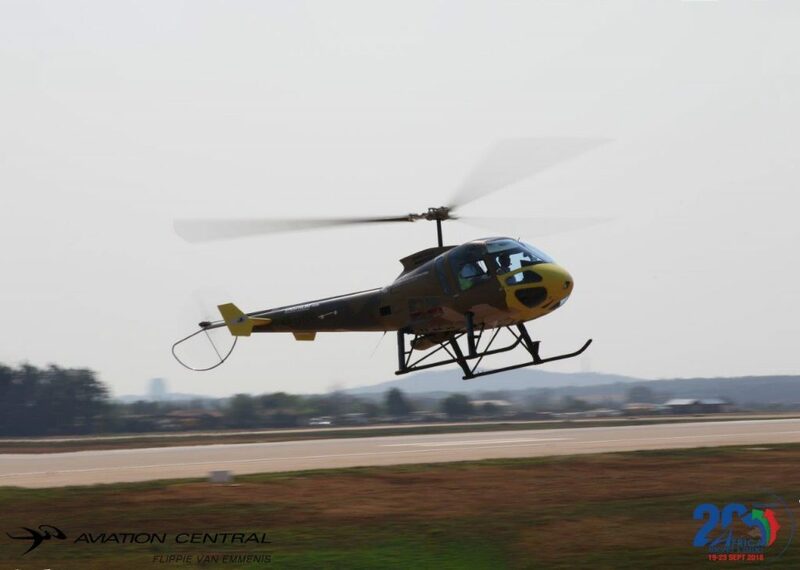 2020 SAAF and the Aero Club of South Africa will be celebrating their centenary birthdays and this creating lots of expectations among young and old to see a Super Show. 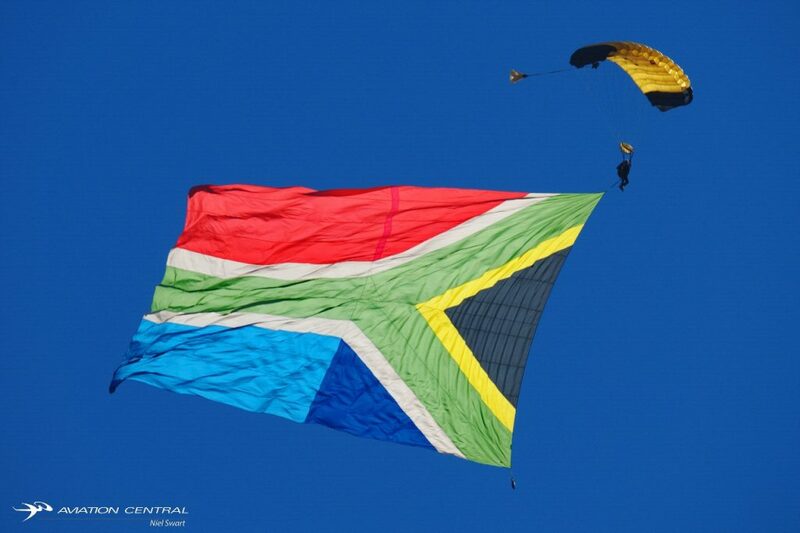 All we can do is wait and see what they deliver and how many Countries except the invite to join South Africa on this centenary celebrations. With the build up to AAD2018,the excitement is building with aircraft arrivals. 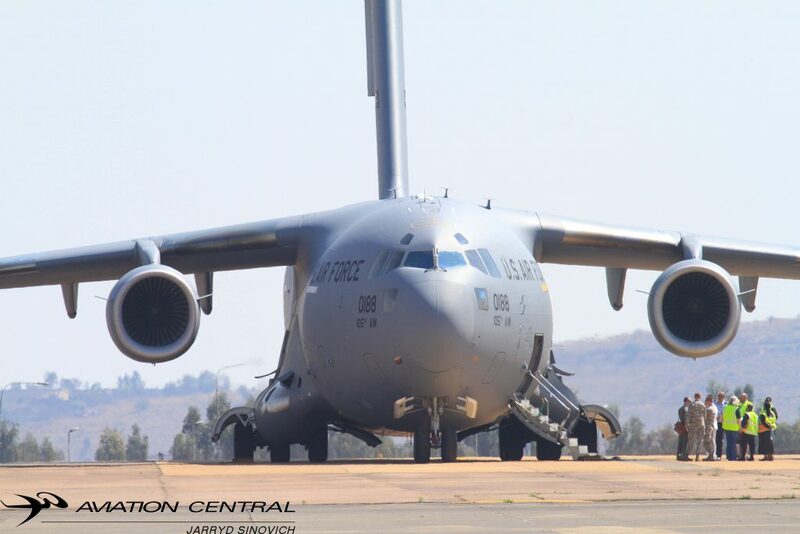 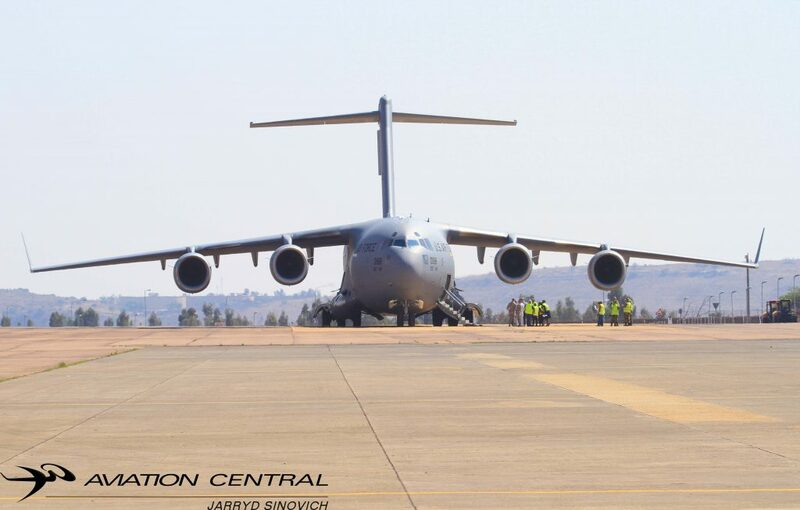 Each day until Tuesday 2018-09-18 we will update on each aircraft arrival to AFB Waterkloof. 2018-09-15 Silver Falcons & Central Flying School Pilatus PC7MKIIs Arrival. 2018-09-16 USAF Boeing C17 Globemaster Arrival. 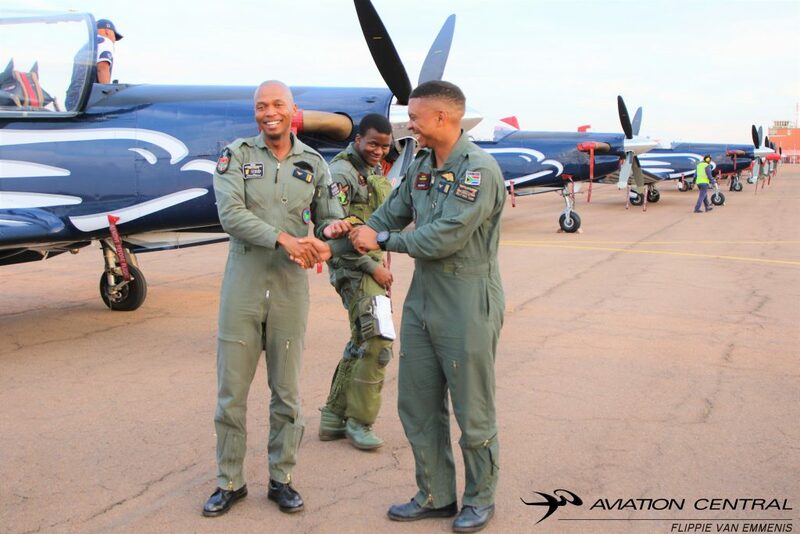 Omphile Mutloane who is currently the leader of the Silver Falcons Aerobatic Team.The team is the official aerobatic team of the South African Airforce, the team is 51 years old in 2018. 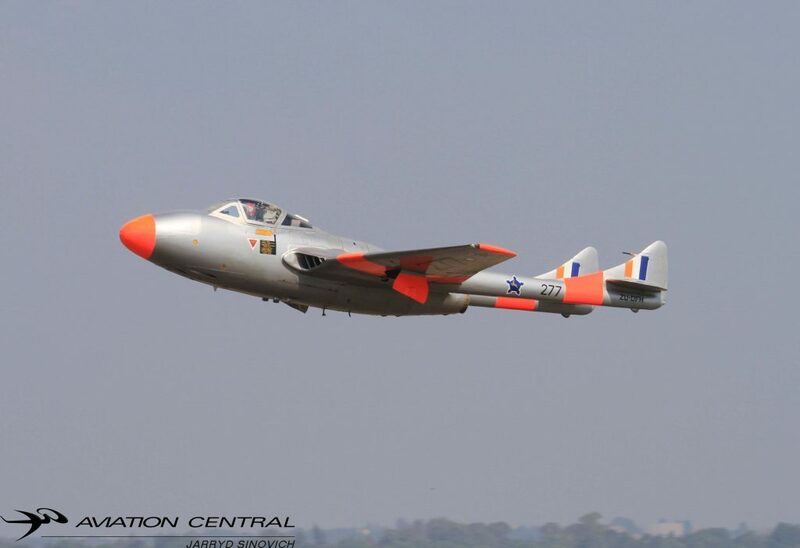 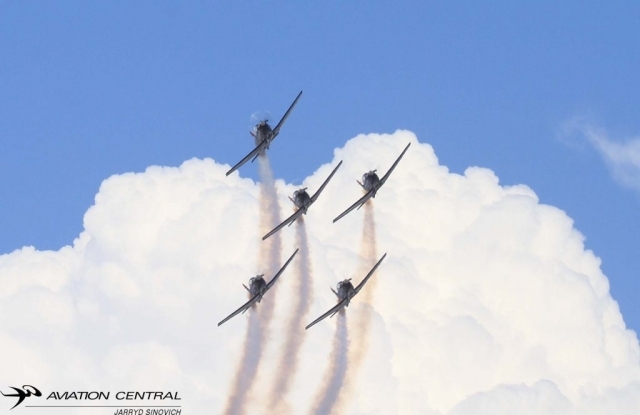 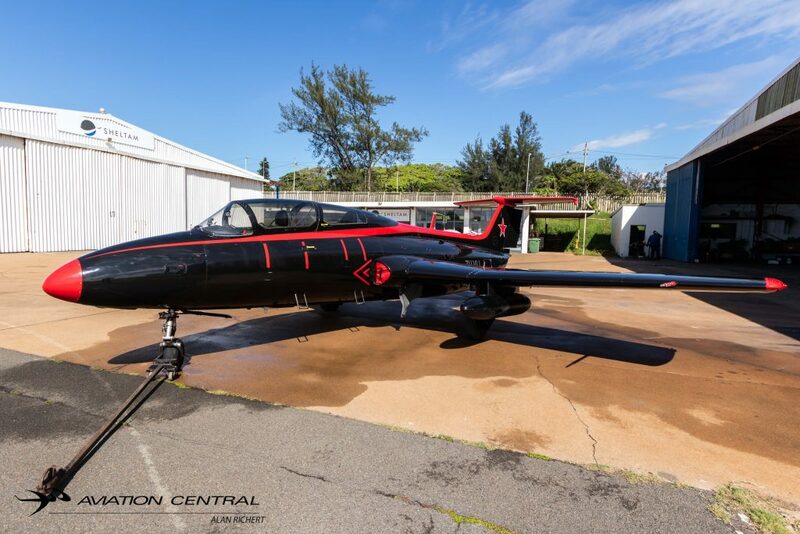 The team celebrated their 50th Anniversary last year with an airshow at their home base at AFB Langebaanweg .Originally formed in 1946 as the Bumbling Bees and flying the T-6 Harvard and then the de Havilland Vampire. The Bumbling Bees flew a 4 ship formation and made a name for themselves by regularly taking part in South African airshows. 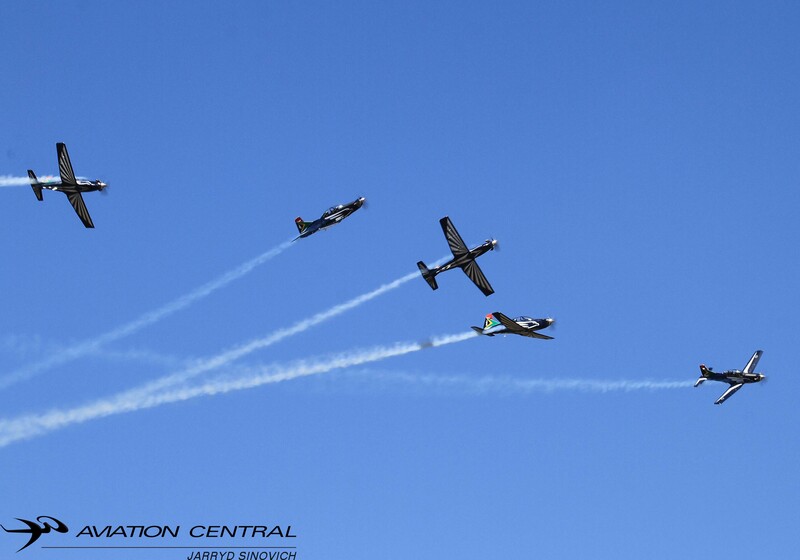 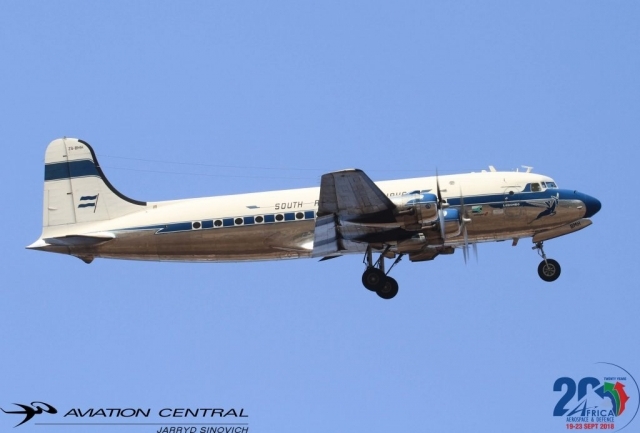 The team disbanded in the late 1950s leaving a gap in South African aviation. 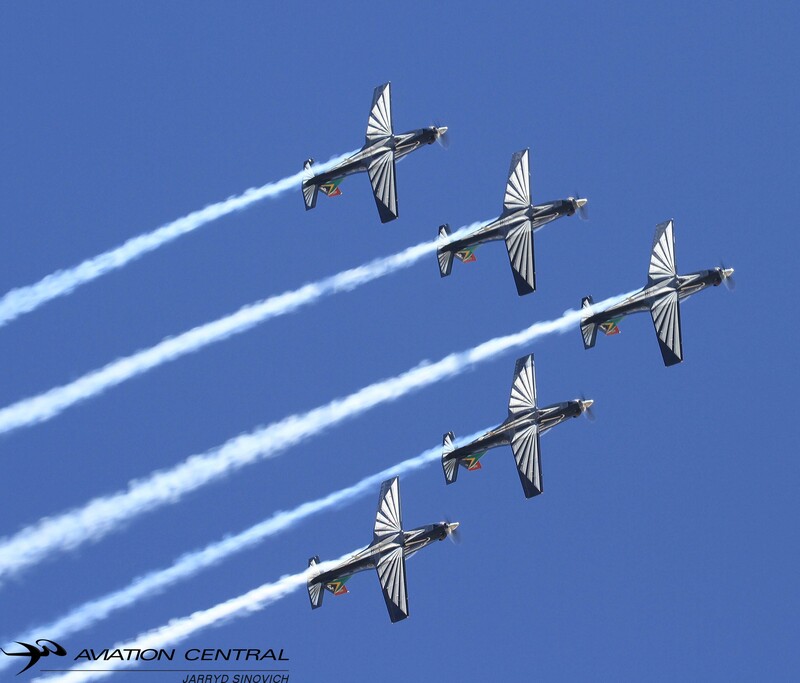 The introduction of the Pilatus PC7MKII in 1995 put the team back to a 4ship and then in 2008 the team went back to a 5 ship and painted in the Silver Falcons livery. 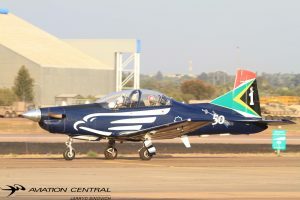 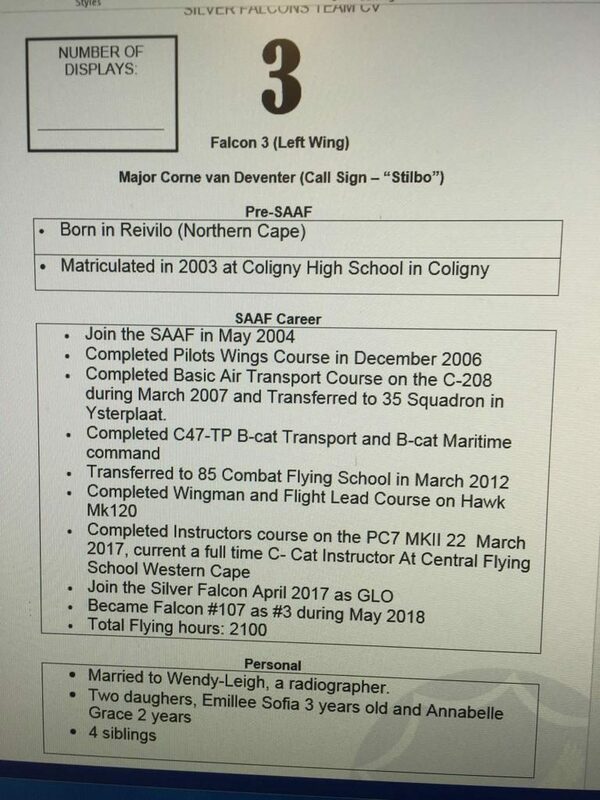 He has flown the PC7MKII,Oryx and Agusta A109LUH during his time in the South African Airforce and is currently a instructor at the Central Flying School down at AFB Langebaanweg. 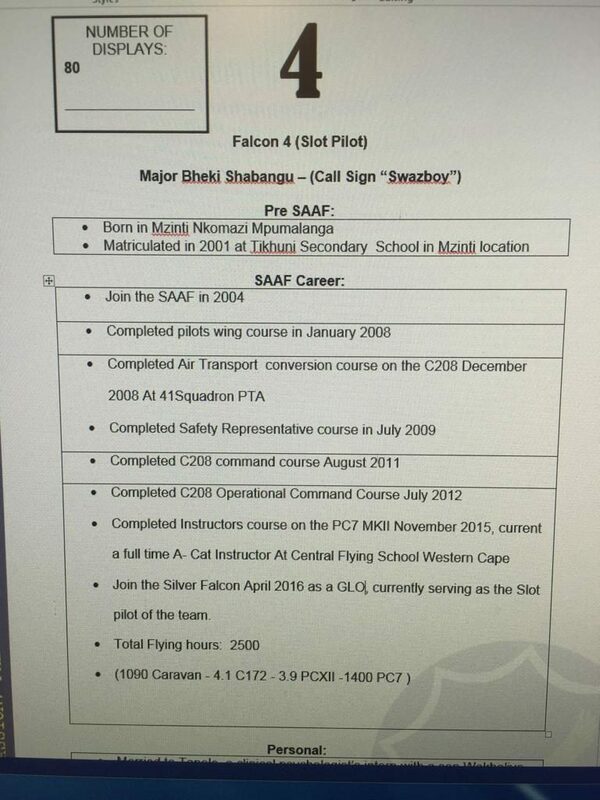 He is also team lead for the famous Silver Falcons Aerobatic Team. 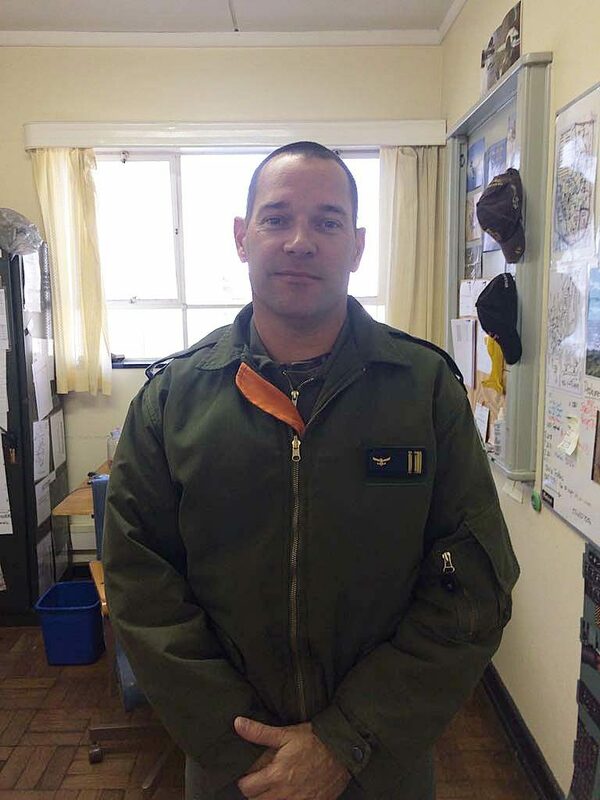 The 15th September 2018,OG earned his gold wings for reaching 2500 flying hours. 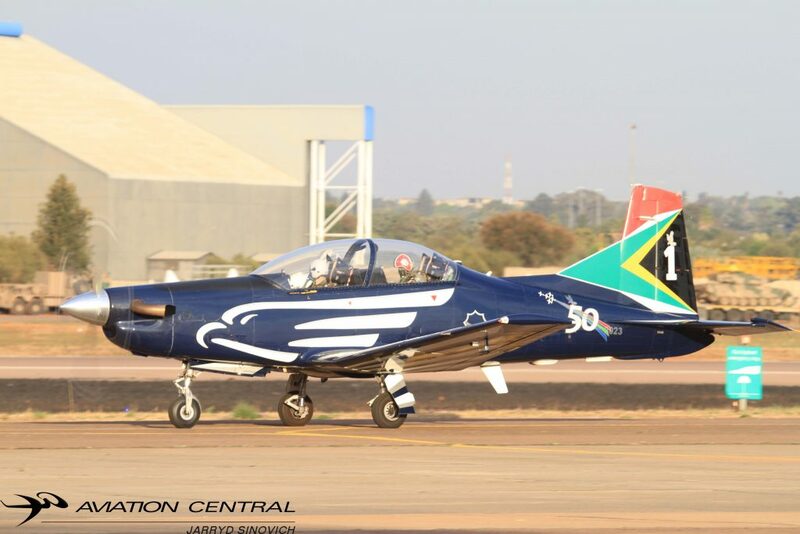 With the arrival from AFB Langebaanweg, on the Capes West coast to AFB Waterkloof with a total of 10 Pilatus PC7MKIIs from the Central Flying School. The Africa Aerospace and Defence Airshow is surely ganna have the crowd on their feet!